In February 2013 I received an email from a really nice lady at the BBC named Sally, she was interested in a story that appears on this website. The story in Question concerned my German friend Egbert's Grandfather Gottfried Sandrock. Gottfried had served with the German Army through WW1 until his death on 1st May 1918, after he died the trunk he had carried with him was returned to his wife in Germany. Egbert now has possession of his Grandfathers trunk and kindly allowed me to tell his story through words and photographs on this website. Sally explained to me that she worked as part of the production team for the TV show " The Antiques Roadshow " and that at Christmas 2012 they had broadcast an appeal at the end of a show for items/stories that could be considered for use in two special episodes of the show to be broadcast during 2014 to coincide with the 100th anniversary of the beginning of The Great War. She told me that a lady viewer had contacted the BBC and gave them a link to the story on this website, suggesting that they may be interested in it. Sally assured me that they were very interested in the story. I contacted Egbert with the news and over the coming weeks a steady flow of emails between myself, Egbert and Sally took place and it was agreed that the story would be used on the show. Sally flew to Germany to meet Egbert and see the trunk, then arrangements were made for us to travel to France at the end of July. On 30th July I met the Coach in London that was taking me and the other contributors over to France, also on board were three of the experts from the show, Egbert was driving from Germany. Off we set for Folkstone, onto the train that takes cars/coaches then across France towards the Somme. I must say hello to Sean our coach driver, a very nice and funny guy, and to Suse from the BBC who came everywhere with us and looked after us all. As we moved along the motorway near Arras we could see the huge Canadian Memorial in the distance at Vimy, my Great Grandfather had fought there in 1917. Isolated cemeteries in the farming fields began to appear every so often, then as we neared the Somme area the cemeteries and Memorials came at a fast pace. 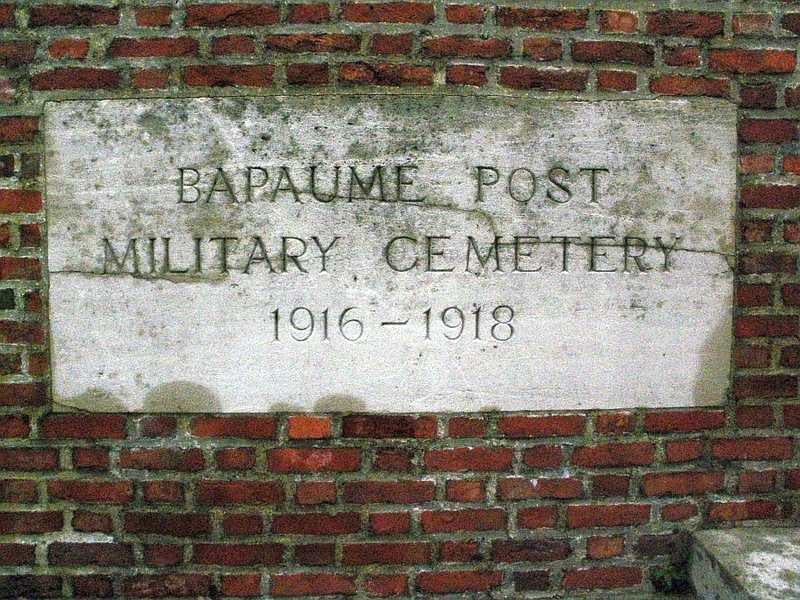 We arrived at the hotel around 7.30 pm and I just had to go and visit the nearby Bapaume Post Military Cemetery, it had rained all day and I got soaked, on my return to the hotel I met Egbert for the first time. The BBC had laid on a welcome meal for us all and their whole team came along to say hello and explain the following days agenda. It turned out that Egbert was not on the early filming list so he suggested we meet early the next morning for breakfast then head out to a few of the WW1 sights in his car, this is what we did and the photographs of the day follow. During the meal we sat with a real nice couple from Kent named Cathy and Richard, It turned out that Cathy had a relative from Liverpool called Robert Newton ,who died in WW1, while Richard was been filmed talking about photographs a family member of his took during his service on The Somme. We have kept in touch since are return. I must say thank you to Egbert and the BBC. Without Egbert driving me around in his car and explaining many things about the battles that took place in this area then I would not have had very much to show on this page, so Thank You Egbert, you should be a war guide my friend. Thanks also go to the BBC who looked after us all so well, nothing was ever a problem to them, from the Presenters, Experts, Producers to the Cameramen, make up and food people, they were all so nice and charming and made the experience a great one. I hope the following photographs and information are of interest to the reader. Please remember the sacrifice that was made by those on all sides. 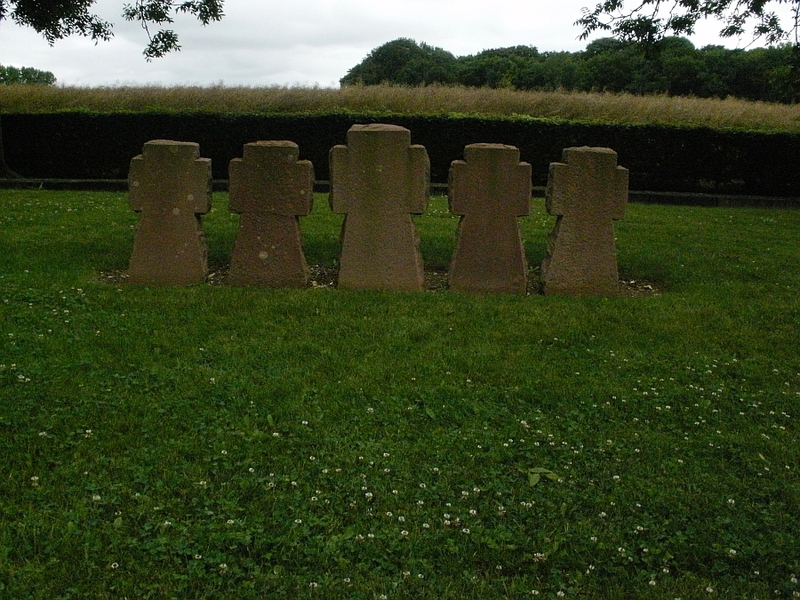 The German cemetery at Fricourt. Notice the five crosses on the sign post. 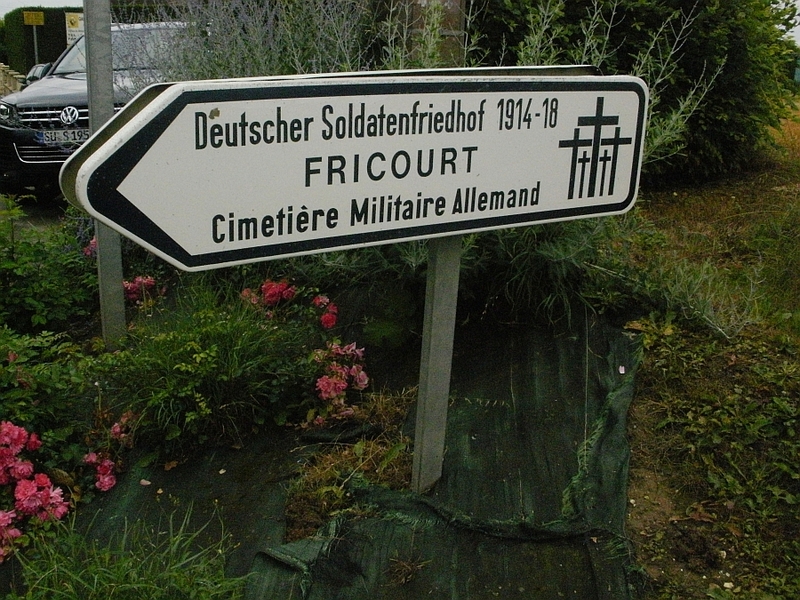 The French began work on Fricourt Cemetery in 1920, bringing in the bodies of German servicemen from many cemeteries, towns, villages and battlefields in the Somme area. 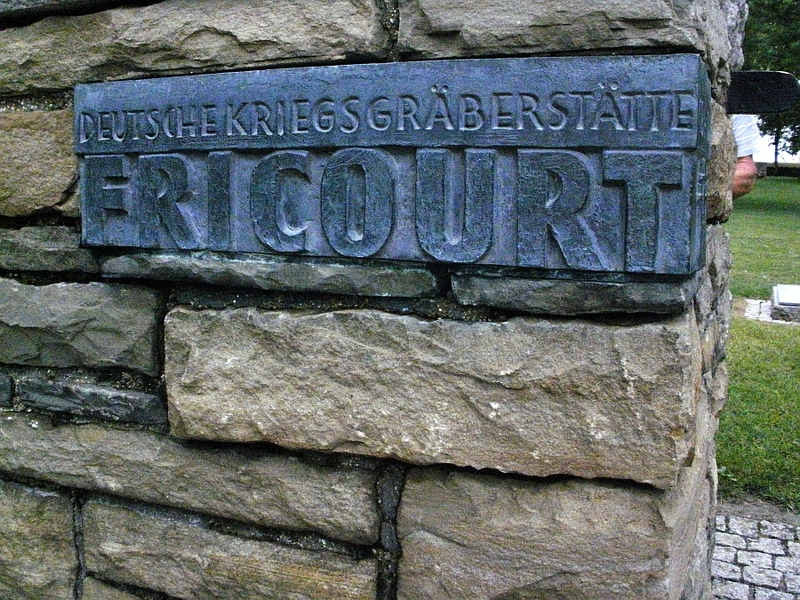 Fricourt is one of 3 major German concentration cemeteries in the region, Vermandovillers and Rancourt being the others. 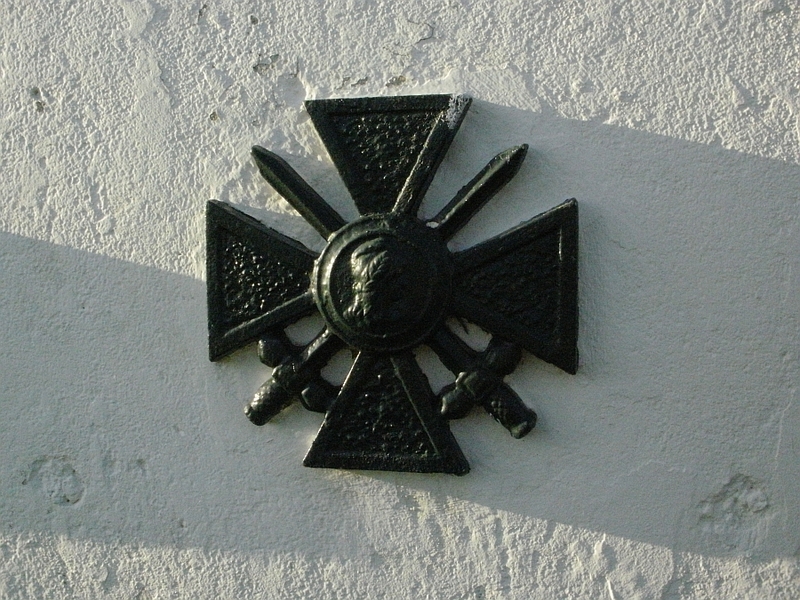 The German cemeteries are tended by the Volksbund Deutsche Kriegsgräberfürsorge ( VDK ) Roughly translated it means " people's association, care for German war graves " Their symbol is the five crosses, note them on the cemetery gate above and on the signpost for Fricourt cemetery. The VDK were given control of the cemetery in 1929. They laid out the landscape and built the entrance. In 1939 WW2 stopped further work, and it was not until 1966 with the passing of the Franco-German Agreement that the VDK were able to return. Today they tend the Cemeteries through contributions and volunteers. 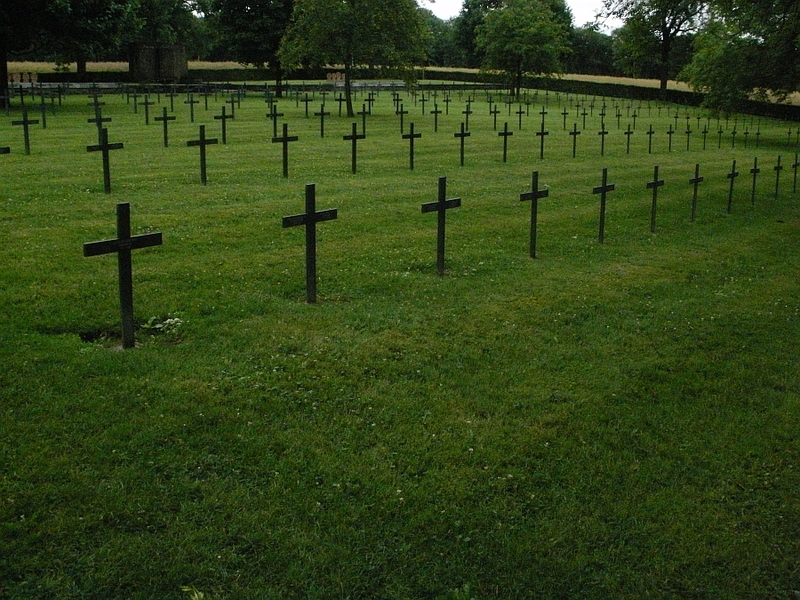 The Iron crosses, most carry the names of four men who are buried individually side by side. 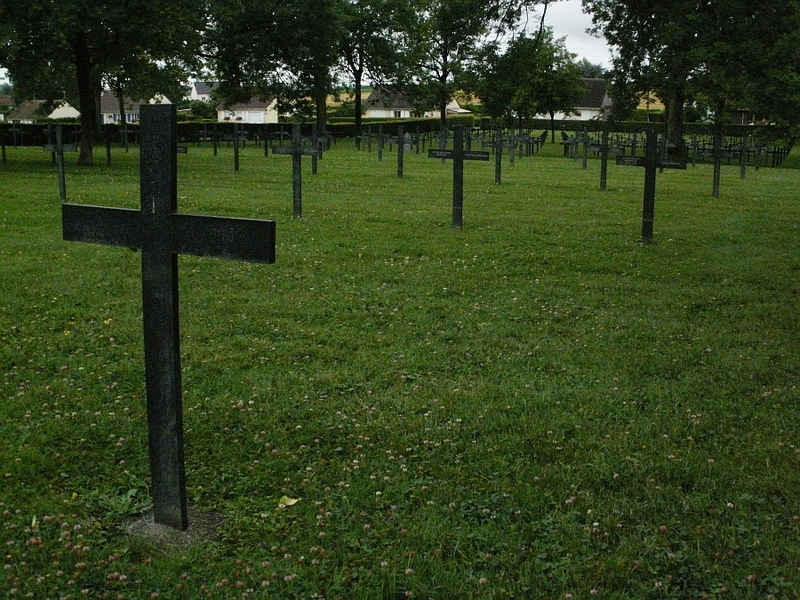 These Iron crosses standing in a concrete base where erected in 1977 to replace the earlier wooden crosses. 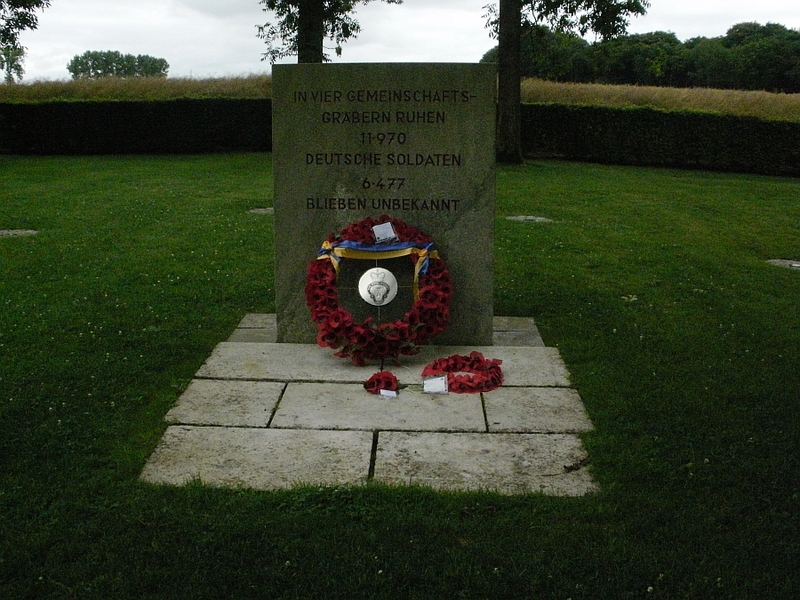 One of the 14 headstones marking German soldiers of the Jewish faith. 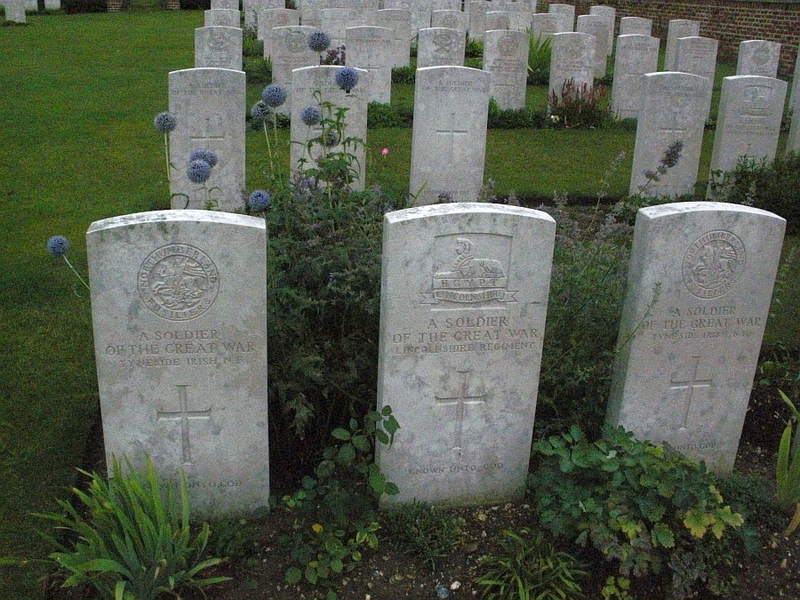 The hebrew inscription reads " Their soul may be enwoven into the circle of the living persons "
The Gemeinschaftsgräber ( Comrade graves, Kameradengräber ) pictured are two of the four that are in the cemetery. They hold the remains of 11,970 men, of whom 6,477 ar unknown. Metal plaques list the names of those known to be buried here. 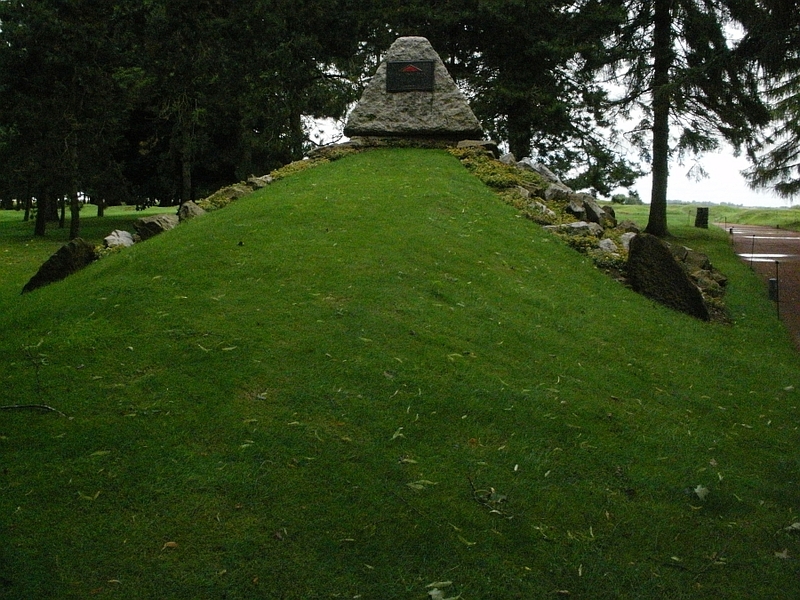 The communal grave memorial. It was moving to see the poppy wreaths that had been placed by the Royal British Legion. In Erinnerung an die tapferen Deutschen Soldaten. Ihr seid nicht vergessen. Ruhet in Frieden. The crosses go on and on. 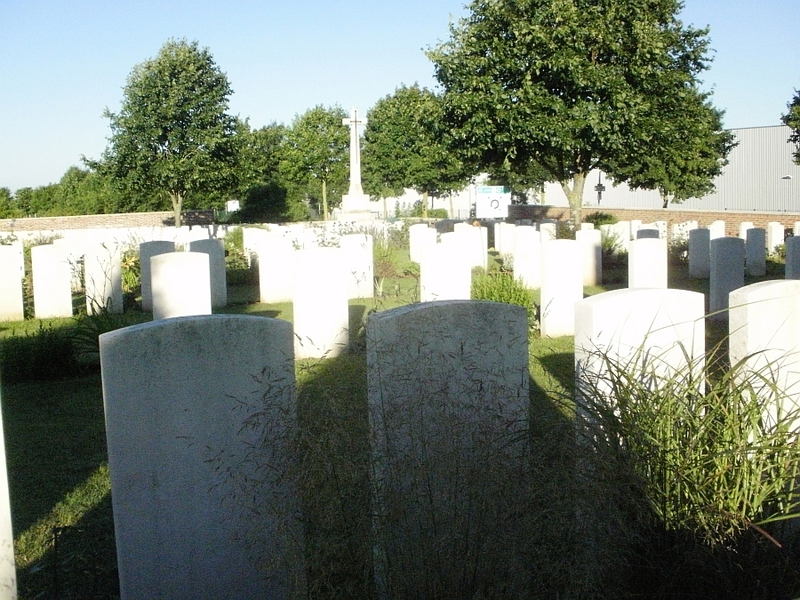 The total burial list for the cemetery is 19,027, around 1,000 of the men resting here died in the first few weeks of the war from August to late Autumn of 1914 and the trench warfare that followed. 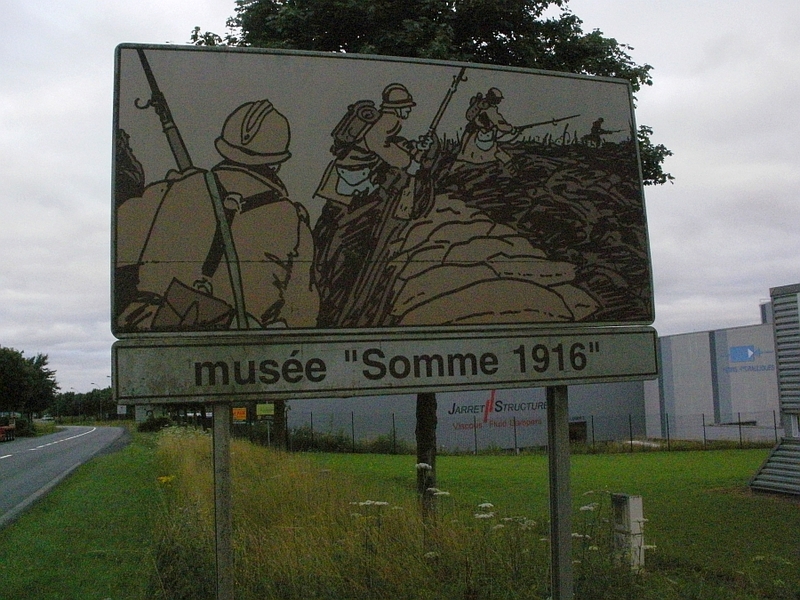 Over 10,000 were killed during the Battle of the Somme from 1st July to November 1916. A further 6,000 plus men died during the Kaiserschlacht, the huge German offensive that started on 21st March 1918 and ran to October. Information about The Volksbund Deutsche Kriegsgräberfürsorge ( VDK ) can be found on the following link. 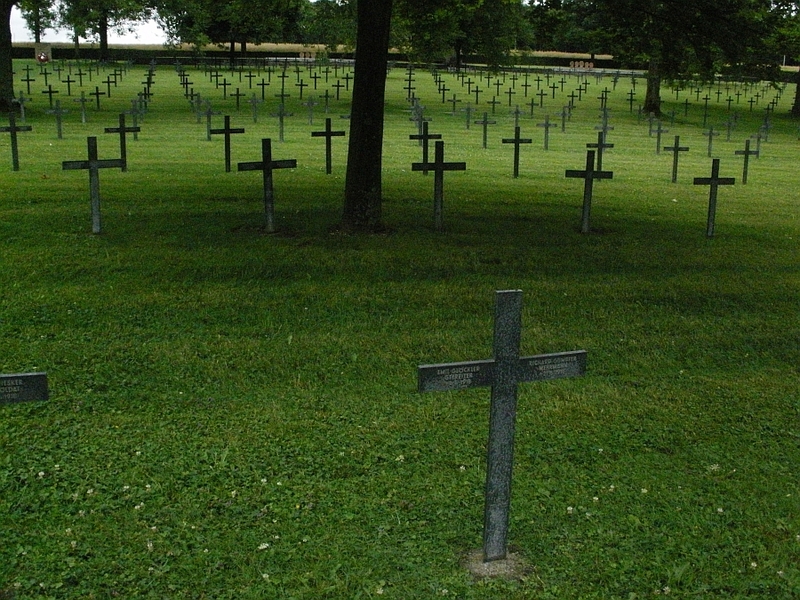 An information board outside the cemetery states that Manfred Von Richthofen - The Red Baron, was once buried here. He was shot while flying his plane on 21st April 1918 near Amiens. Although fatally wounded he managed to land his plane in a sector run by the Australian forces, but within moments of landing he died from his wounds. 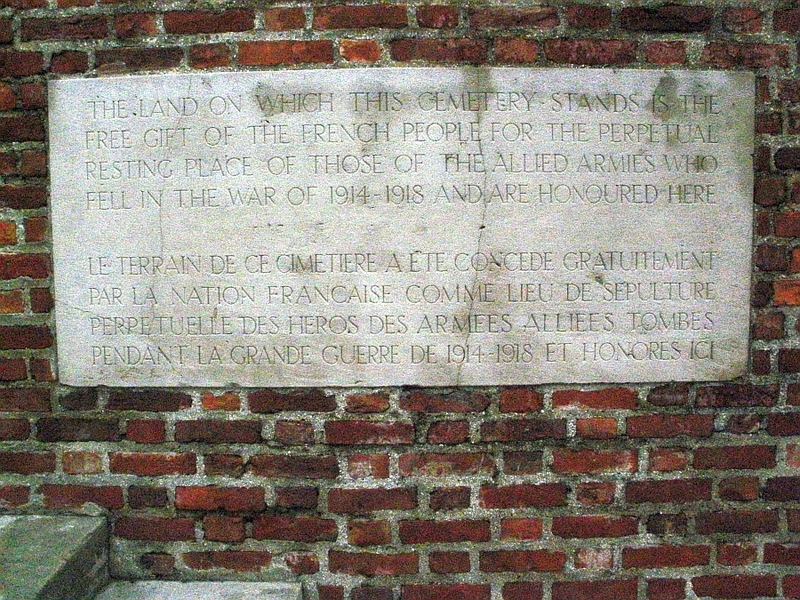 The allies buried him with full military honours in the village of Bertangles near Amiens. 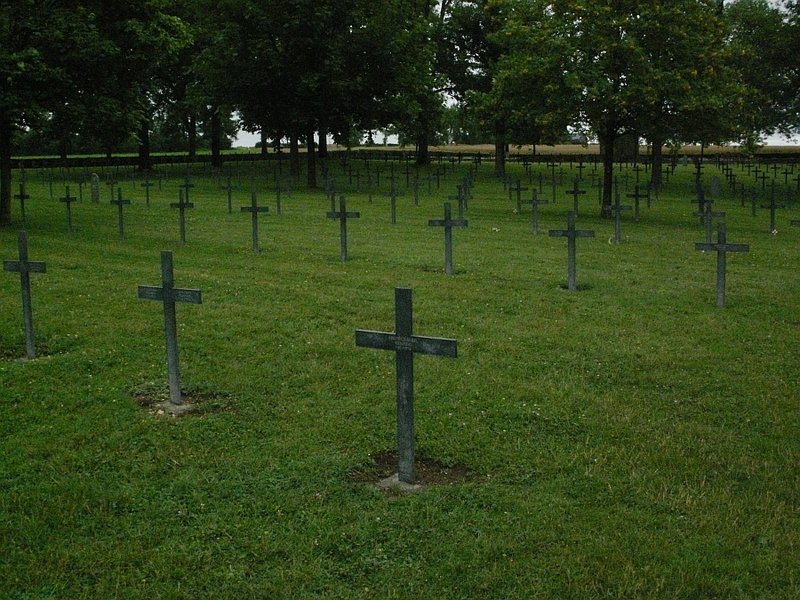 When Fricourt German Cemetery was created, Manfred's body was moved there, where he remained until 1925 when his family collected his body to take back home. 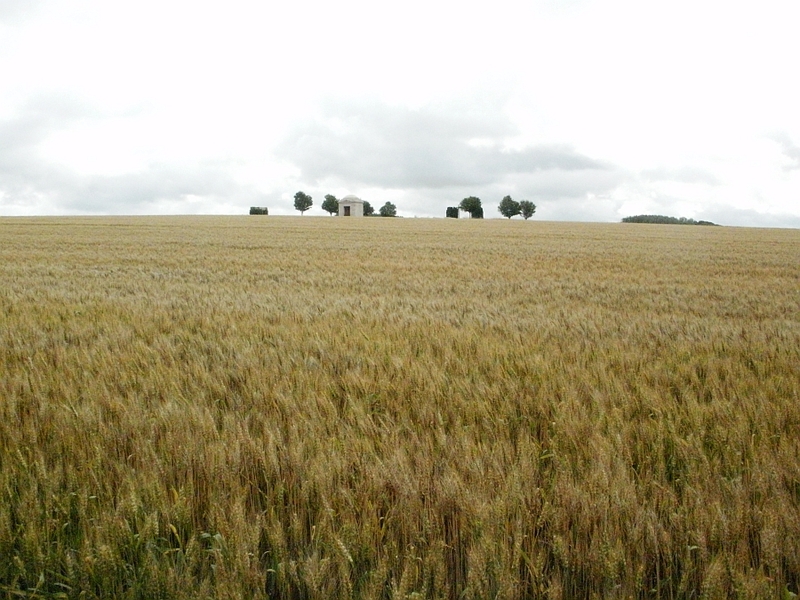 The fields outside and opposite Fricourt German Cemetery. So peaceful, yet once the scene of intense fighting. We then drove up to the German trenches at Point 110 just outside Fricourt. 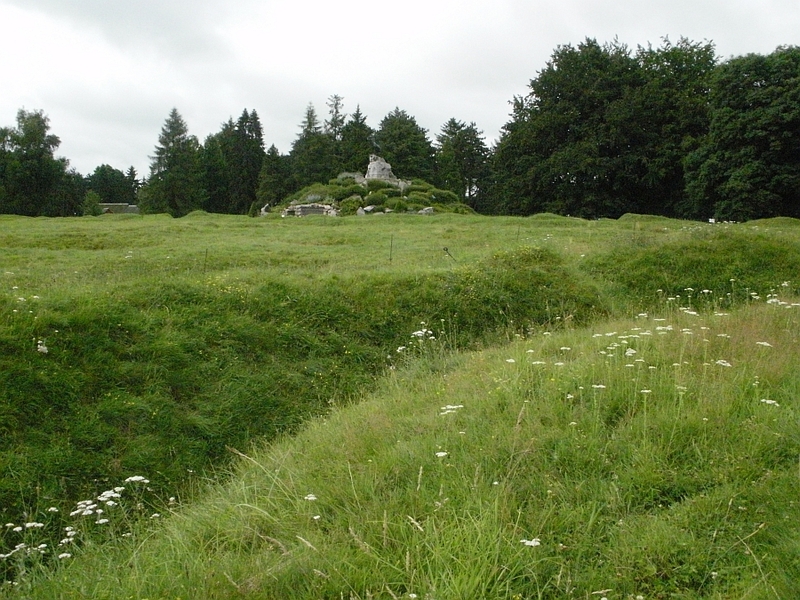 Those defending these trenches up on the ridge had a clear view down towards where the attackers came from. The trenches are now manned by these guys, a rather friendly bunch they are as well. 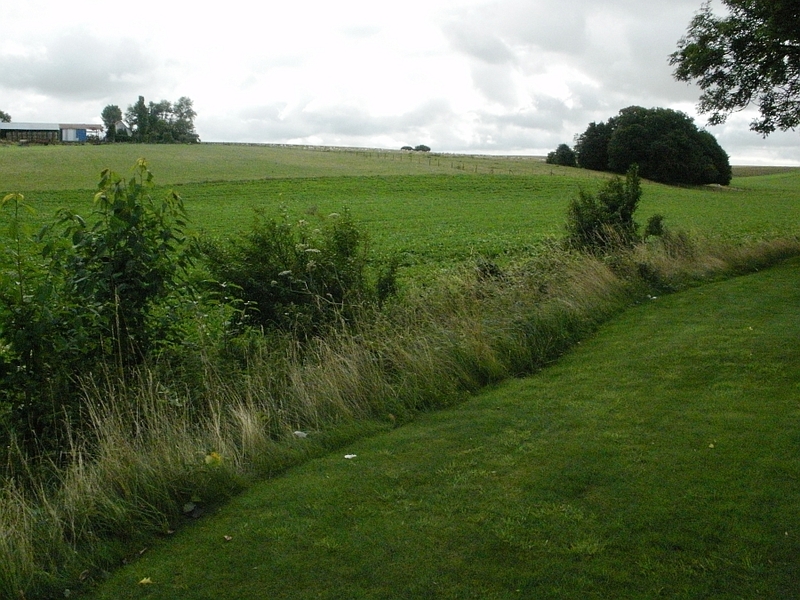 The Allies had attacked uphill from the left of the above photo. 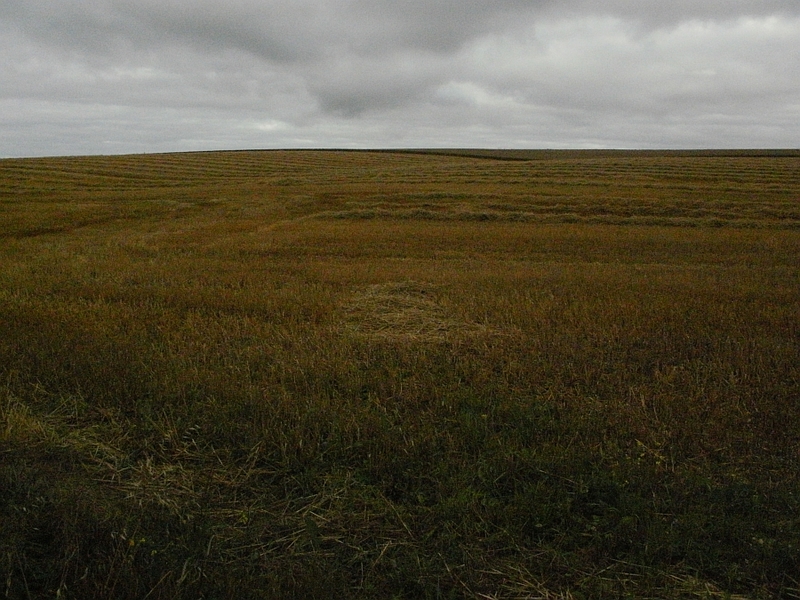 Below we can see the land they moved over during their attacks, they would have been moving straight towards where I am standing, the crops hide how steep the hill is. After leaving Point 110 we swung around the outskirts of Albert and on to the Route De Bapaume, after less than two miles we were at the Allies front line on 1st July 1916. 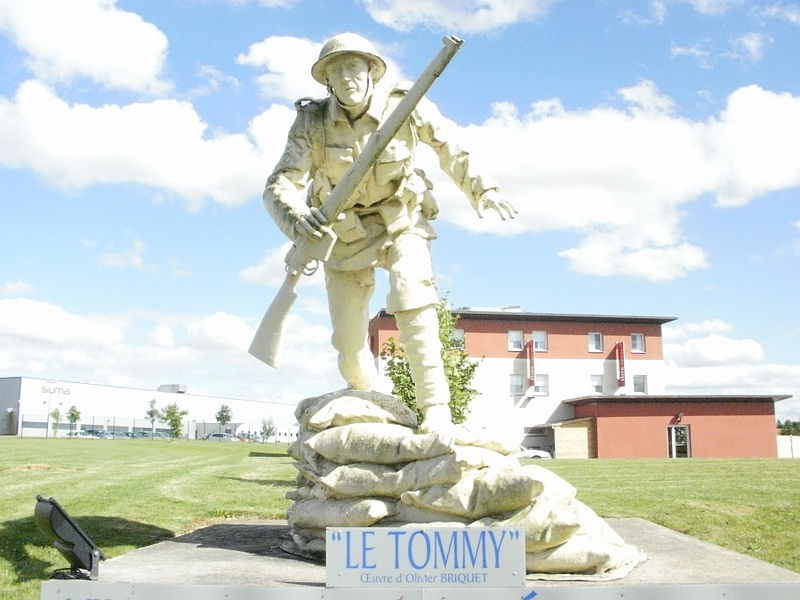 As you turn onto the Route De Bapaume you see this guy " Le Tommy " he is an advert for the Somme museum in Albert. That is the hotel we stayed in behind him " The Ibis ". Another advert for Albert's Somme Museum. 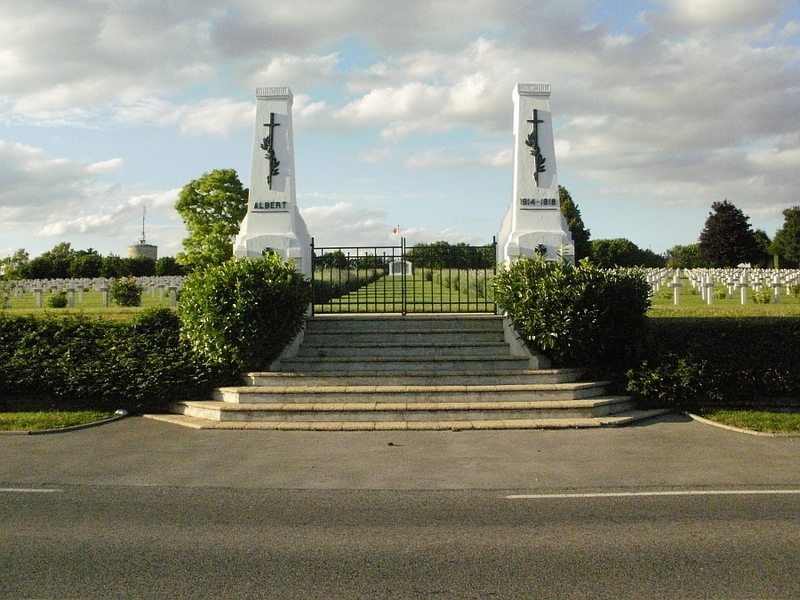 Just after " Le Tommy " you come to Bapaume Post Military Cemetery. I arrived on the Tuesday evening and left on thursday morning, yet I visited this cemetery 4 times, as you will see from the difference in photographs from rain to sun. 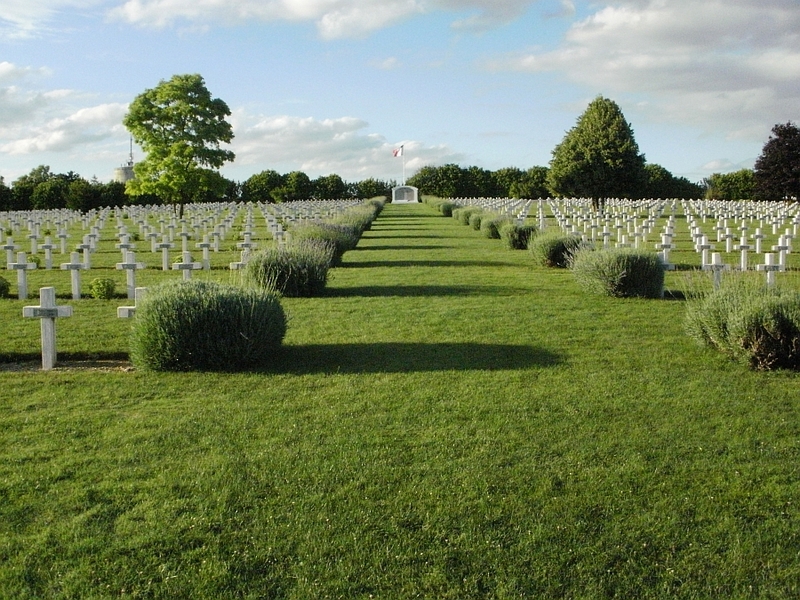 Bapaume Post Military Cemetery lies on the west side of "Tara Hill," and south-west of "Usna Hill," and at times it was called by those names. 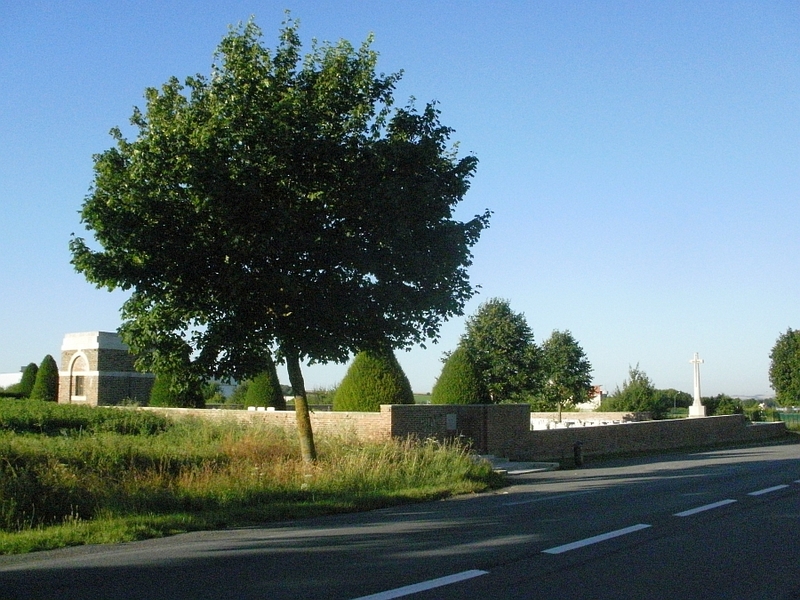 In June 1916, the front line crossed the Bapaume road between the site of this cemetery and the village of La Boisselle. 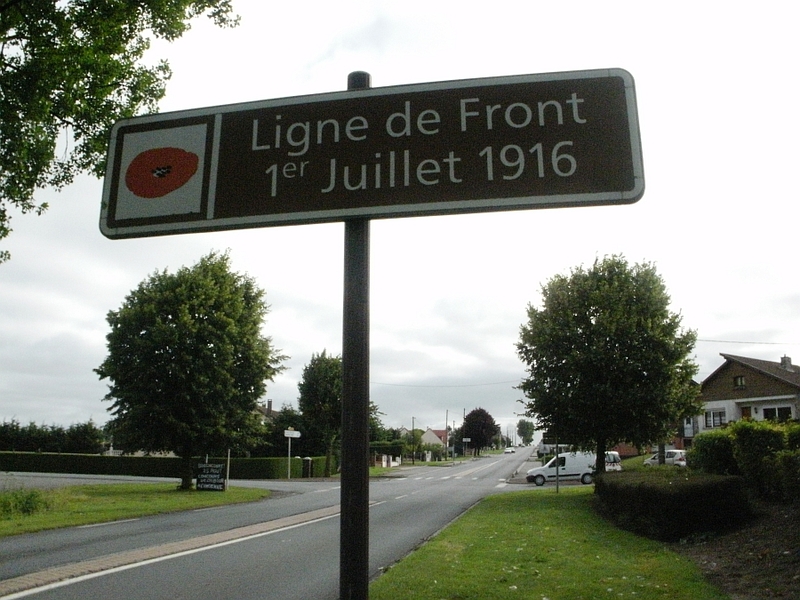 The attack on La Boisselle on 1 July was not successful, and several days passed before the village was taken. 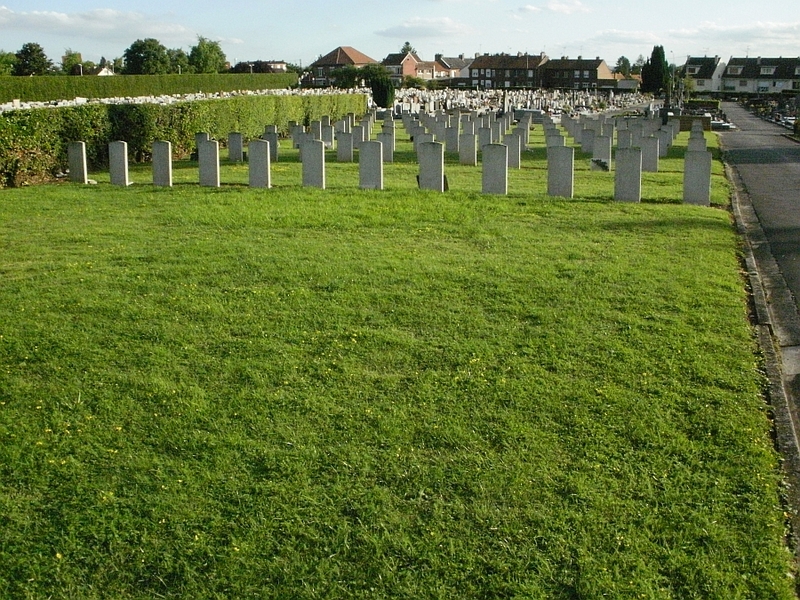 The cemetery was begun almost at once by the divisions engaged in this sector and 152 graves in Plot I, Rows B to I, were made before the end of January 1917, when the cemetery was closed. 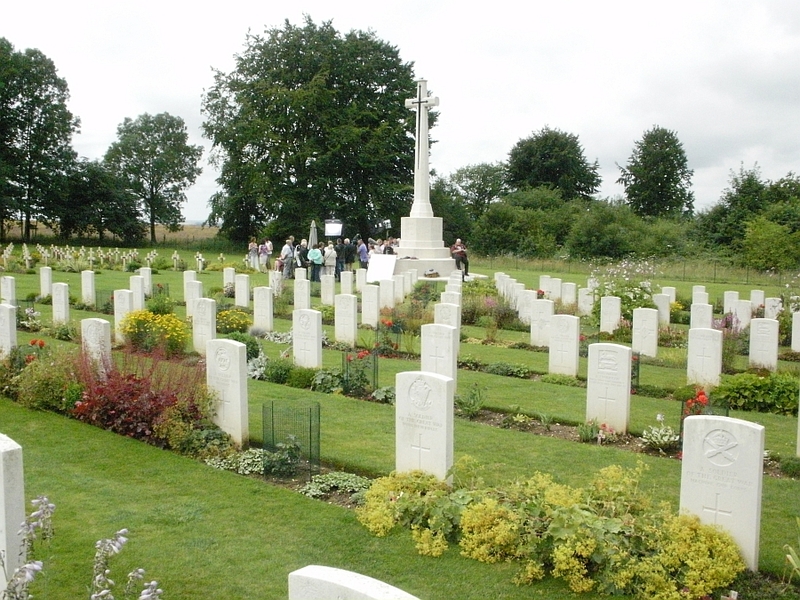 On 26 March 1918, the cemetery, with the town of Albert, fell into German hands, but it was recovered towards the end of August. 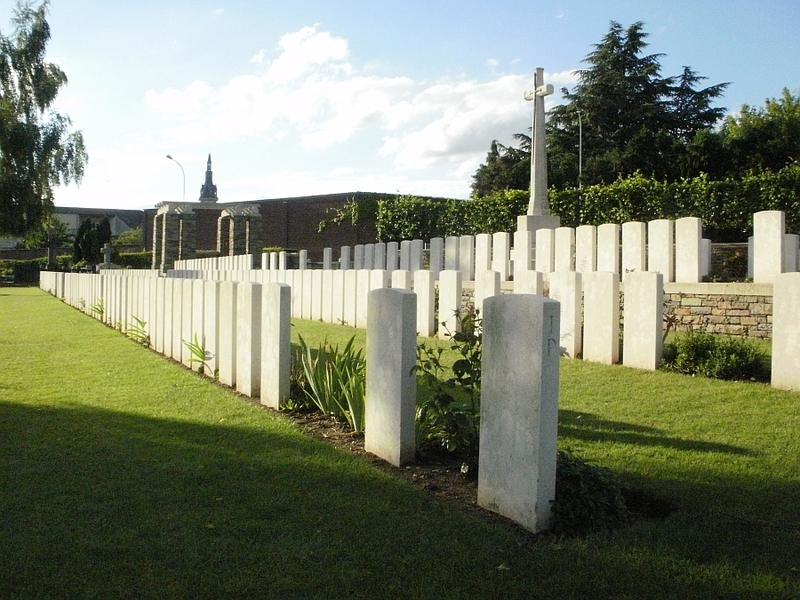 After the Armistice, graves from the battlefields east and west of the cemetery were brought in, including many of the 34th (Tyneside) Division, which attacked along the Bapaume road on 1 July 1916, and some of the 38th (Welsh) Division, which recaptured Usna Hill on 23 August 1918. 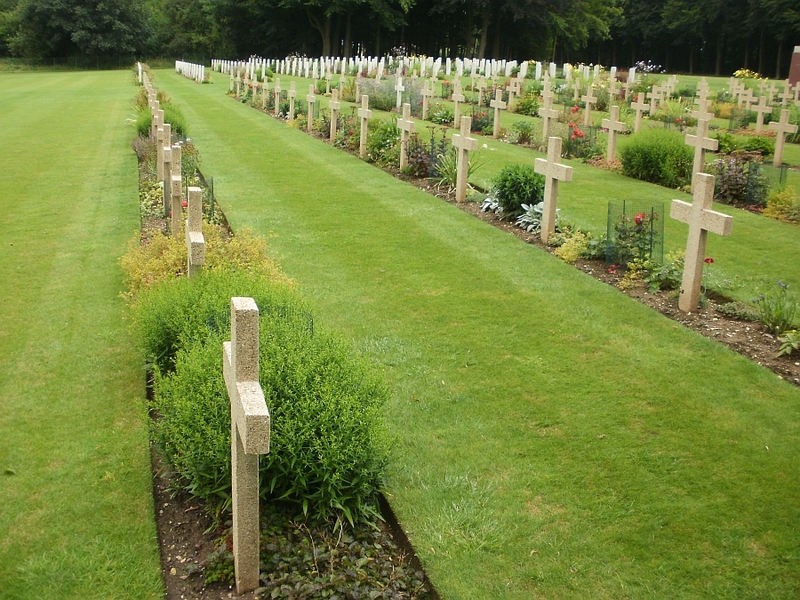 The cemetery now contains 410 burials and commemorations of the First World War. 181 of the burials are unidentified, but there are special memorials to three casualties believed to be buried among them. 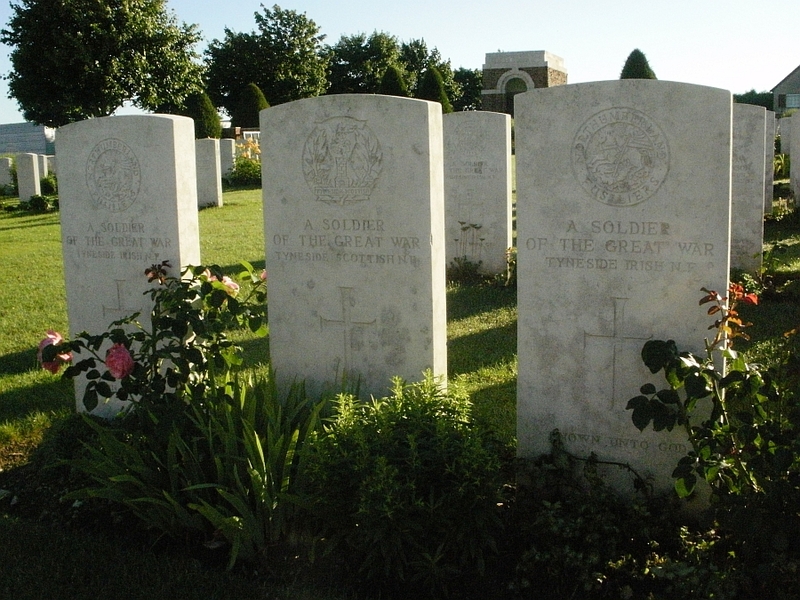 As you look around the cemetery you begin to notice that a lot of the men are from the Tyneside Regiment. notably the Tyneside Irish and the Tyneside Scottish. Many have the inscription 1st July 1916 and we shall learn more about these guys in a moment. 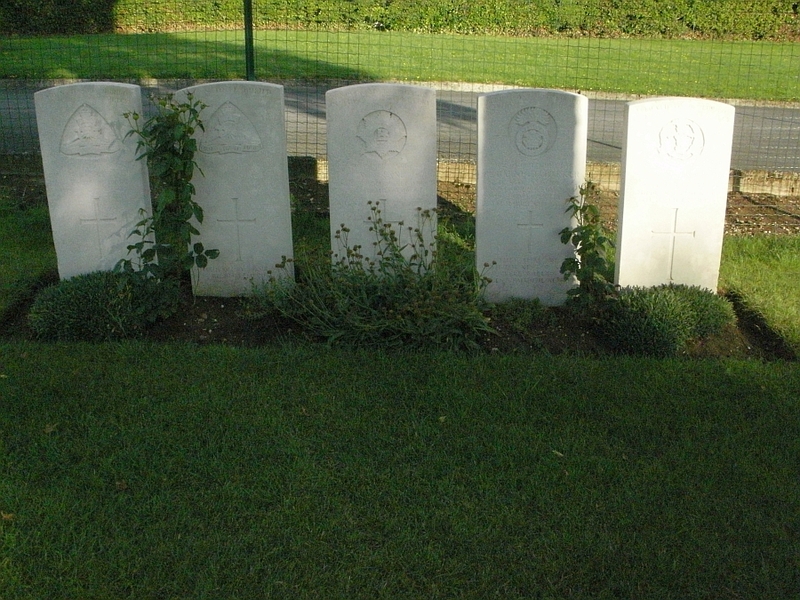 The three headstones pictured above are unknown men from the Northumberlan Fusiliers - Tyneside Regiment. Private Christie, one of the 18 Australian's resting in the cemetery. 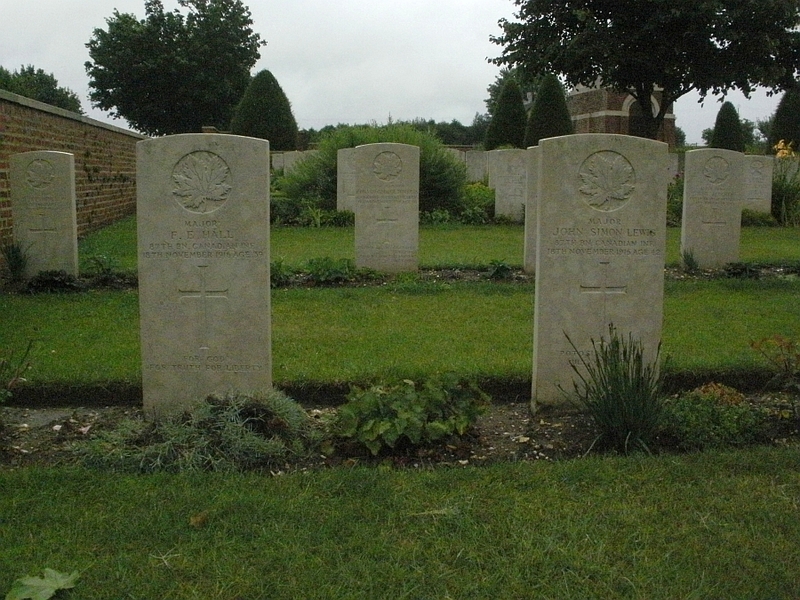 The grave of one South African man also lays alongside his comrades at Bapaume Post. 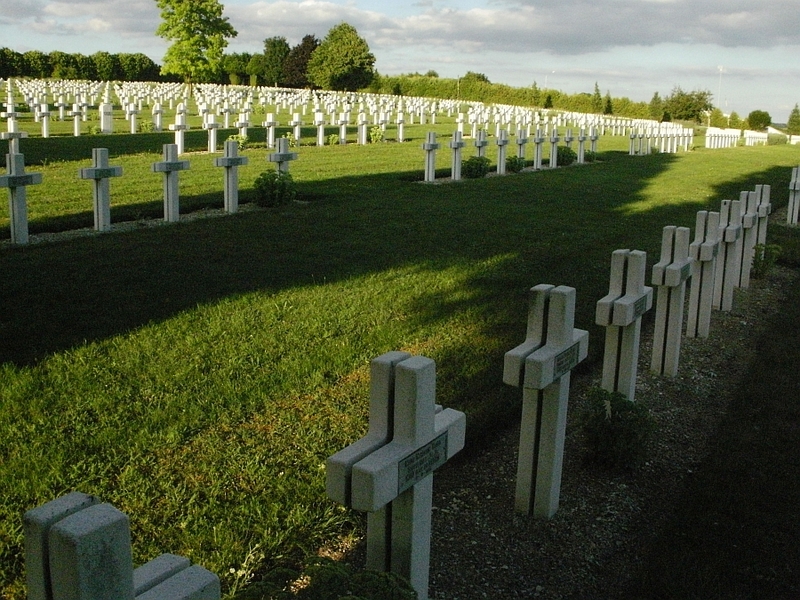 The cemetery holds 410 graves, of which 181 are unknown. 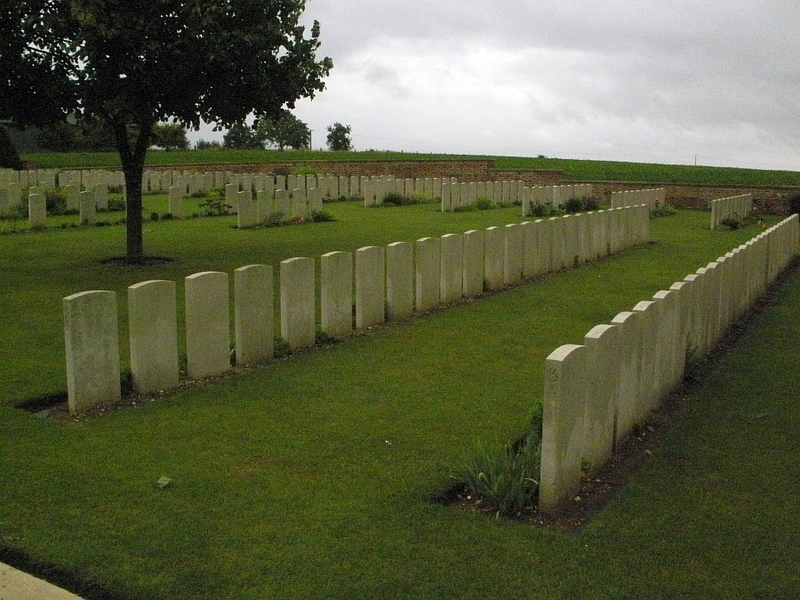 There are 105 graves for the Northumberland Fusilier - Tyneside regiment, of these just 27 are identified. Privates Rooney and Mc Allister. Both killed on 1st July 1916. Three headstones that remember men who are known to be buried within the cemetery, but their graves remain unknown. Rest In Peace Lads - Not Forgotten. 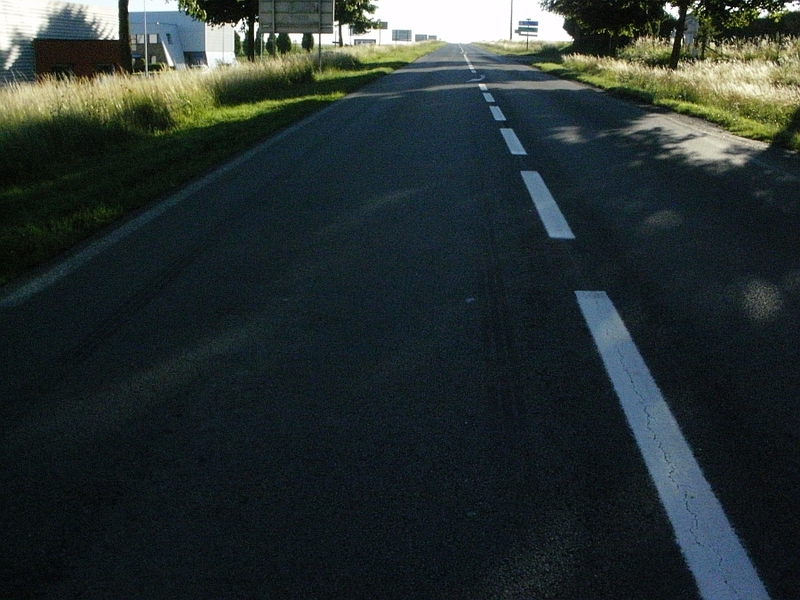 The Route De Bapaume leaving Albert. 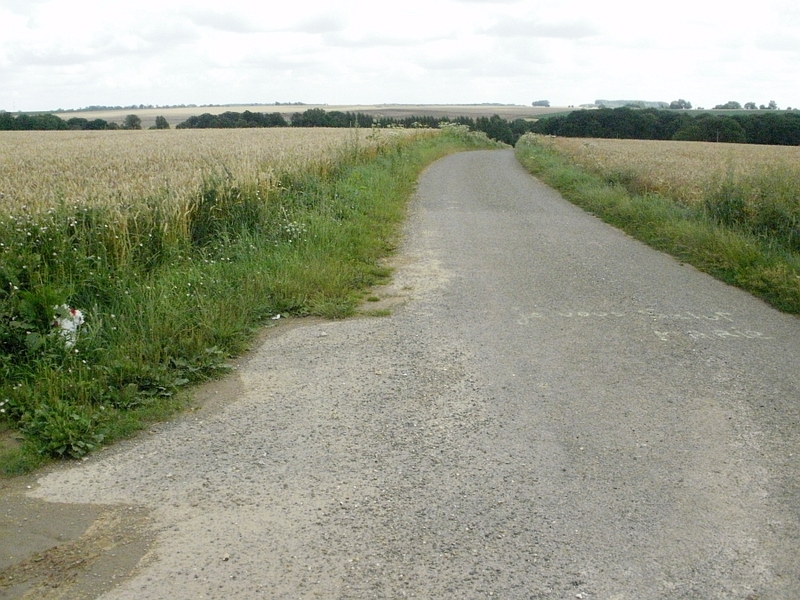 Many allied men would have walked this road to the front lines during the war. 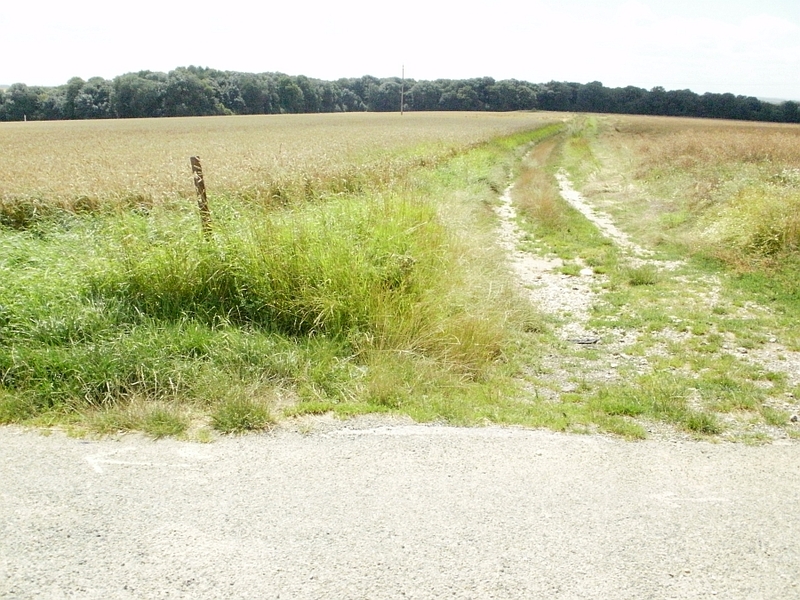 As we continue along the Route De Bapaume we come to the Allies front line on 1st July 1916. 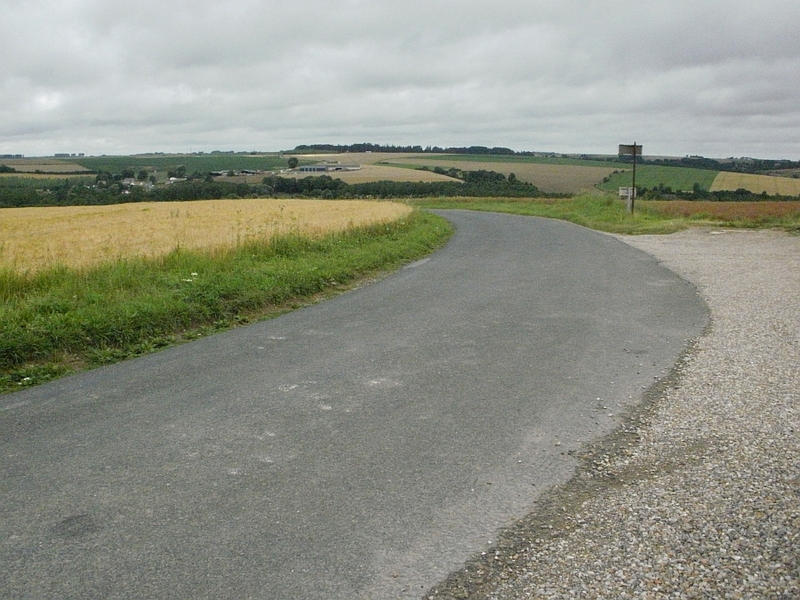 Above looking towards the village of La Boiselle, and below in the direction of the road to Albert. 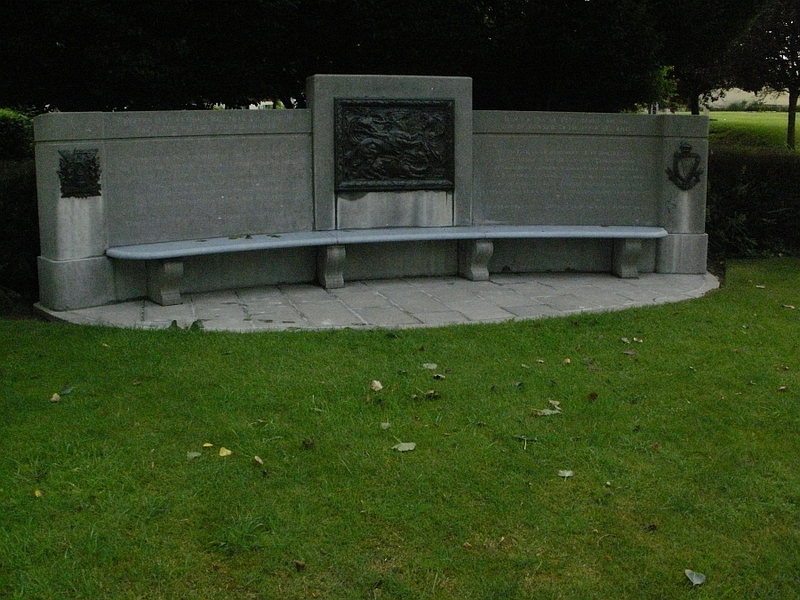 Next to the Front Line signs is the Tyneside Memorial Seat. 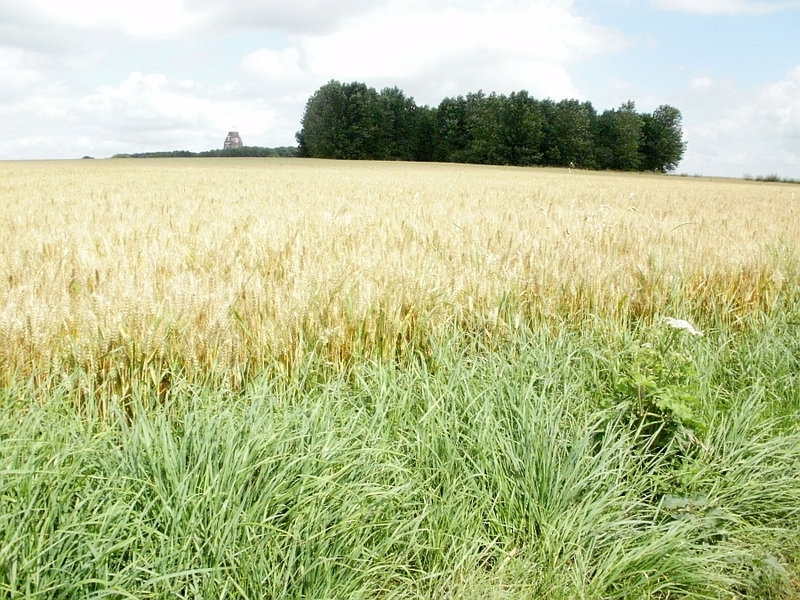 It remembers those of the 34th Division who attacked the village of La Boiselle from this spot on 1st July 1916. The division suffered huge losses with almost 80% of it's men becoming casualties. 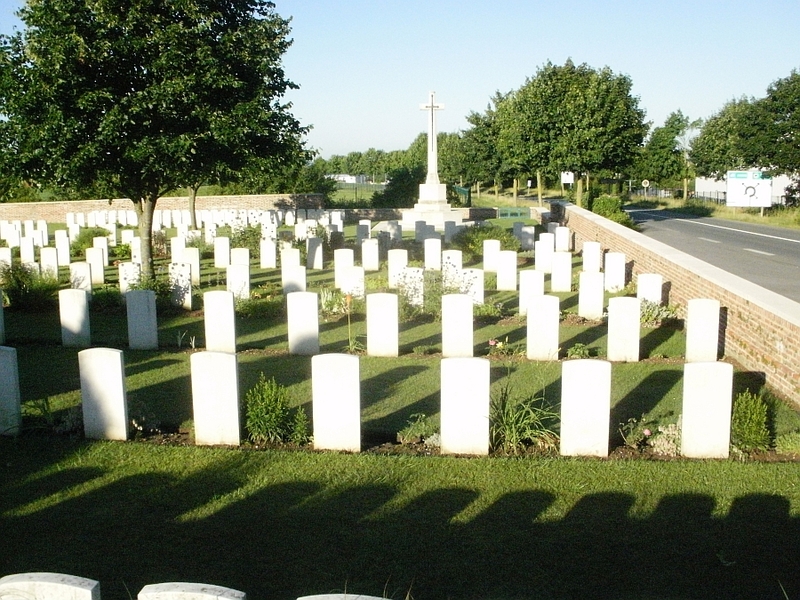 Most of the men were from the Tyneside Irish and Scottish, many were killed or wounded in the first ten minutes of the attack, and a number of them are the guys we have just seen resting in Bapaume Post Military Cemetery. "Greater love hath no man than this that he lay down his life for his friend. In front of this monument on 1/7/16 the 'Tyneside Scottish' and the 'Tyneside Irish' brigades attacked the enemy. For many hours the fortunes of arms fluctuated but ere night had fallen the two Tyneside Brigades with the aid of other units of the 34th Division attained their objective. Think not that the struggle and the sacrifice were in vain." 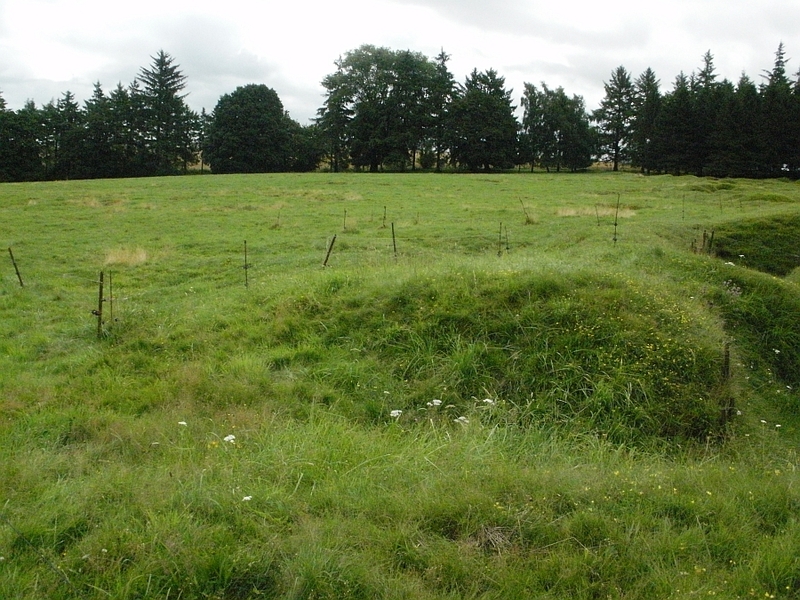 From the Front Line we turned off the main road and passed The " Glory Hole " where the trenches between enemies had been very close together. 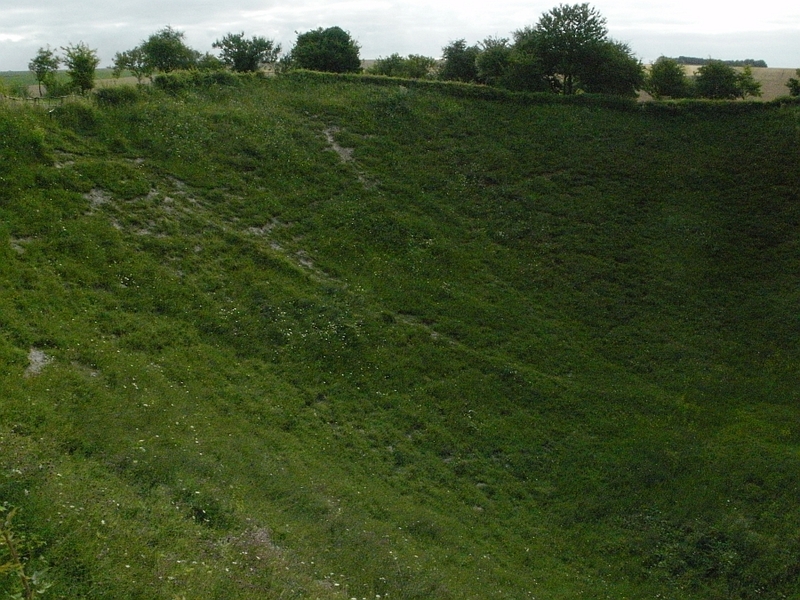 Both sides had blown up small mines and the craters can still be seen today. Recent research work at the Glory Hole meant that it was closed off by covers so we were unable to see anything. we carried on along the road until we came to the Lochnagar Crater. 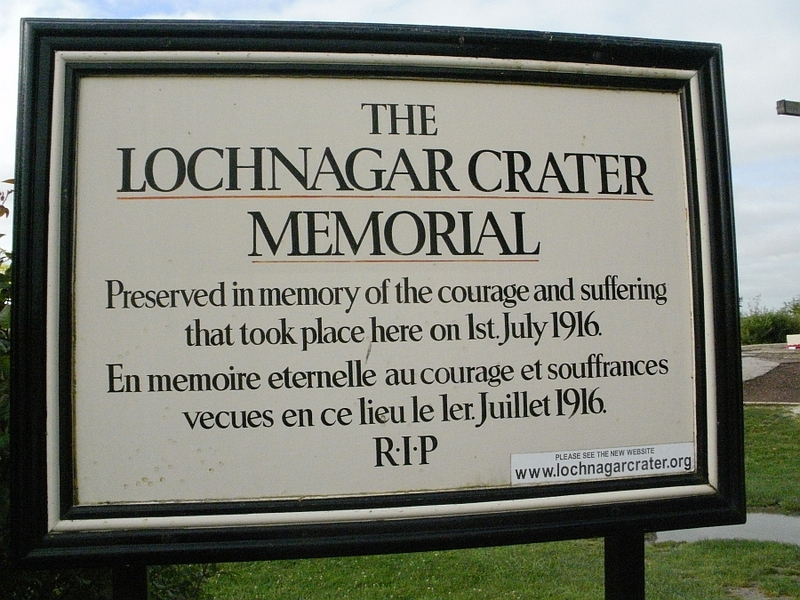 The entrance sign to the Lochnagar Crater. 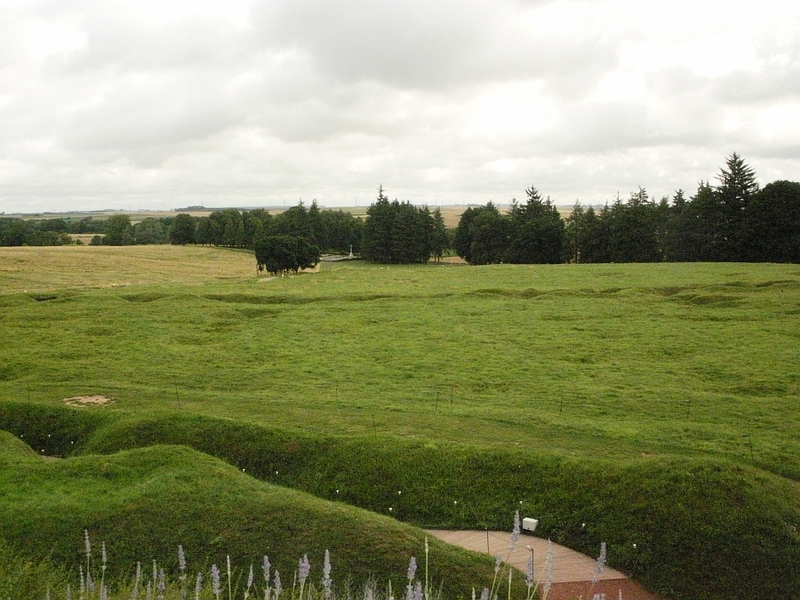 In 1978 Englishman Richard Dunning bought the site of the crater to preserve it as a memorial to those who died here, his dedication has turned it into one of the most visited WW1 sites on the Somme. This wooden cross was placed at the crater in 1986, it came from the roof of a church in Durham, England. Many of the British men who attacked here on 1st July 1916 were from the North East of England, the Northumberland Fusiliers 102nd Tyneside Scottish Brigade ( 20th, 21st, 22nd and 23rd Battalions ) and the 103rd Tyneside Irish Brigade ( 24th, 25th, 26th and 27th Battalions ) Had attacked here just after the explosion. The crater is too large to photograph, it stuns you how big it really is. 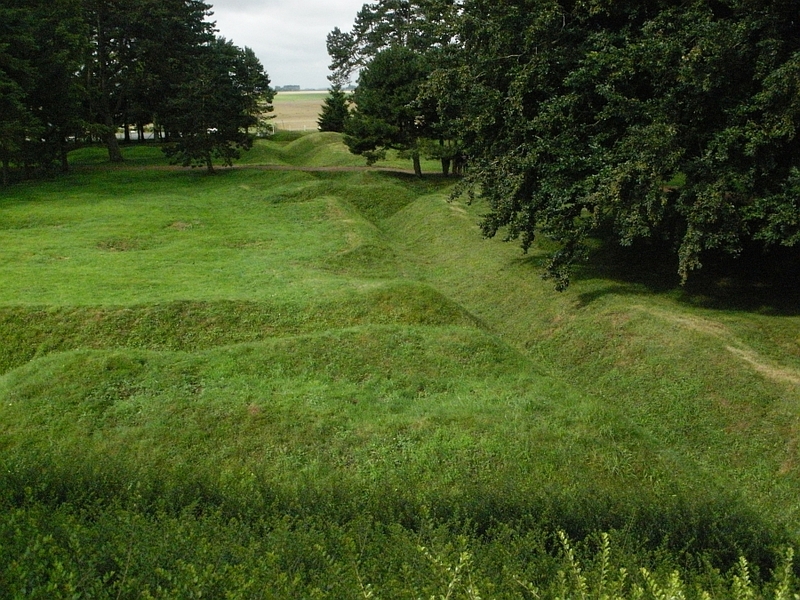 The site of the crater was a German stronghold named " Schwaben Höhe " The 179th Royal Engineers Tunneling Company had prepared and laid the mine. 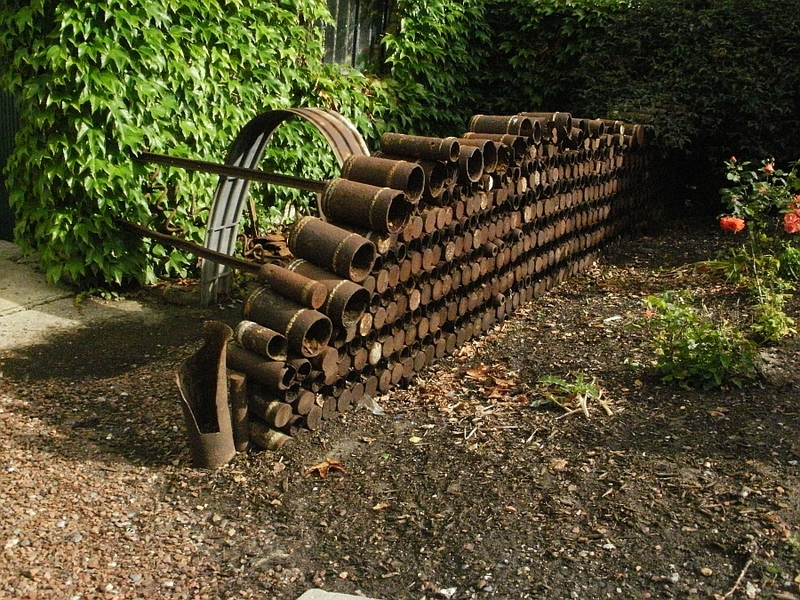 At 7.28 am on the morning of 1st July 1916 the mine was detonated killing hundreds of German soldiers in an instant, two minutes later the whistles blew and the allied troops climbed out of their trenches to advance. The German's were quick to regroup and take up positions along the crater, the bloodbath had continued. I must be honest and admit that as I walked around the crater I found it hard to keep hold of my emotions, a number of times I just had to stop in silent thought and remember those from all sides who suffered here. 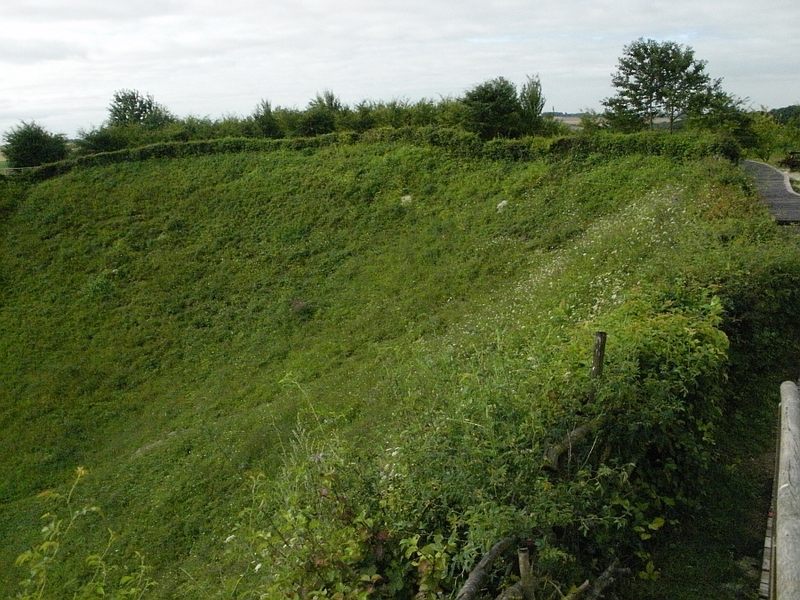 The Lochnager Crater is named after the trench from were the tunnelers began their main tunnel, it is known locally as " Le Grande Mine " It is around 300 feet wide and 70 feet deep, and is one of 17 mines blown up on 1st July 1916 by the Allies. 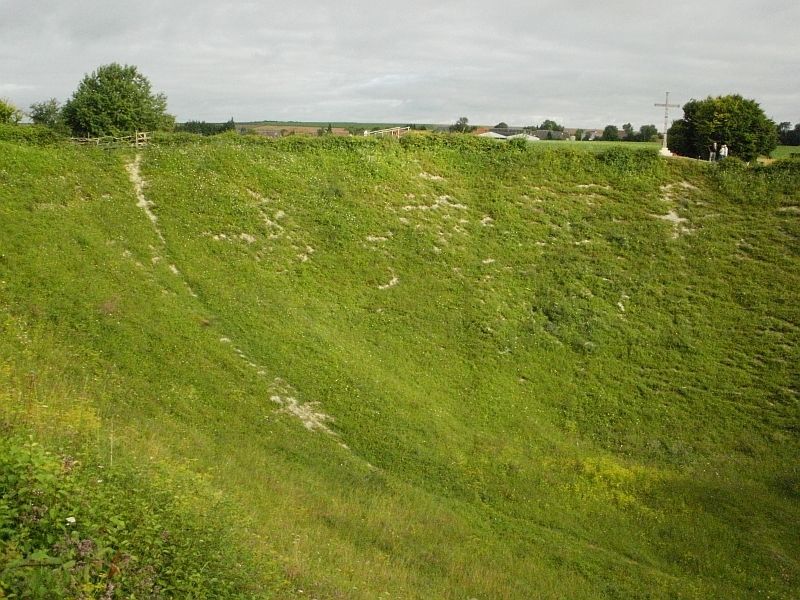 The Lochnagar Crater is the largest one ever made in anger by men at war, it's detonation was said to be heard in London. 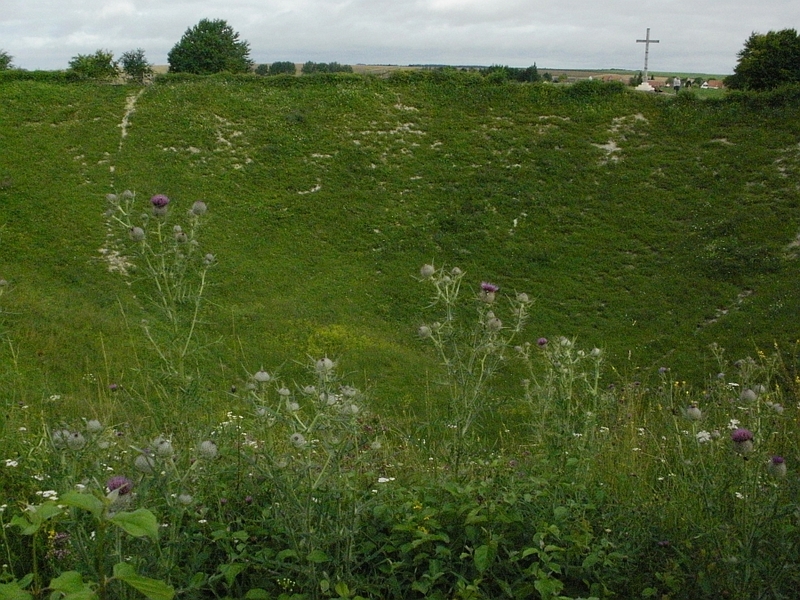 Today the crater is a memorial to all those that died here. 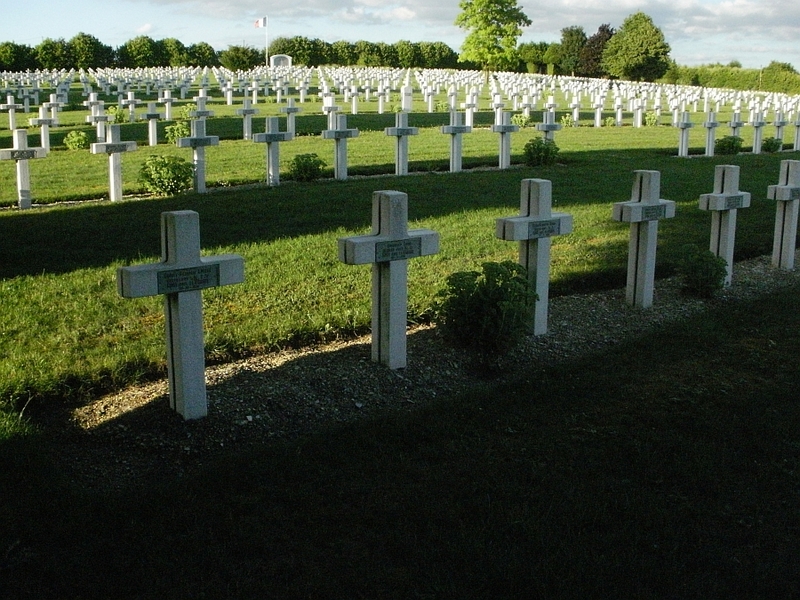 It will still contain the bodies of many German soldiers along with a number of French and British. 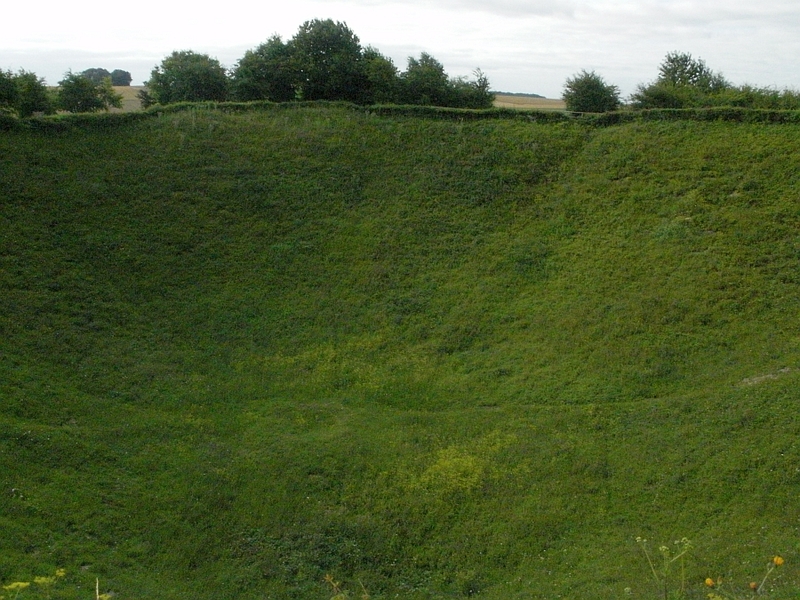 The crater also stands as a reminder of how humans can treat each other. I would like the governments of the world to hold their peace talks here. Looking over the crater towards the cross. Can you see the people to the right of the cross? if you can then you have some idea of the huge scale of the crater. 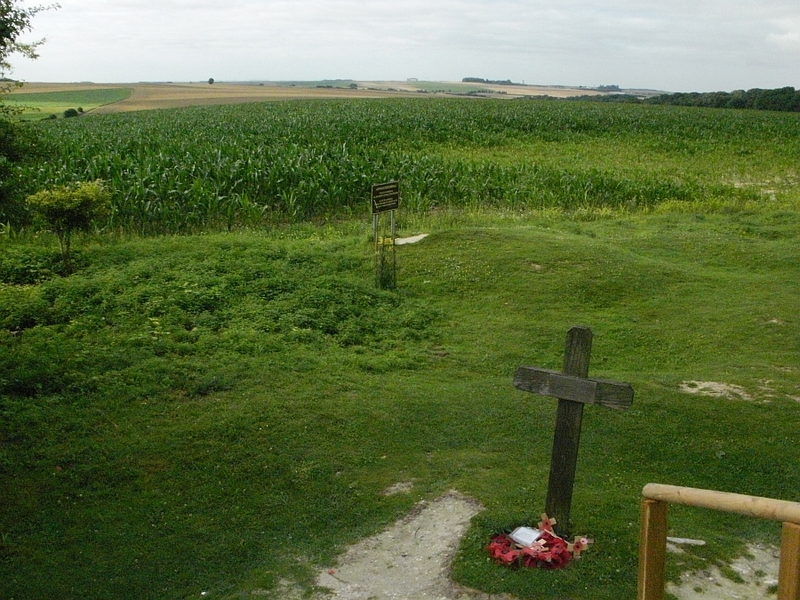 Looking out across the battlefields..What is the cross with the wreath? 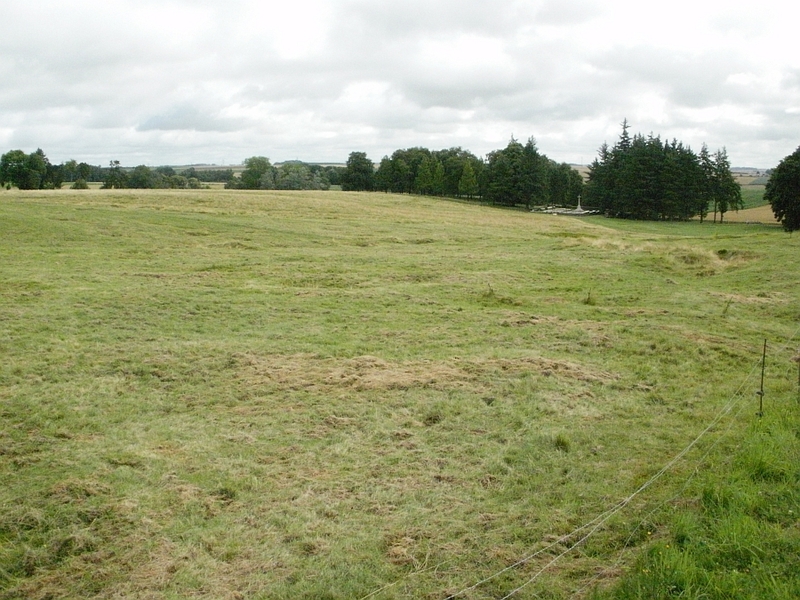 On 31st October 1998 the body of a British soldier was found on this spot yards from the crater. He was later identified as Private George James Nugent 22/1306, 22nd Tyneside Scottish, Northumberland Fusiliers. 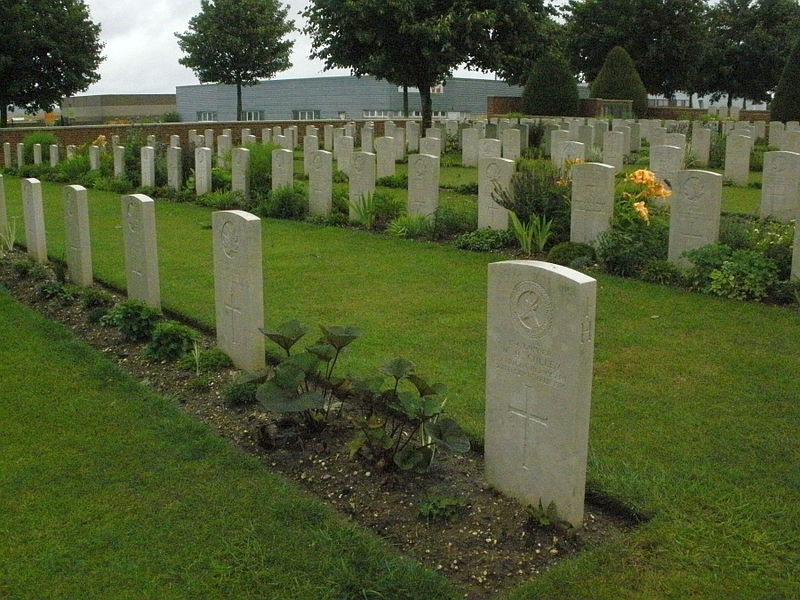 His body now rests at nearby Ovillers Military Cemetery. George was killed in action on 1st July 1916. He is one of those listed on the Thiepval Memorial to the missing, of course now he is found. 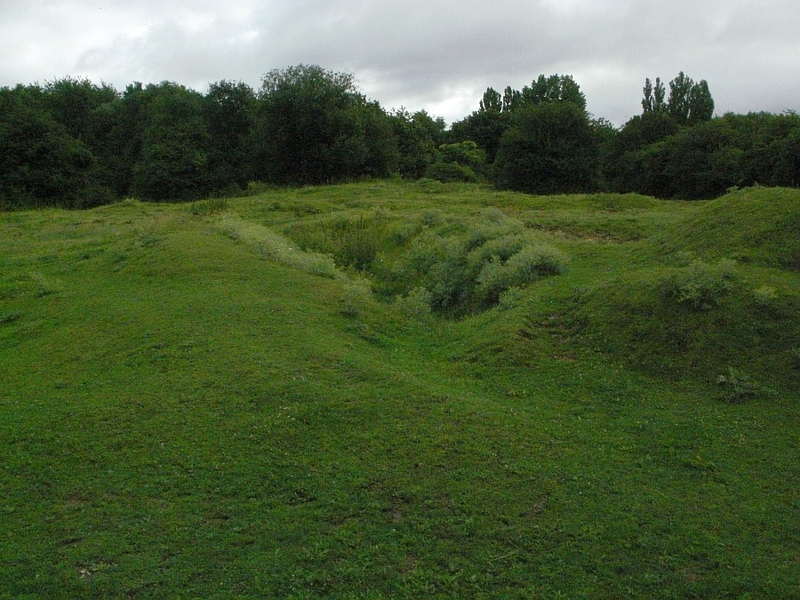 Shell holes can still be seen dotted around the crater, a reminder of the fierce fighting that took place here. 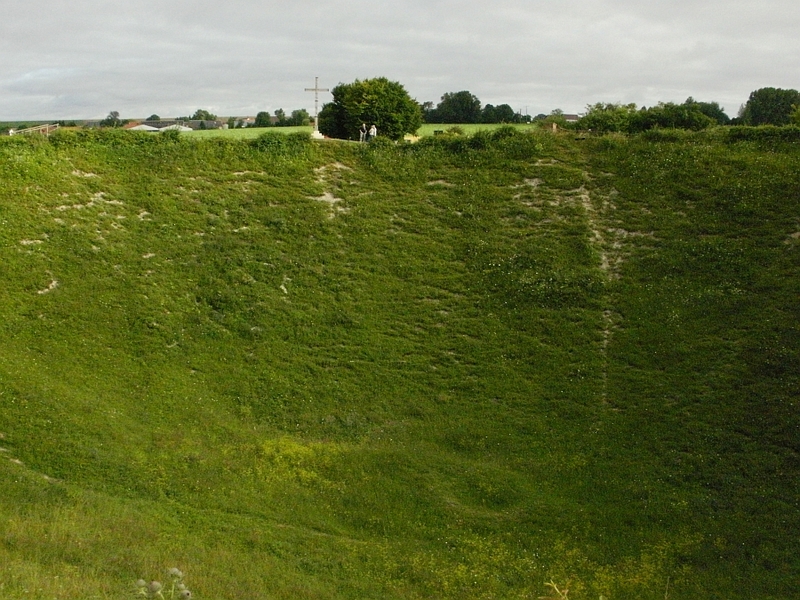 The official website for The Lochnagar Crater can be viewed on the link below. 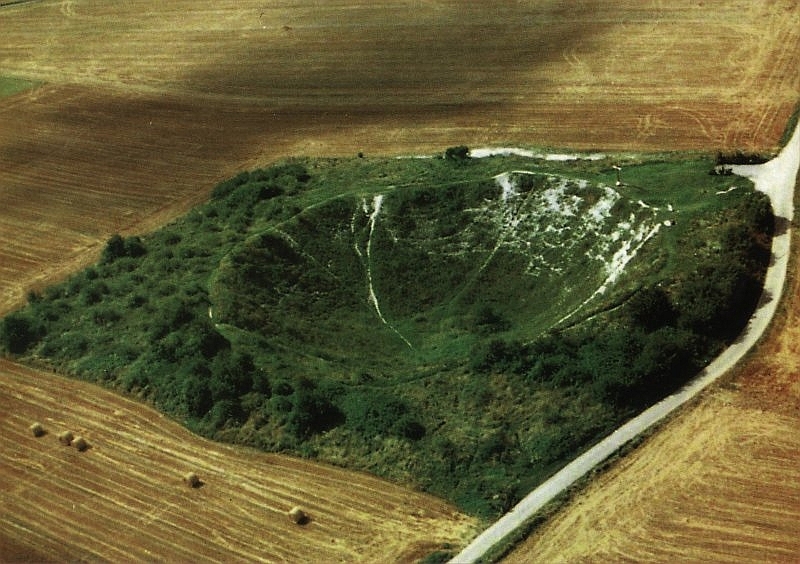 An aerial photograph of The Lochnagar Crater showing it's huge size. We left the Crater and headed back to the main road before moving on to Poziers, we saw the Ovilliers Military Cemetery up on the hillside as we passed by. The Poziers British Cemetery and Memorial was having a major restoration, with scaffolding outside and headstones covered for cleaning there was no photo opportunity. Still it was nice to see the work taking place, they sure do look after these cemeteries. 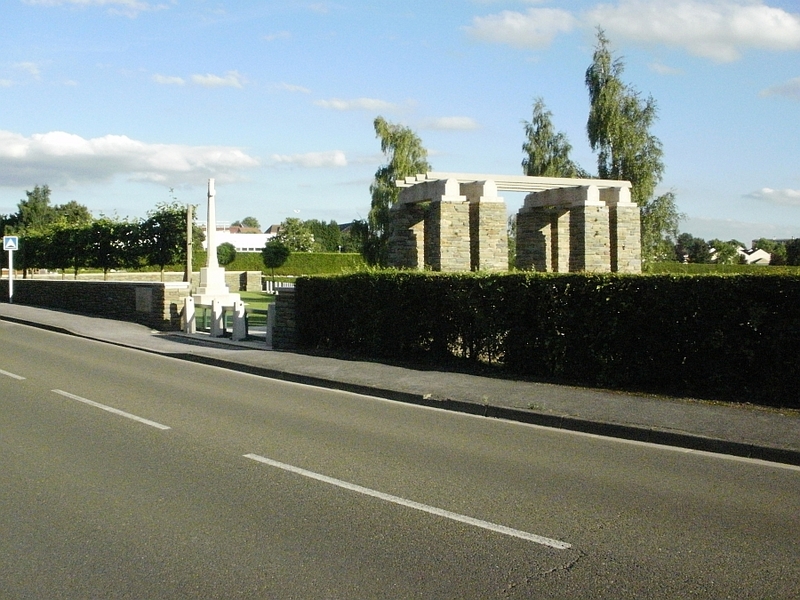 My friend Caryl Williams had visited the area in 2012 and she has kindly allowed her photographs of the Poziers Cemetery and Memorial to be used below. Pozieres Memorial and cemetery The Memorial that encases the cemetery commemorates over 14,000 casualties of the Commonwealth forces who have no known grave and who died on the Somme from 21 March to 7 August 1918. 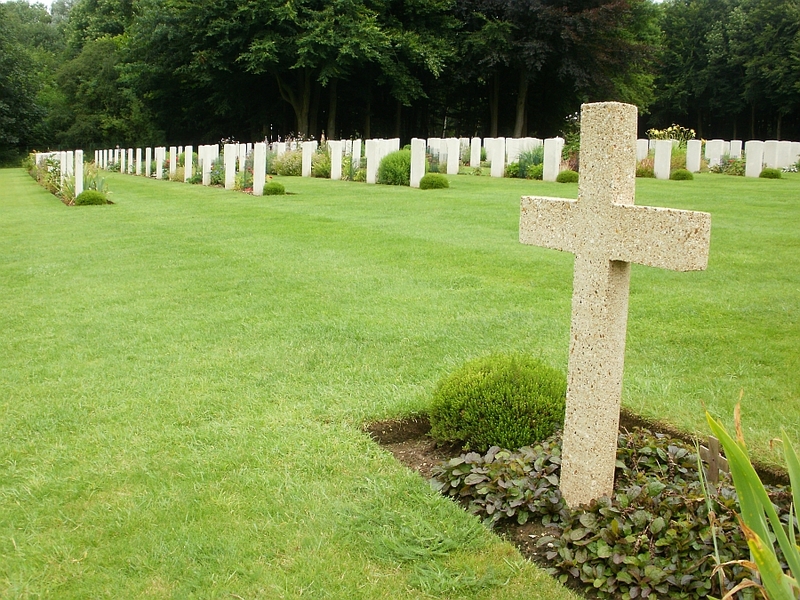 The Cemetery contains 2,760 Commonwealth graves, of which 1,382 are unknown. A very interesting web page about Poziers that uses old and new photographs can be found on the link below. We continued into Poziers and past the Australian First Division memorial. Thanks go again to Caryl Williams for the two photographs below. 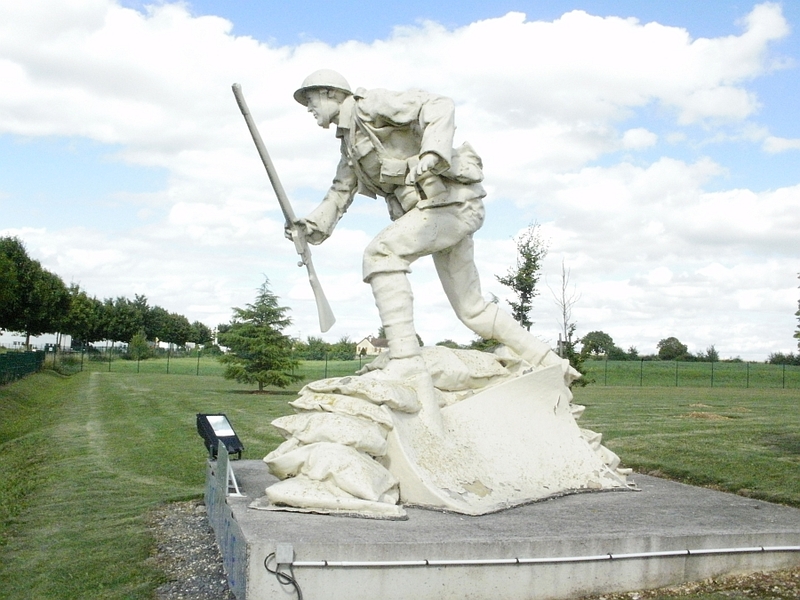 Australian First Division memorial Pozieres. 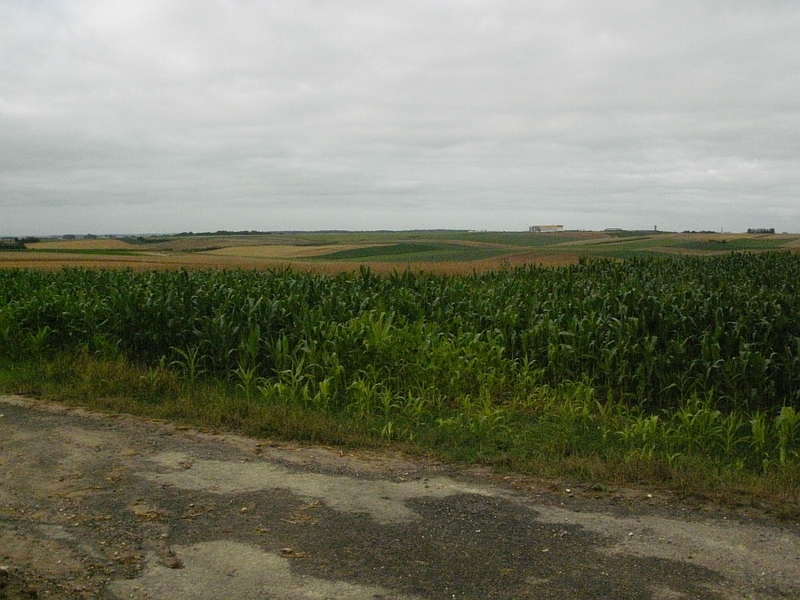 We then turned off the main road towards Thiepval, our first stop was at Mouquet Farm. 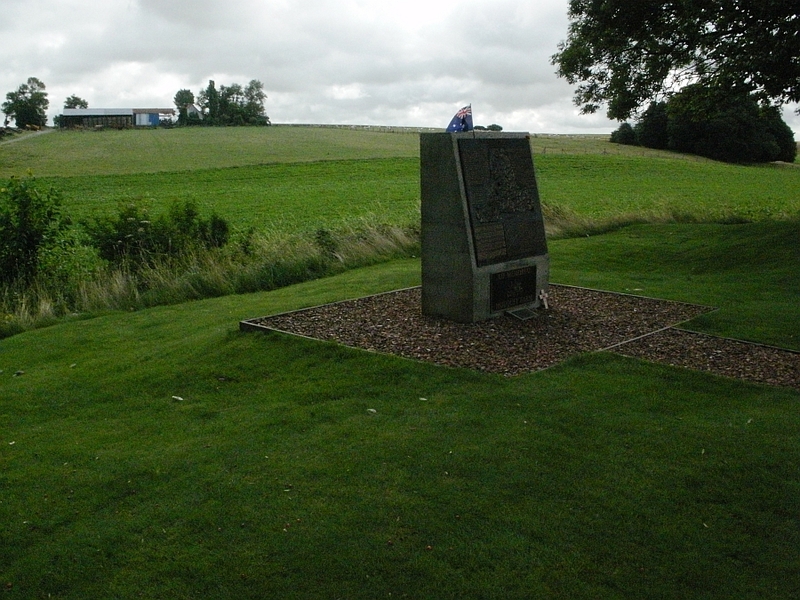 The Australian War Memorial at Mouquet Farm. The Australian's have placed a number of these Bronze Plaques in places around the world were their troops fought with distinction. It was unveiled in 1997 by the then Deputy Prime Minister of Australia, Tim Fisher. 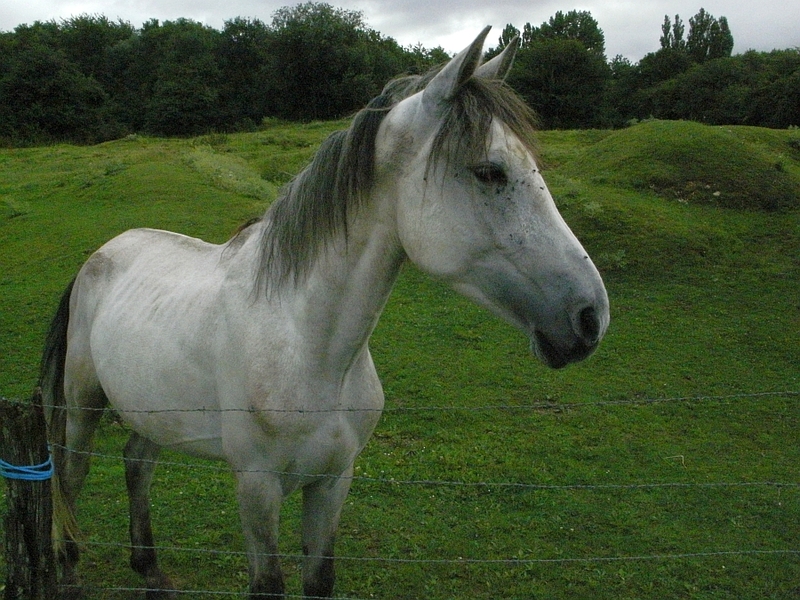 Just off the road from Poziers to Thiepval stands Mouquet Farm, it sits on a high ridge. 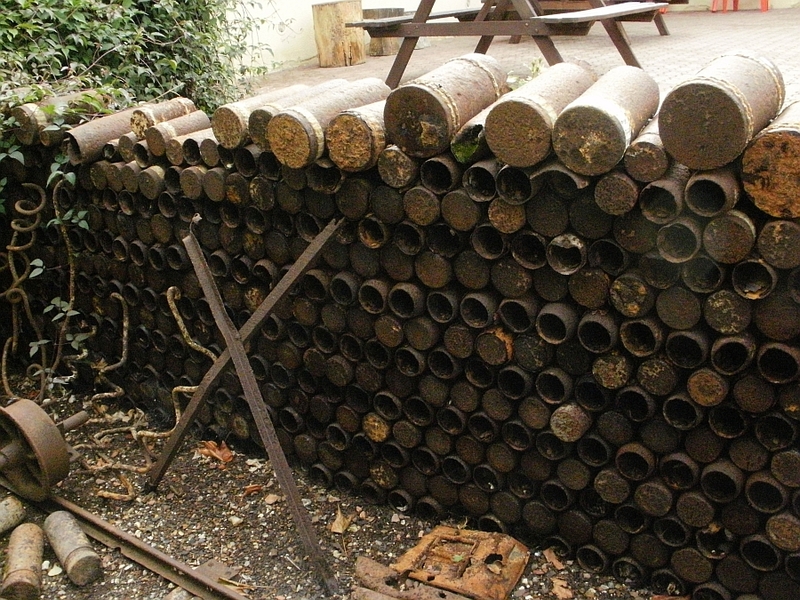 In 1916 the German Army had turned the farm into a formidable obstacle, building a network of tunnels leading from the farms strong cellars to hidden gun positions and back to German lines at the Schwaben Redoubt. 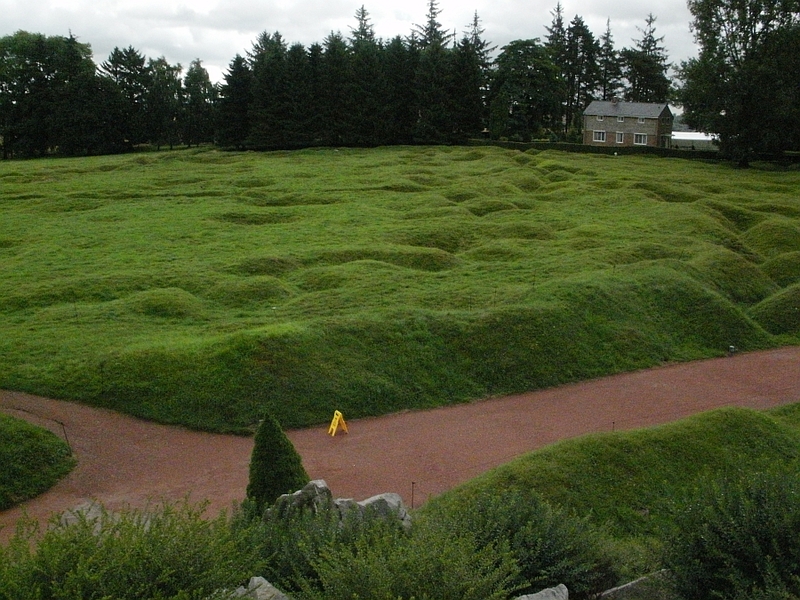 It was also overlooked by German positions at Thiepval, so any attack could be well defended. 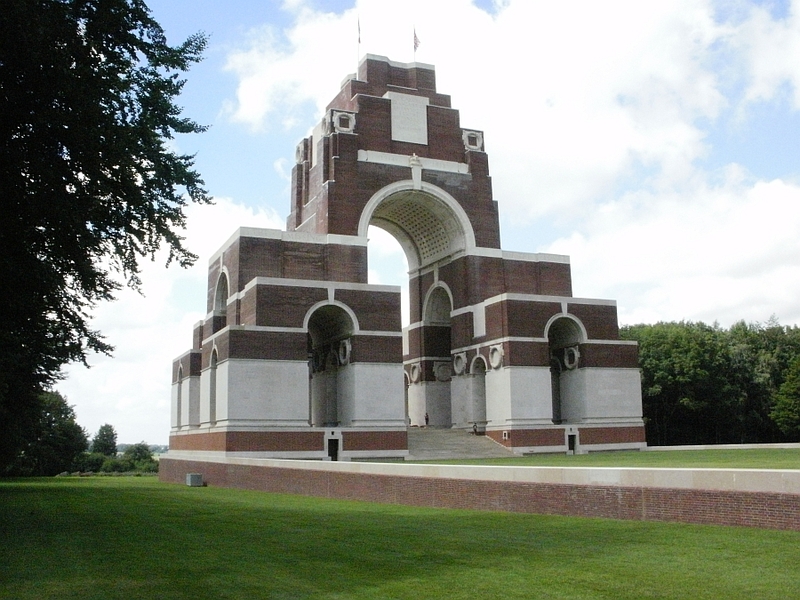 On 1st July 1916 British and French forces had attacked the farm in the hope of taking it, but it was a hopeless task as any advance came under fierce fire from the farm and the forces at Thiepval. 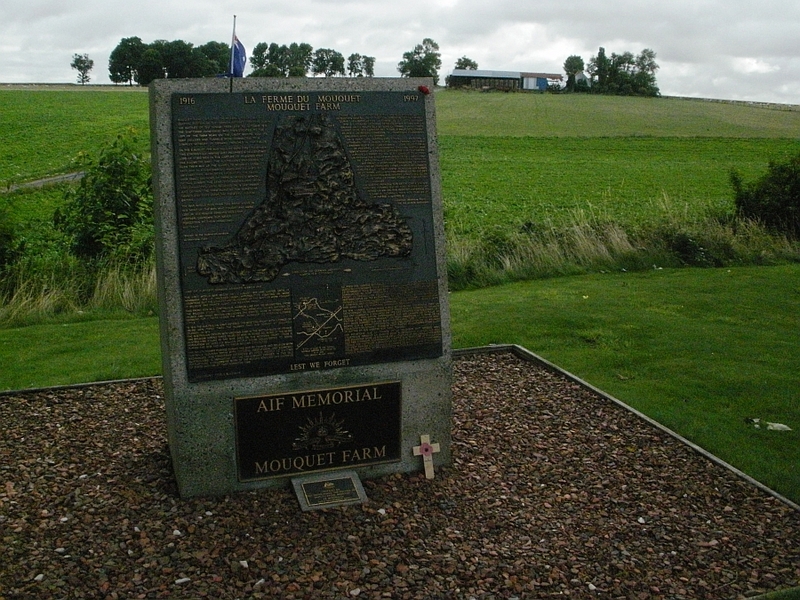 Mouquet Farm was known to the British as " Mucky Farm " and to the Australians as " Moo Cow Farm " If the allies suceeded in taking the farm then they would leave the heavily fortified German strong point at Thiepval in isolation. Many of the Australian's fighting here had also fought in the Gallipoli campaign, and had been thrown in to action on the Somme within a few days of their arrival in the area. They had fought and took Poziers, before orders were given for them to attack Mouquet Farm. The first of their attacks began on 8th August 1916, and by 3rd September 1916 they had made a further 8 more attempts. On 5th September the Australians were withdrawn, having faced fierce resistance from the German defenders. 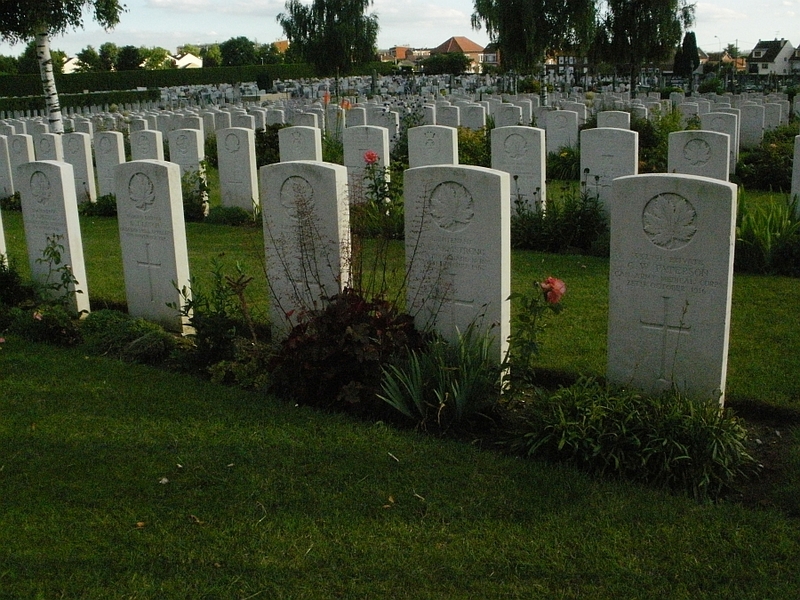 The Australian casualty list had amounted to almost 11,000 men. Mouquet Farm. 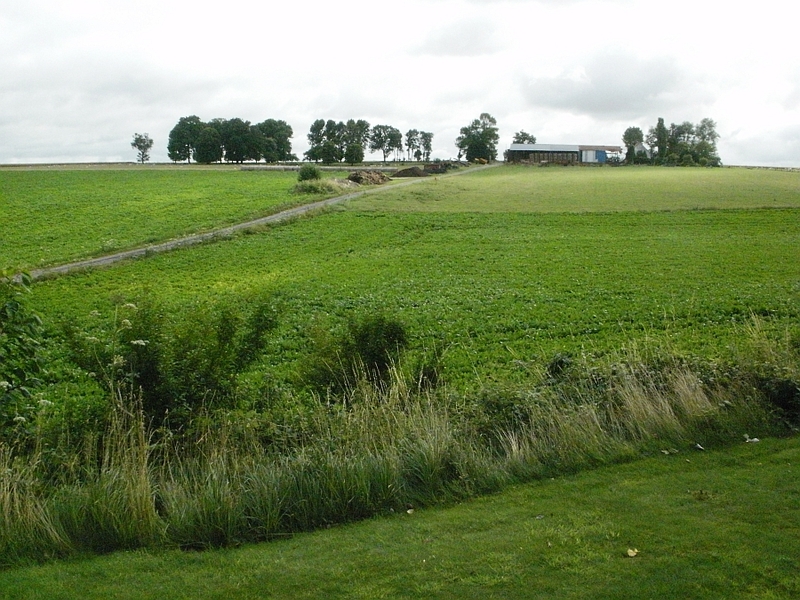 The original Farm was located in the trees to the left of the above photo, it was raised to the ground during the fighting. The Australians were attacking from the right of the photos above and below. 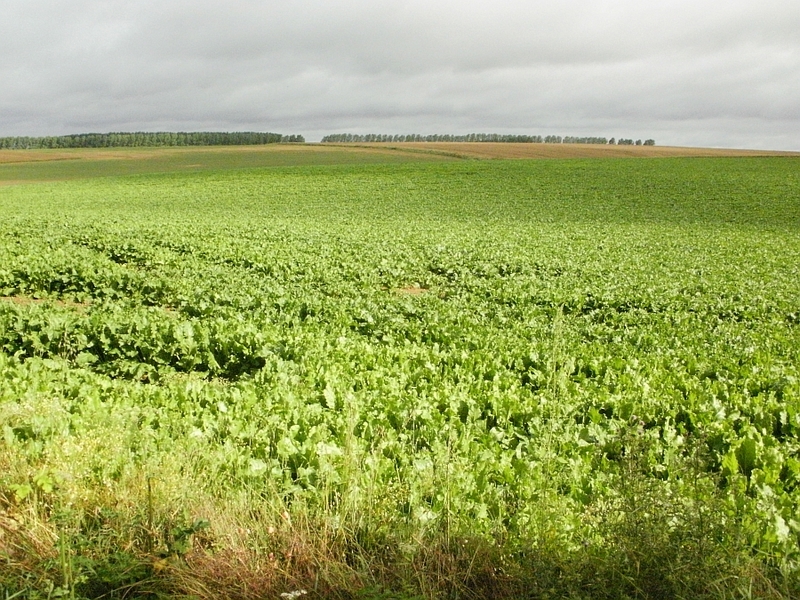 Looking from Mouquet Farm towards Thiepval. Do you see the memorial between the trees? No trees back in 1916, just a clear view, you can see how well defended the Germans had this place. The link below will take you to a diary story from Percy Nuttall who fought in the Battle for Mouquet Farm. 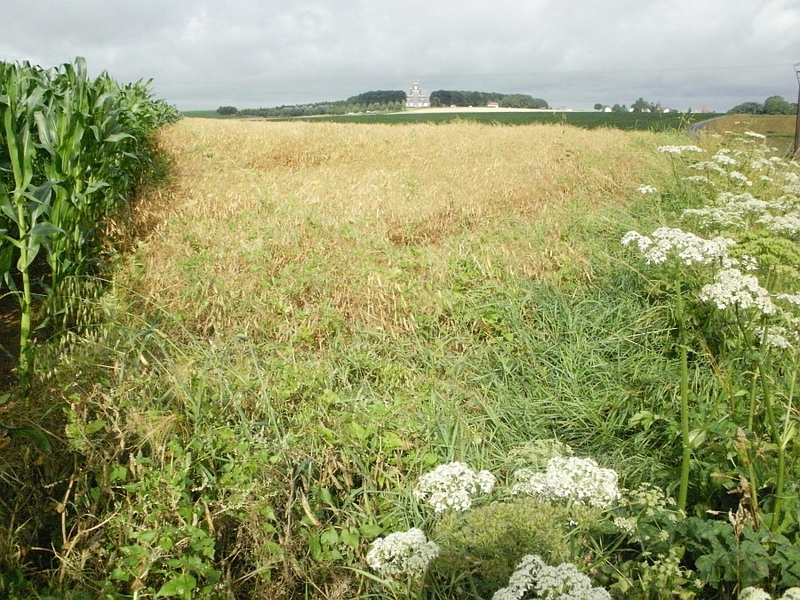 The fields to the left of Mouquet Farm. So scenic, but one filled with nothing but horror. 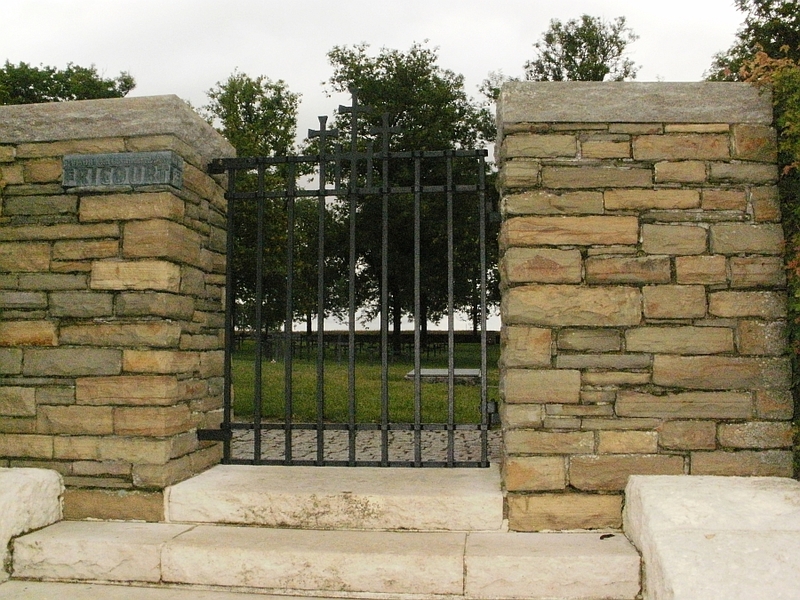 Gate Posts at the entrance to the Ulster Tower, Thiepval. The Ulster Tower, dedicated to all the men of the 36th ( Ulster ) Division. It is a copy of Helen's Tower in County Down, Ulster, where the men trained before leaving for war. It was unveiled on 19th November 1921, stands 70 feet in height, and is built upon the German strong point of Schwaben Redoubt that the Ulstermen attacked. 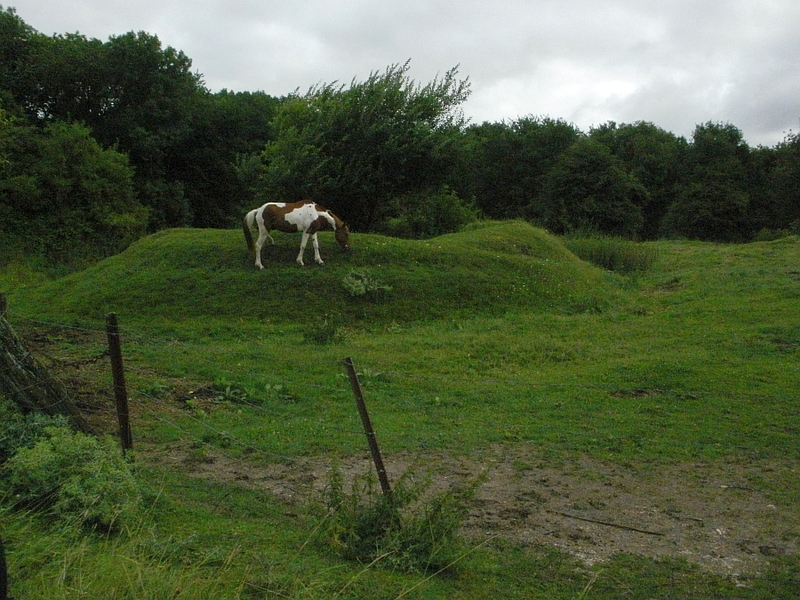 The Schwaben Redoubt was called Feste Schwaben by the German Army. 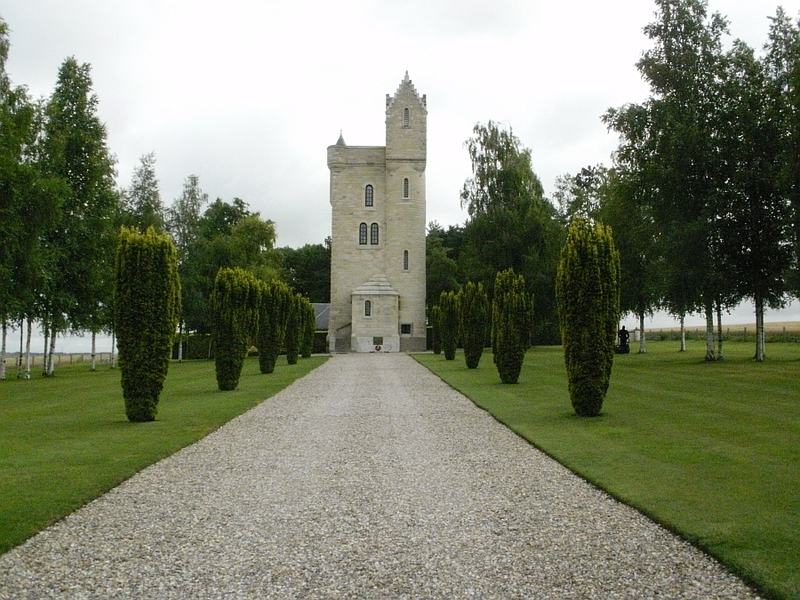 The tower stands impressive in wonderful landscaped gardens, a memorial to the men of the Ulster Division and a reminder of what took place here. On 1st July 1916 the men of the 36th Ulster Division climbed out of there trenches and moved forward. The British artillery had damaged the German front lines and with the Ulstermen moving quickly they passed through before the defenders had the chance to respond. They took many prisoners, but the German artillery had them in their sights and began to fire upon them. Men ordered to take back the prisoners to British front lines now found themselves racing with the captured men away from the German artillery barrage, to those back at the front it looked light a German counter attack and fire was set upon them. Those up head then moved into the Schwaben Redoubt and took it after fierce fighting. 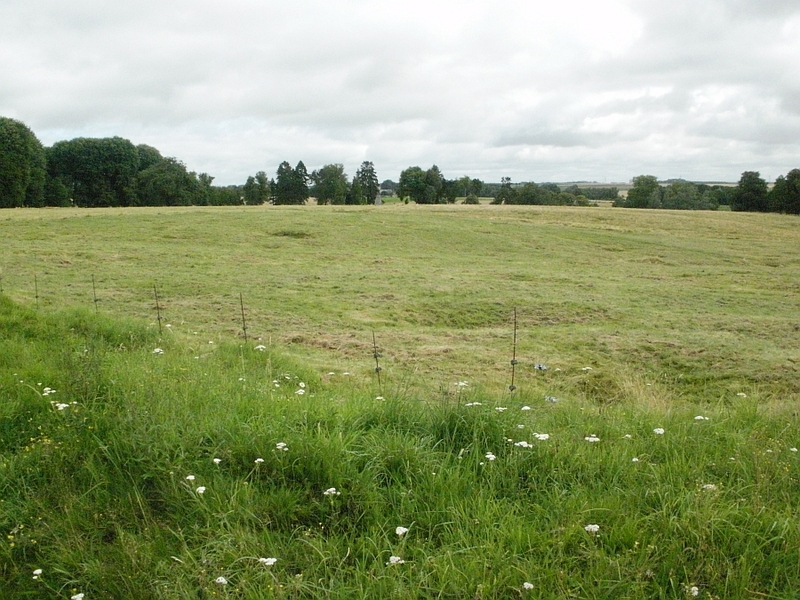 The Ulstermen continued forward towards the Stuff Redoubt and almost reached the German field gun positions, in all they had advanced almost one mile from their starting point. The problem for them now was that the Divisions attacking on their flanks had not met with the same success, so the Ulstermen found themselves cut off and alone. They could not retreat back across no mans land as the German's were pumping it with artillery and machine gun fire, and nobody could reach them to bring supplies. Their situation was becoming hopeless, yet they held out for most of the day. With no supplies getting through their ammunition began to run low, the men needed water to drink and the Germans were mounting counter attacks. Bit by bit the fell back, by 10 pm that night they had been forced back to the basically were they had started. They had fought bravely, but not without cost. 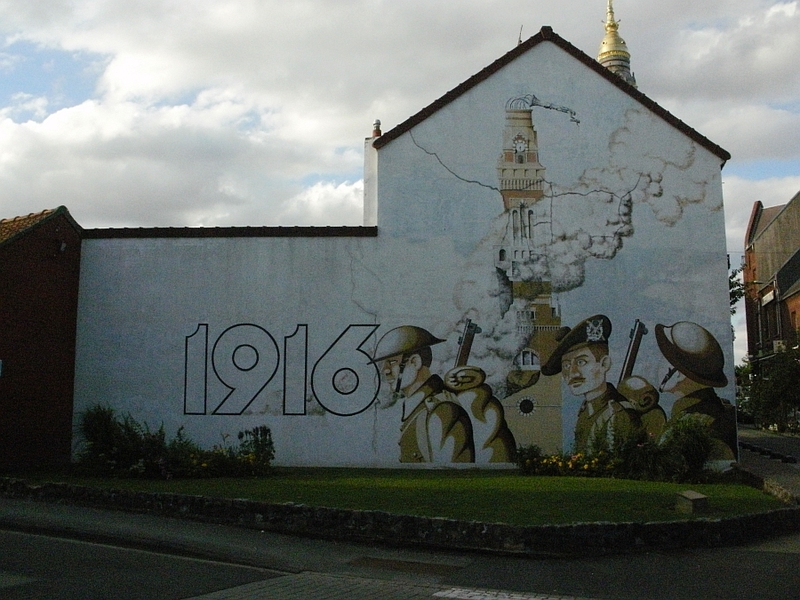 At the end of that first day of The Somme, the 36th Ulster Division had suffered almost 5,000 casualties. 79 officers and 1,777 other ranks were killed, 102 officers and 2,626 other ranks lay wounded, 7 officers and 206 other ranks were missing, and 11 officers and 164 other ranks had been taken prisoner. Of the 9 Victoria Crosses awarded on the first day of The Somme, 4 went to men of the 36th Ulster Division. 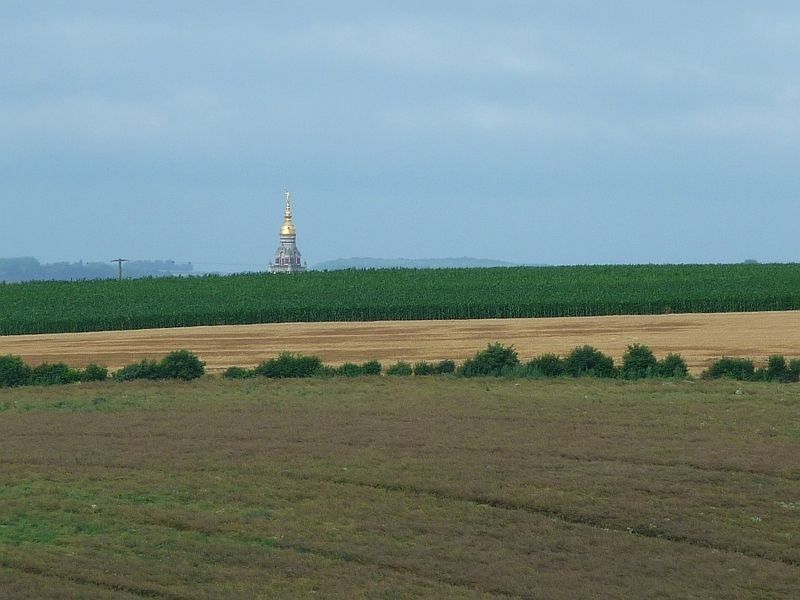 Looking from the road next to the Ulster Tower towards Connaught Cemetery ( notice the cross of sacrifice ) Behind the cemetery is Thiepval Wood, it is from here that the 36th Ulsters launched their attack on 1st July 1916. They moved out of those woods and across that field during their advance. Of course the woods back in 1916 were nothing more than stumps. 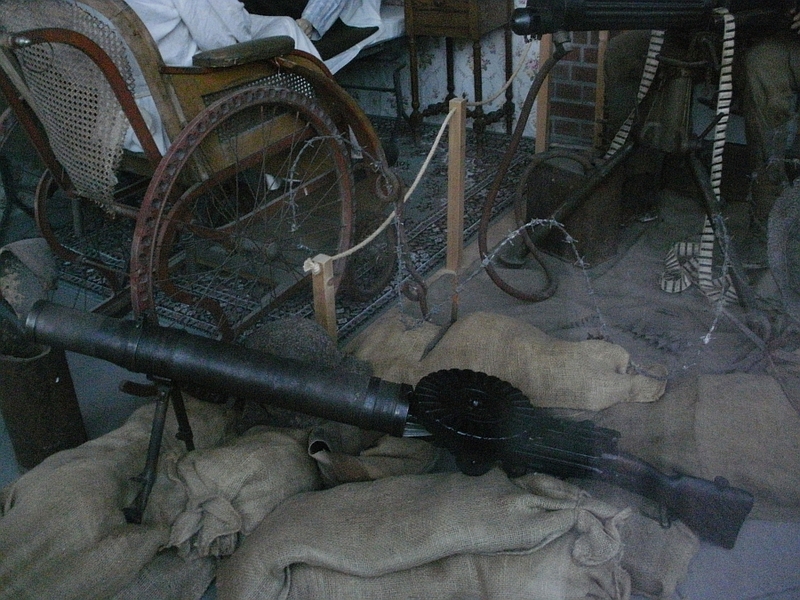 Artifacts from the battlefields on display outside the cafe at the Ulster Tower. A stack of shells. 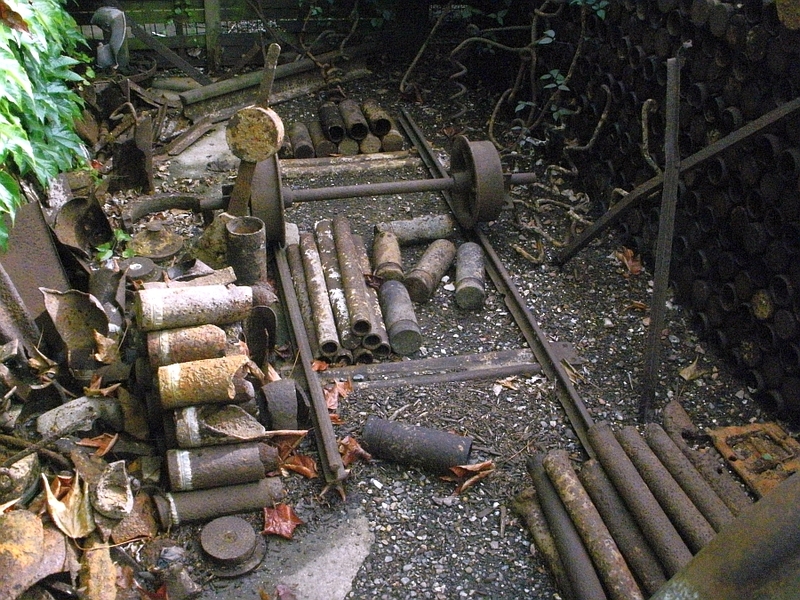 Lots more shells to be seen as well as part of the track from a light railway. The Orange Order Memorial in the grounds of the Ulster Tower. Looking from the Ulster Tower over the fields towards Mill Road Cemetery. Looking from the Ulster Tower down towards the Ancre Valley. As you can see the Allies were almost always attacking uphill. 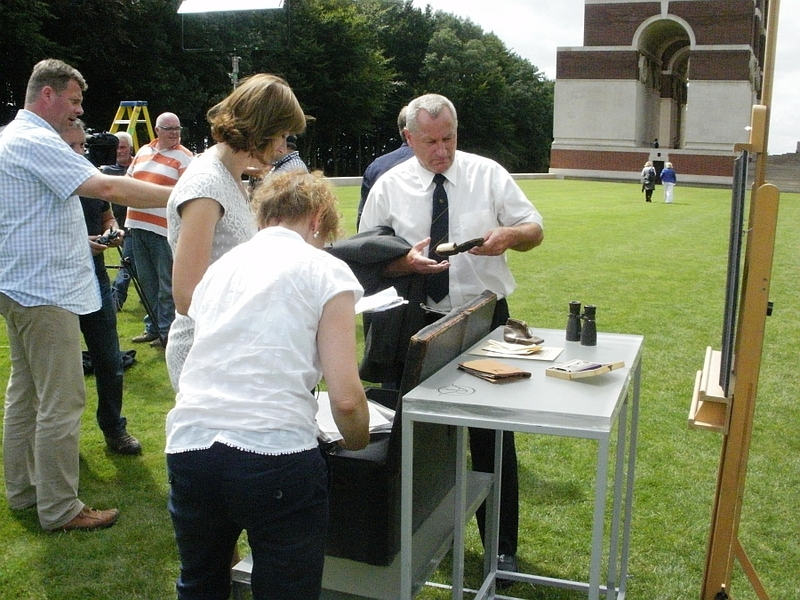 The Link below gives good information about the Ulstermen and the events of 1st July 1916. 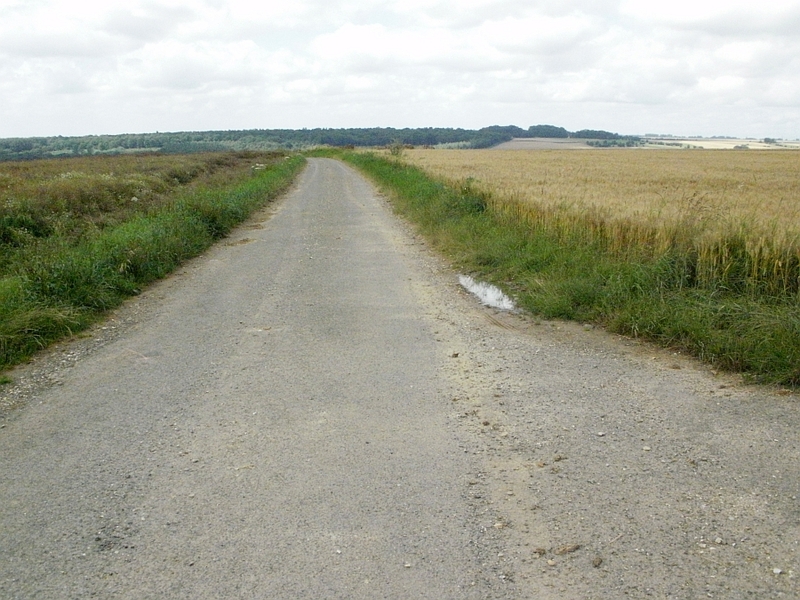 We then drove down through the Ancre Valley, over the River Ancre, and up towards Beaumont Hamel. Back in 1916 the Germans had flooded the Ancre Valley as a defence against attack. We moved on towards our next destination, the Newfoundland Memorial Park. Sadly by now our time was running short and we did not have a lot of time to spend here. I would have gladly spent the best part of the day at the Newfoundland Memorial Park as there is so much to see, but I am happy that I spent some time on a visit. Just as you enter the park you see the 29th Division Memorial, it is dedicated to the men of the the Division who fought from this area. The Newfoundland Regiment fought with this Division. 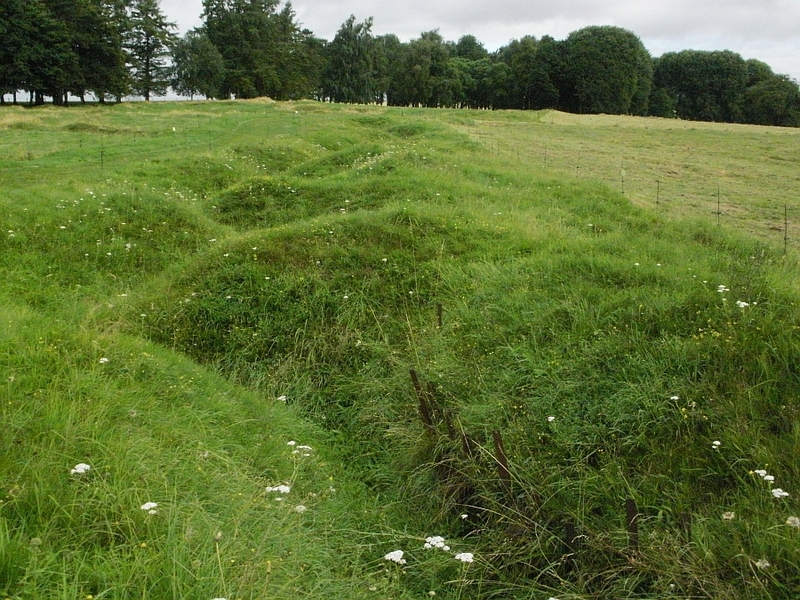 As you continue in you start to see the remains of trench systems, these trenches are believed to be the St John's Road support trenches. The land here was purchased in 1921 by Newfoundland and was named after the Newfoundland regiment who suffered terrible losses here on 1st July 1916. The Memorial Park was opened in 1925 with the intention of preserving the battle ground and trenches in memory of those who fought here. Today it is the largest area of the Somme battle ground that has been preserved, with most of the area remaining untouched since WW1. Newfoundland looked after the park until 1949 when it became part of Canada. The Canadian government has since maintained the memorial park. Looking towards the Caribou Memorial. 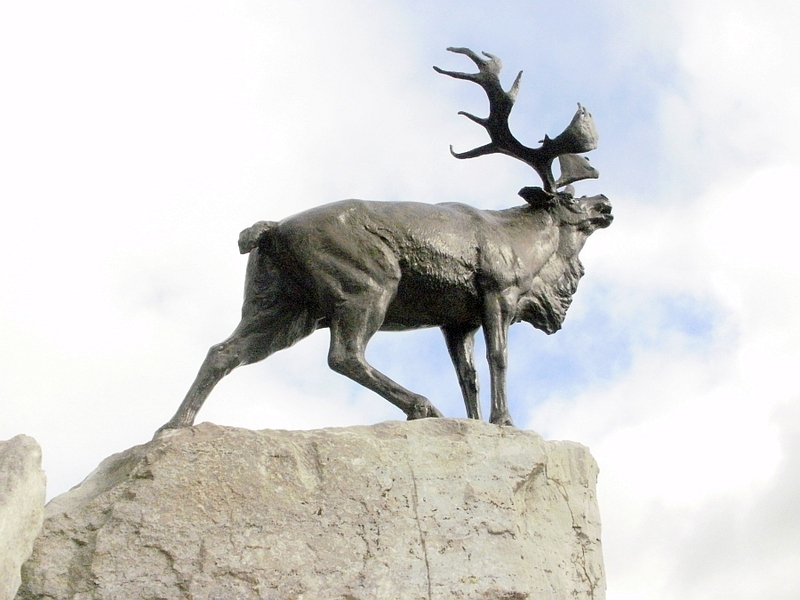 The Caribou is the emblem of the Newfoundland Regiment. It stands on high ground and is covered with plants native to Newfoundland, many of the trees within the park were transported from Newfoundland. The memorial marks the spot from where the Newfoundland Regiment began their attack on the morning of 1st July 1916. Beneath the Caribou are the Bronze panels that hold the names of more than 800 Newfoundland men who died in WW1 and have no known grave. They include the names of Newfoundland Mercantile and Naval men who remain missing. A small number of the men listed on the memorial have been found and identified over the years and are buried in nearby cemeteries. 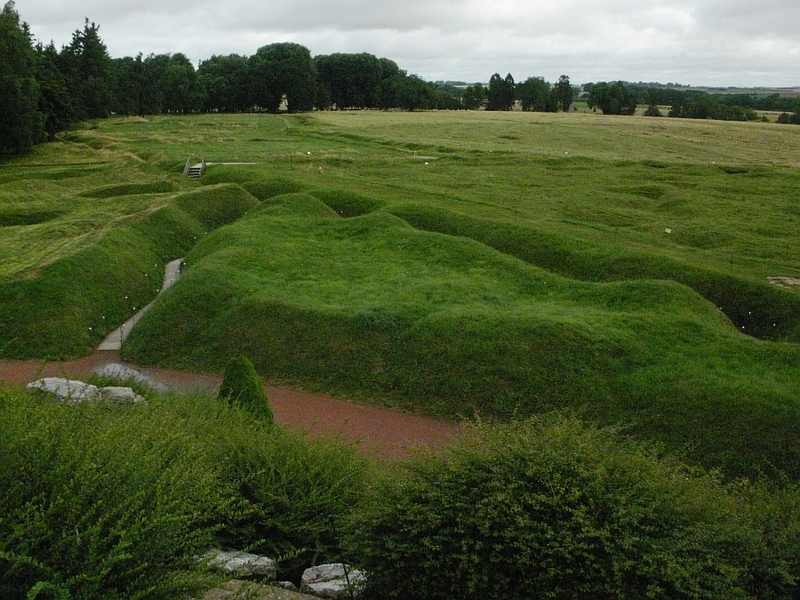 A winding path on the memorial gives you access to it's top and allows you to look out over the trenches and battleground. 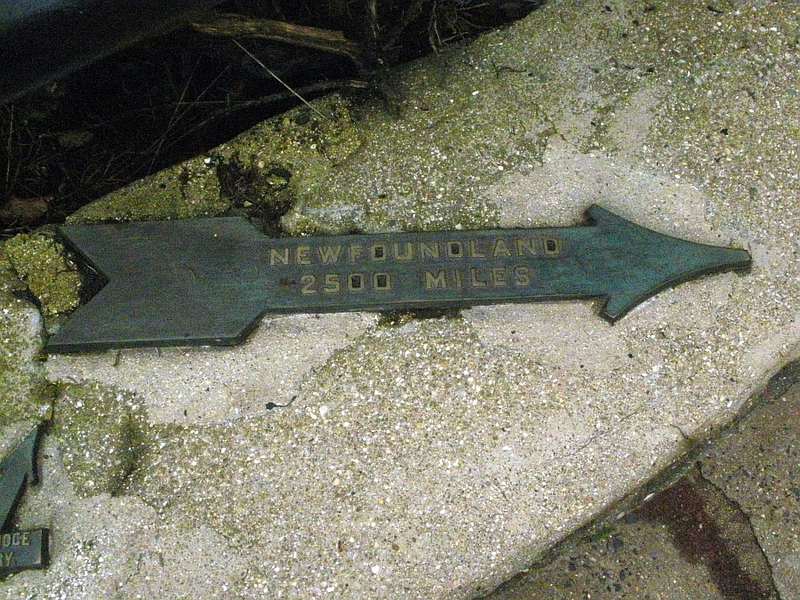 Above is the Caribou and below an arrow giving directions and distance to Newfoundland. 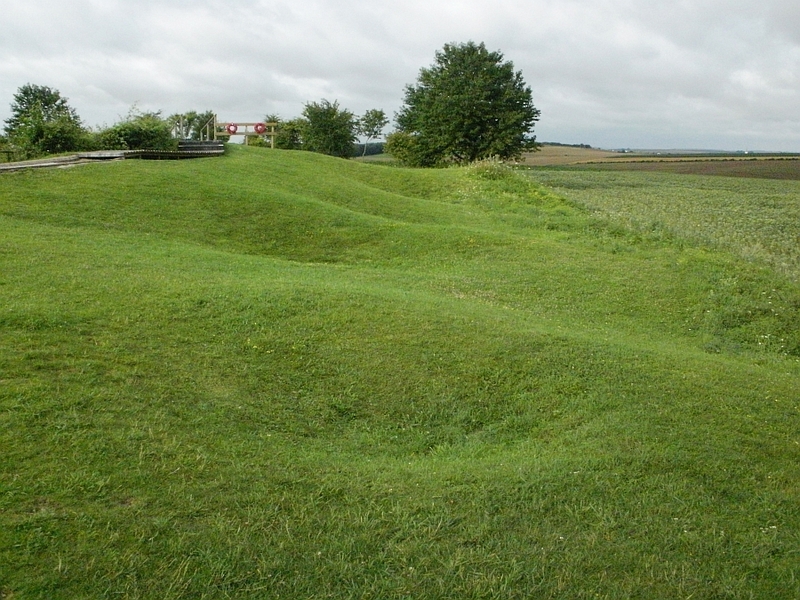 From the top of the mound you get an excellent view over the network of trenches and the battlefield. The lighter circled area is No mans land, the trees to the rear of the photograph are where the German trenches are located. At 7.30 am on the morning of 1st July 1916 the attack on the German lines began. 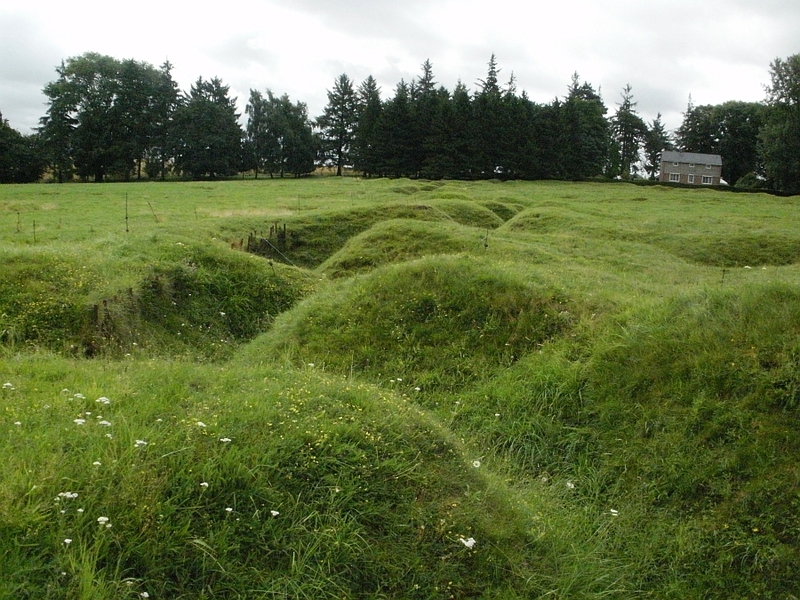 The Newfoundland regiment were not in the first wave of attack, they were being held in preparation in a support trench named " St John's Road " behind the front lines. 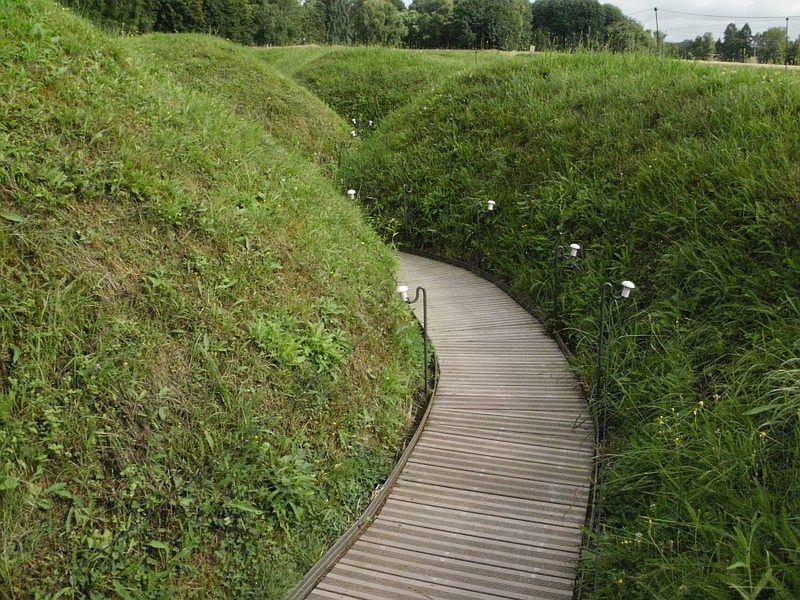 At 8.45 am they moved forward after receiving orders to advance and found trouble trying to navigate through the communications trench to the front lines as it was hampered by bodies of the dead and under shell fire. 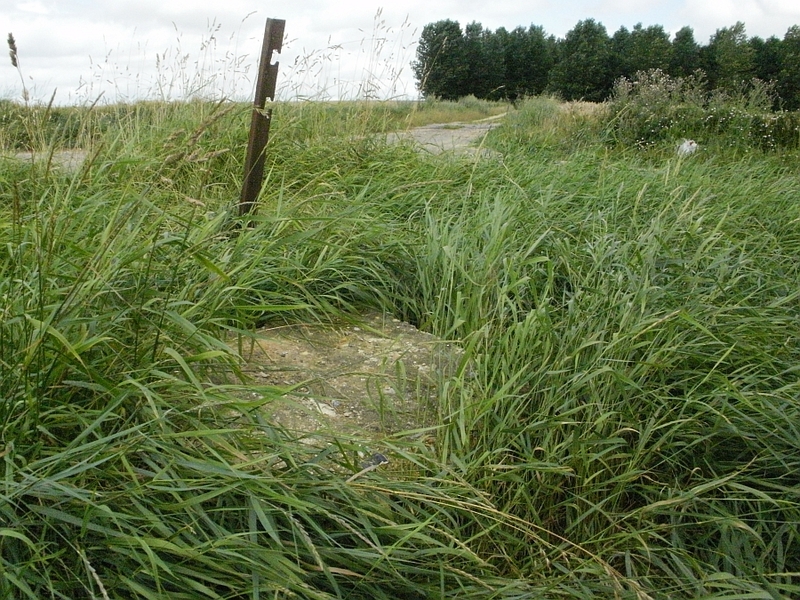 The decision was taken to climb up from here and go along the surface into attack, first having to find their way through the allies own barbed wire defences. It was a disaster for the Newfoundlanders, for when they jumped up they became the only men moving on the surface, add the barbed wire and they were an easy target. Some of the men managed to reached No mans land, but within 30 minutes it was all over for them and the attack ceased, their casualties were devastating. You can see from these photographs the land and terrain that they had to cross. After serving in Gallipoli, this was the Newfoundland Regiment's next and biggest engagement in a major battle, and it came at a huge cost. Their strength was almost 800, yet in just under 30 minutes every one of their officers and most of their other ranks were dead or wounded. Only 110 men returned with no injury, and of these only 68 were able to make roll call the following morning. We can only imagine how emotional and soul destroying this must have been for the men standing there, hearing so many names called out with no reply. 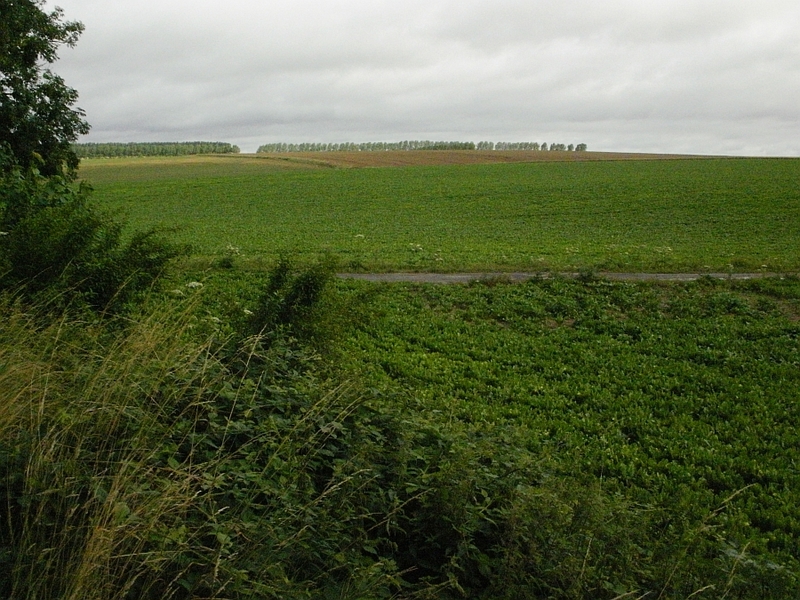 Looking across the battleground towards the Front line trenches, No mans land, and the German front line. 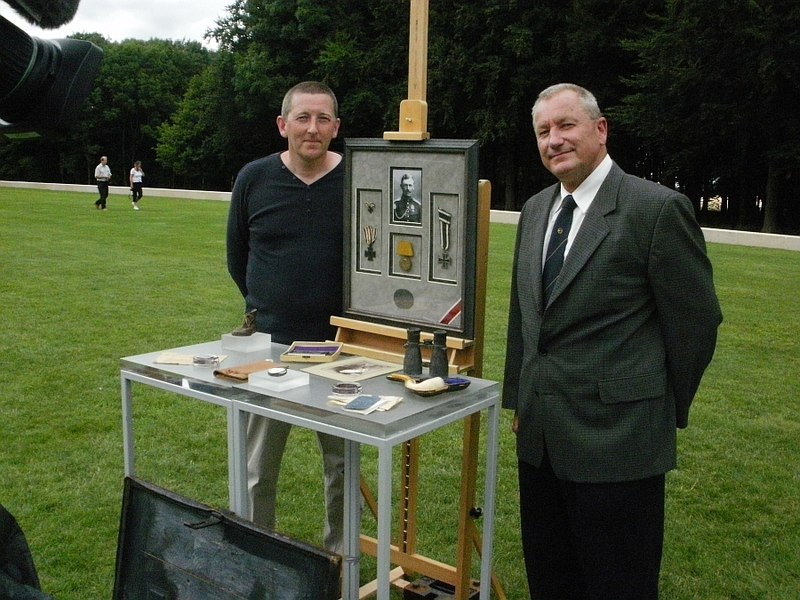 The German's serving opposite were from the 119th (Reserve) Infantry Regiment. The cemetery you see in the distance is Y Ravine Cemetery. 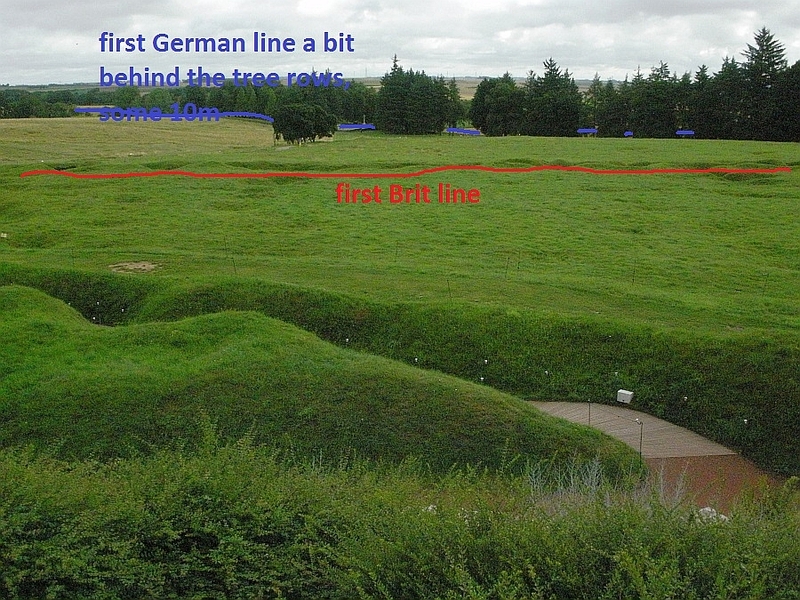 Below Egbert has kindly added details of the front line lay out to the photograph. 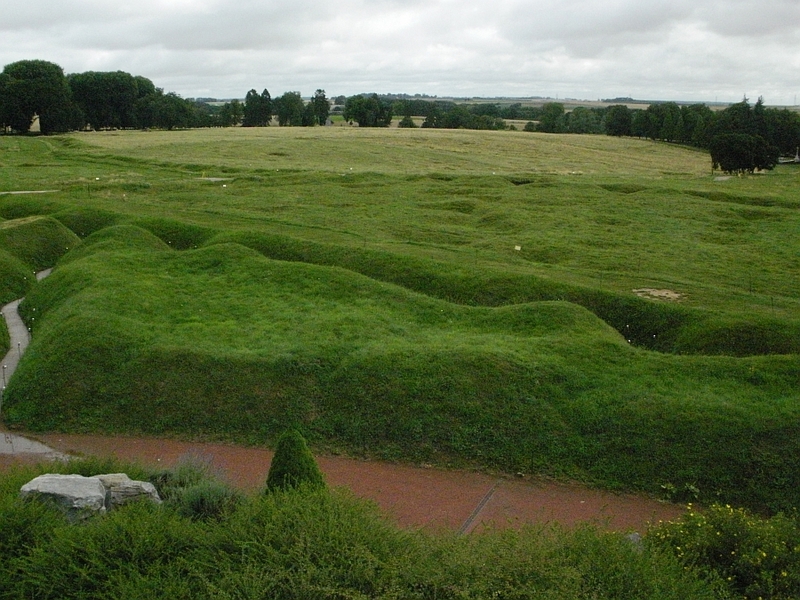 Looking to the right from the top of the memorial you can see the trench system and shell holes. 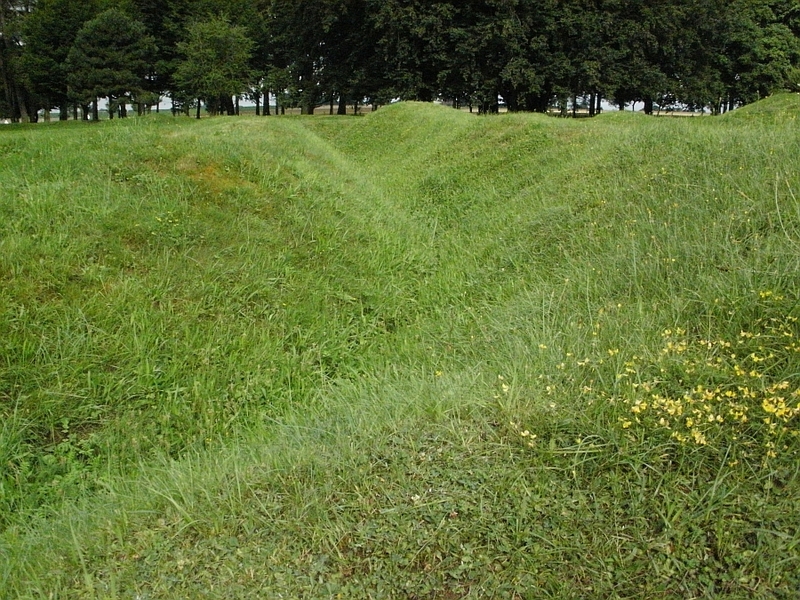 It is hard for us to understand just how hard this ground was to move across during a battle, no grass just earth from shelling, no trees, you are in clear view, machine guns, shells, sniping, the confusion and madness of it all. Looking back from the mound away from the front lines towards the support trenches, could the long trench be the communications trench that the Newfoundland Regiment found trouble in passing through? Back on the ground we enter a trench and move towards the front line. An easy stroll for us, but a nightmare back in 1916. 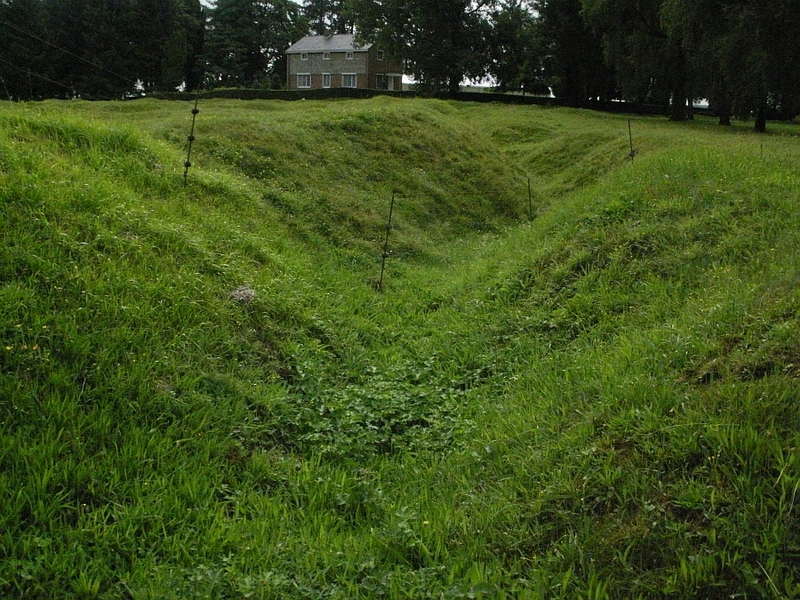 The Front Line Trenches. You can still see the metal from the boards used to support the trench wall. 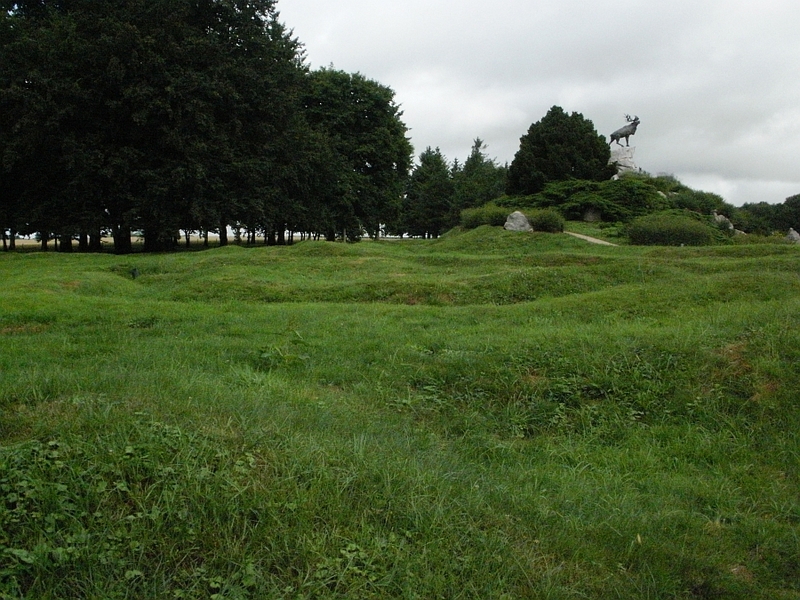 Looking back at the Caribou Memorial from the front lines. The park of course is named after the Newfoundland Regiment who we have mentioned, yet many other allied and Greman regiments fought here. The Newfoundlanders were part of a British Division and fought with the British Army not alongside it. 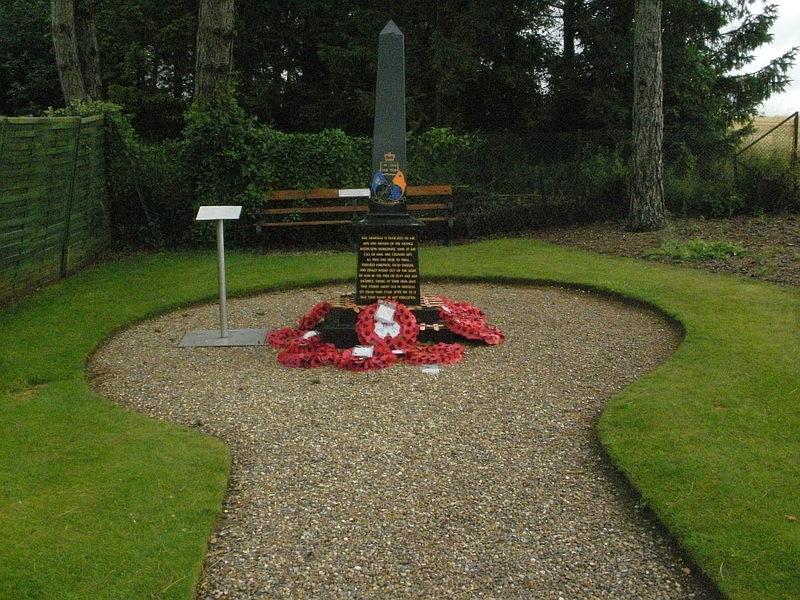 We have seen the 29th Division Memorial photo earlier, and in the park can also be found the memorial to the 51st Division along with three commonwealth war cemeteries, Y Ravine Cemetery, Hunter's Cemetery and Hawthorn Ridge No.2 Cemetery. 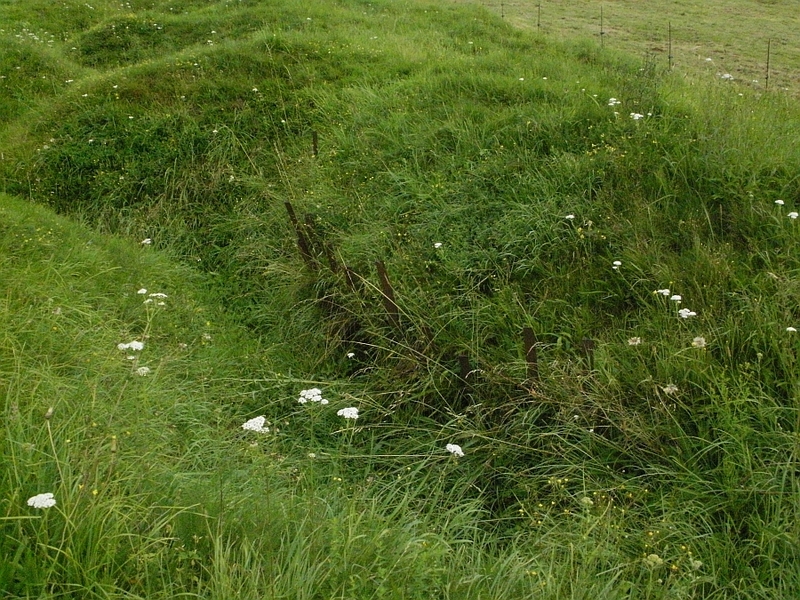 Front line trenches, again you can see the remains of the trench support boards. The park remembers all men who fought within this area during the war including French and German men along with those of the Commonwealth. No Mans Land. To me the saddest part of any battle ground I see. These fields ran red with blood, so so sad. Rest in peace all. The distance across No mans Land, so near, yet so far. Notice the allies had the rare task of attacking on a downward slope here. Below looking across to Y Ravine Cemetery and the German front lines. The 51st Division broke through and captured these positions on 13th November 1916, shortly after the Battle of the Somme ground to a halt, the cost to all sides had been horrific. A little bit interesting information on the link below. 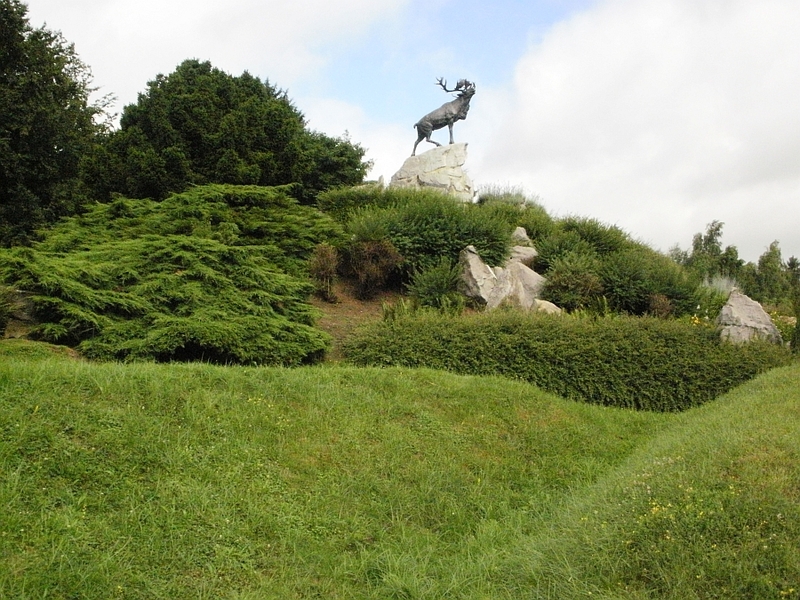 If I ever find myself in the area again then I would like to spend a few hours exploring the Newfoundland memorial park. I only had the time for a quick visit, but what I saw will remain with me forever. 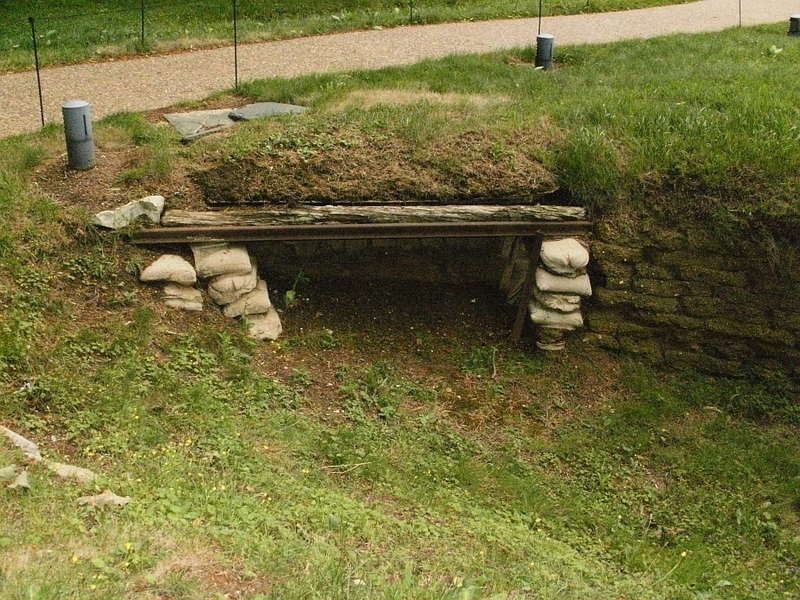 An old basic dugout at Newfoundland Park. We then had to nip back to the hotel to change for the afternoon events, driving back and forth past most of what we have seen here. 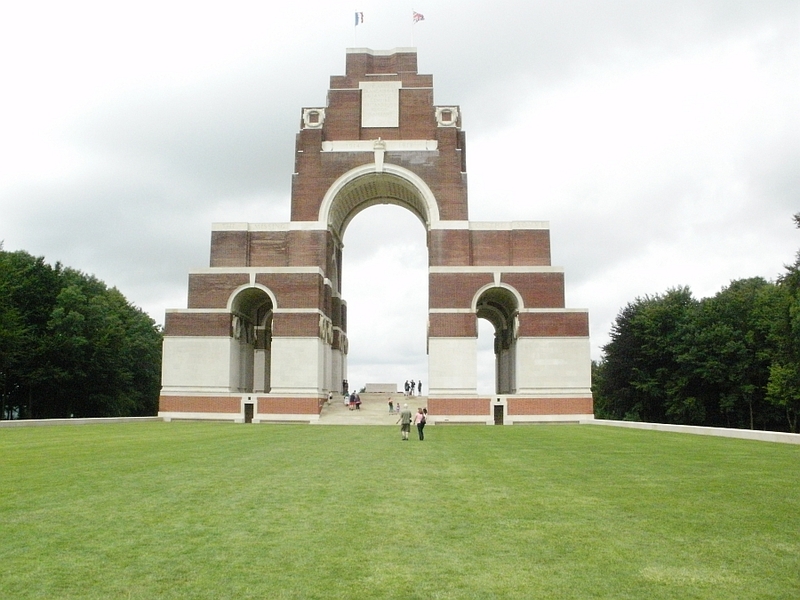 Then it was time to head to the memorial at Thiepval. 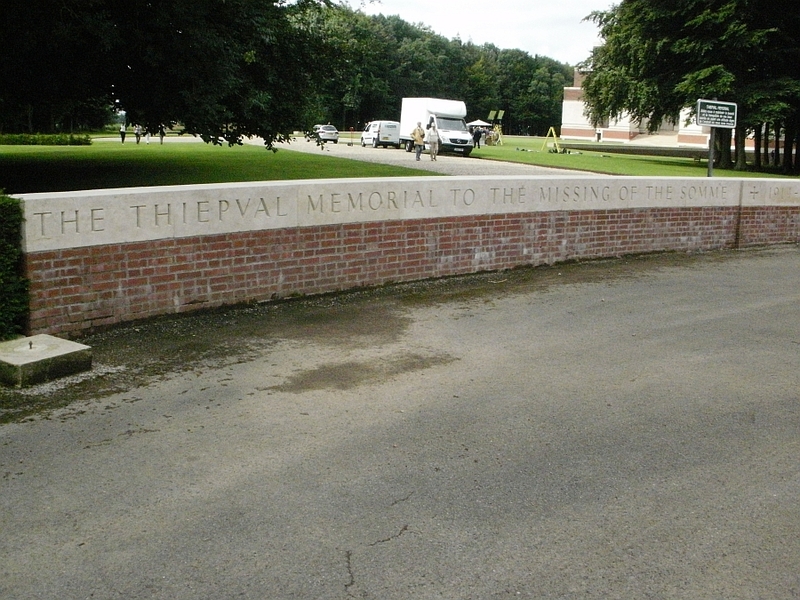 The entrance to the Thiepval Memorial. What is going on in the background? more about this in a while. 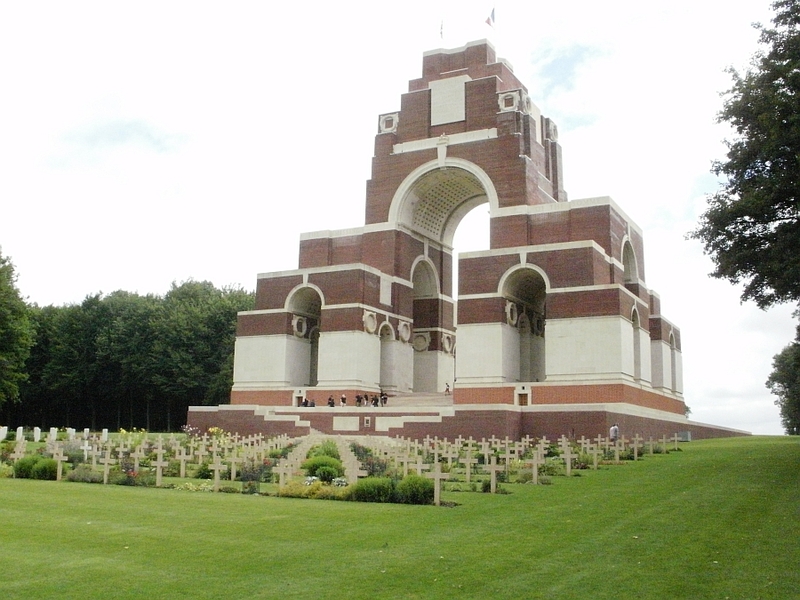 The Thiepval Memorial to those missing on The Somme. Standing 150 feet tall, it was unveiled on 1st August 1932. It Remembers over 72,000 men of the Commonwealth who died on the Somme between July 1916 and March 1918 and have no known grave. 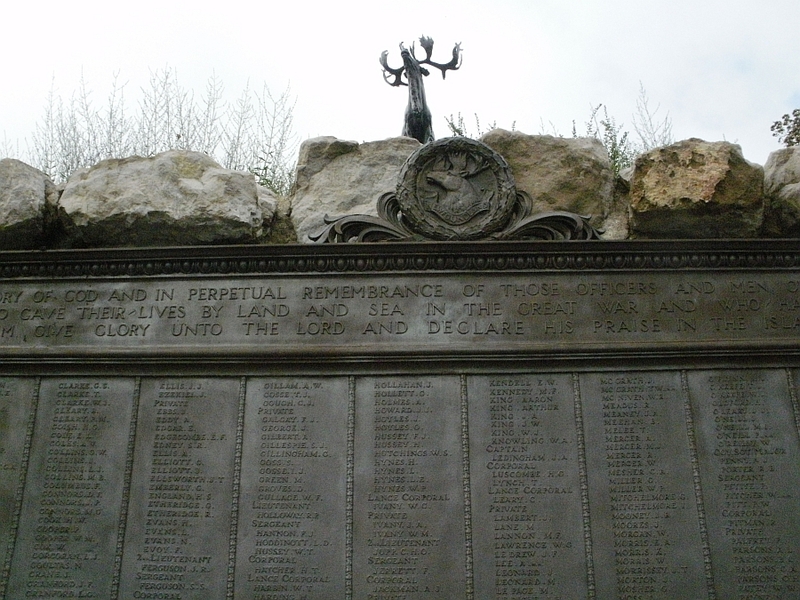 The memorial also holds the names of South African and Naval men who died on the Somme and have not been found. The youngest person mentioned is believed to be 14 year old Reginald Giles who served as a Private with the Gloucestershire Regiment. 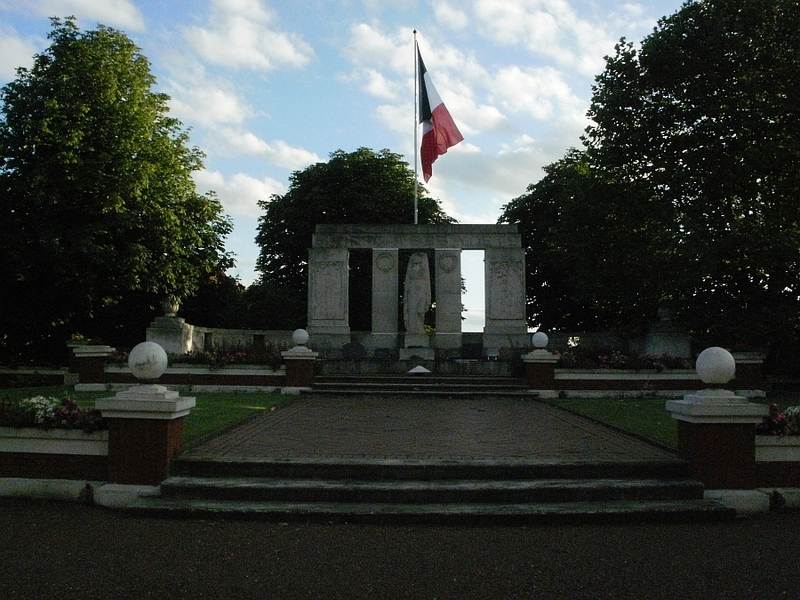 The French Tricolore and the Union Jack are flown on the top of the memorial. The French flag flies on the South side and the British flag to the North, this represents the area of the Somme that they fought from. The Union Jack represents the countries of the Commonwealth. 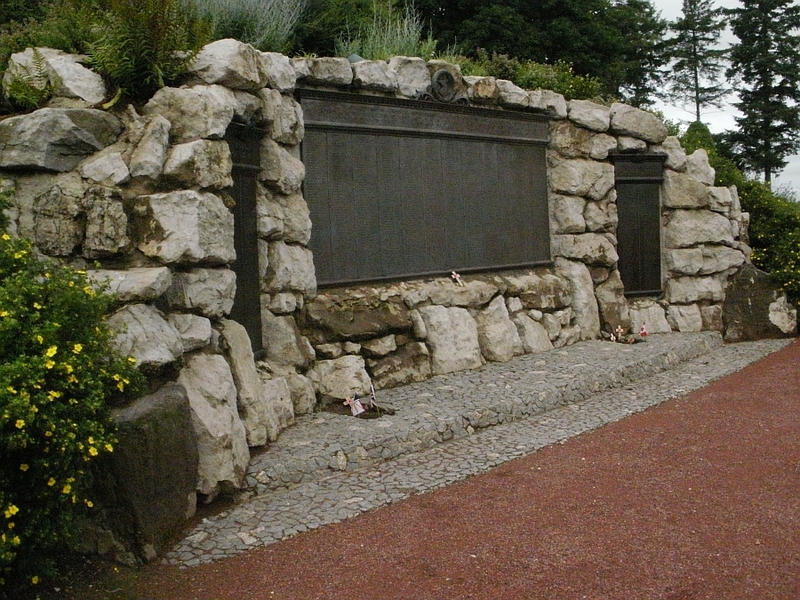 The 64 huge white stone panels bear the names of the missing, the wreaths above the stone panels carry the names of the major battles they fought in on the Somme. 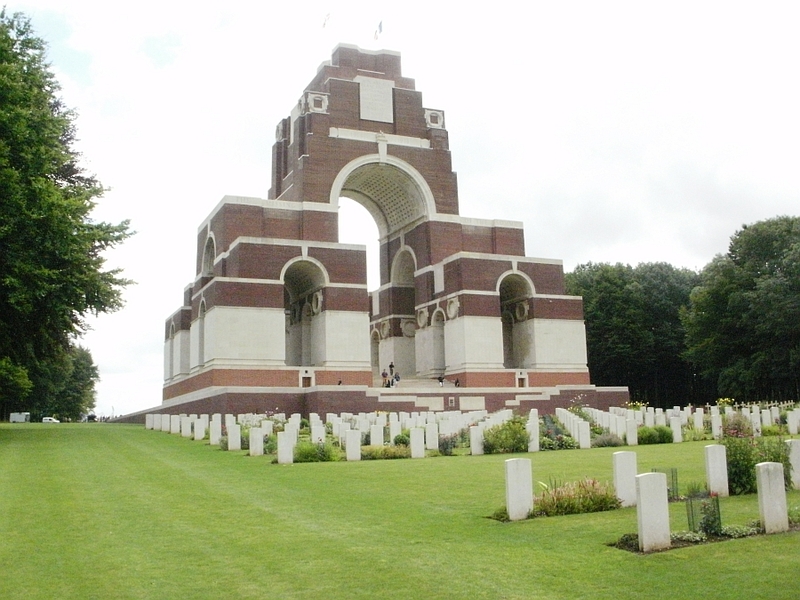 Behind the memorial is the Thiepval Anglo-French Cemetery. It was decided to honour the sacrifice of the French and Commonwealth soldiers with this cemetery at the foot of the Thiepval Memorial. 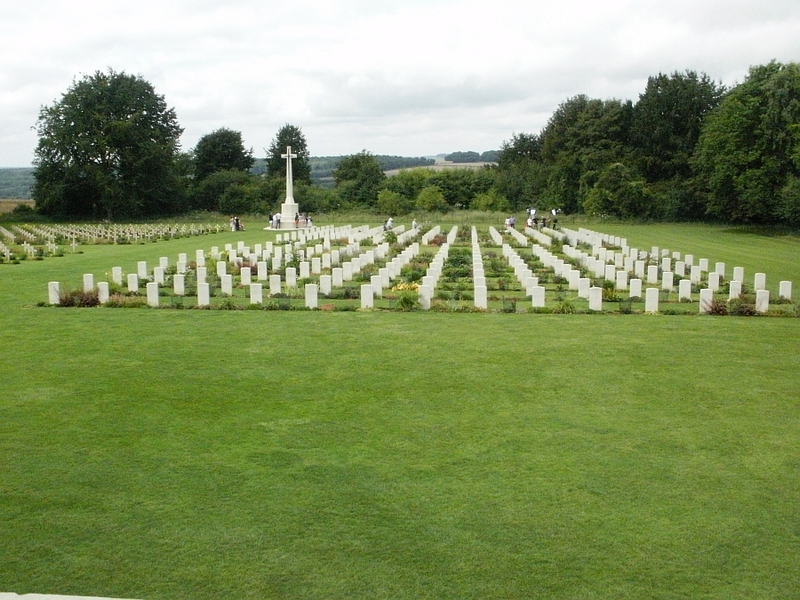 There are 300 French burials and 300 Commonwealth, lying side by side, the way they had fought. Most remain unknown, in the commonwealth section only 61 of the 300 are named. 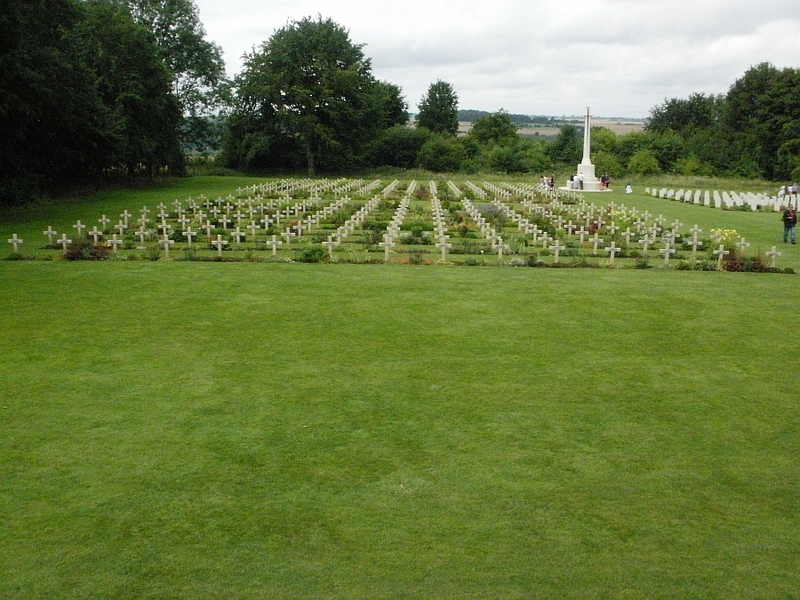 Thiepval Anglo-French Cemetery. 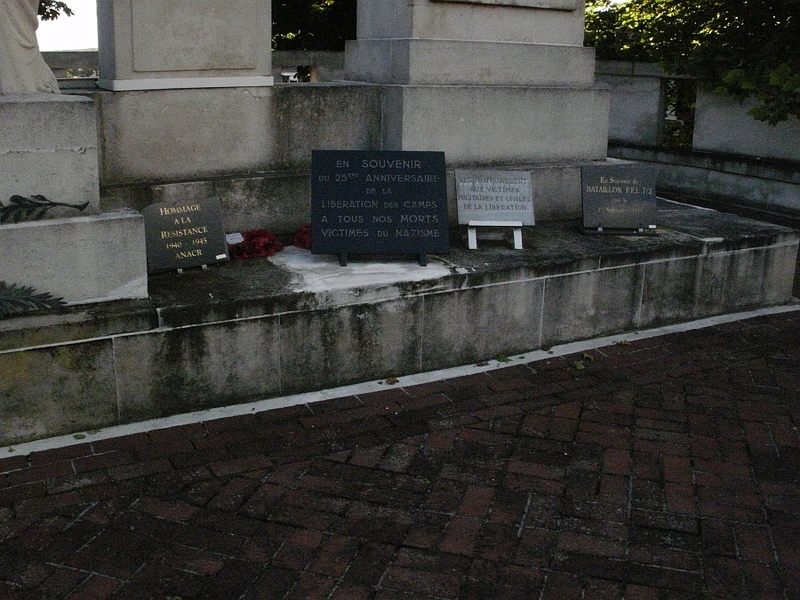 Commonwealth headstones above and French below. Looking across the French section of the cemetery towards the Thiepval Memorial. Look at the people for the scale of the memorial. 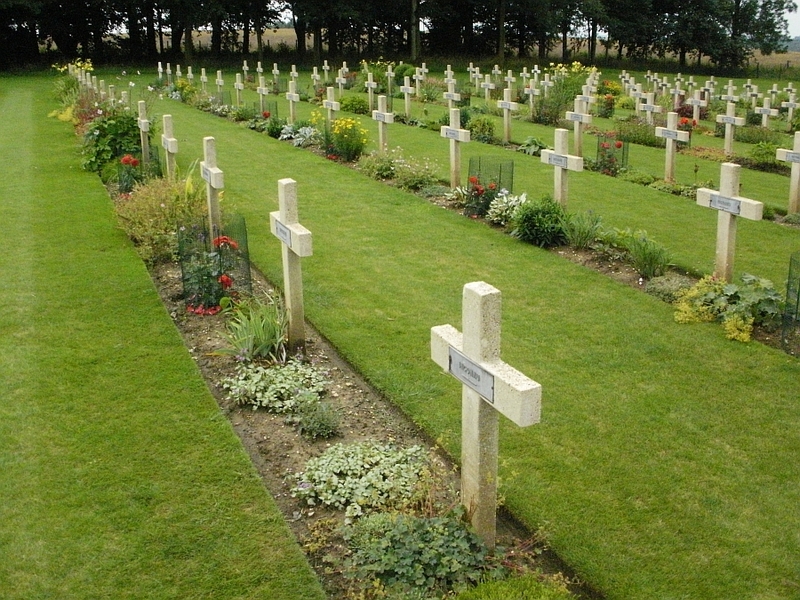 French graves with the commonwealth section in the rear. Repose en paix. Looking towards the Commonwealth section from a Frenchman's headstone. Thiepval Anglo French Cemetery. 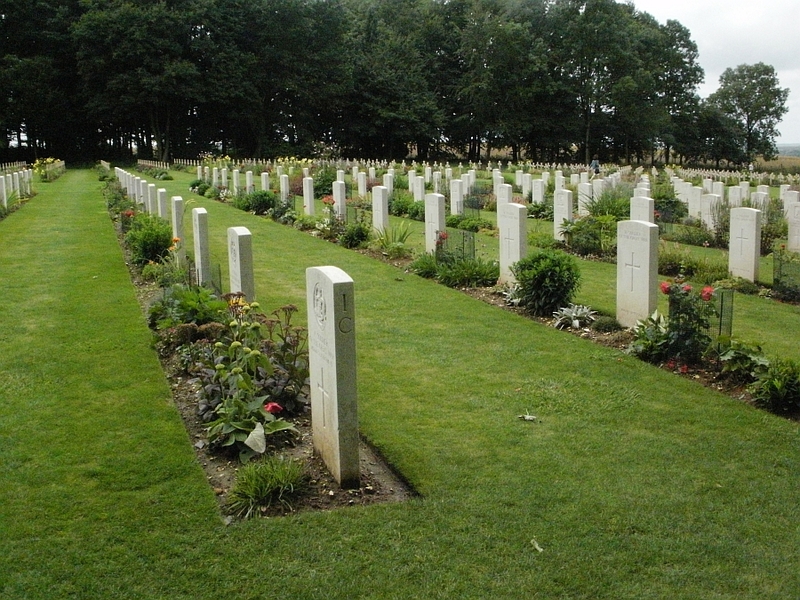 The French graves section above and Commonwealth graves section below. 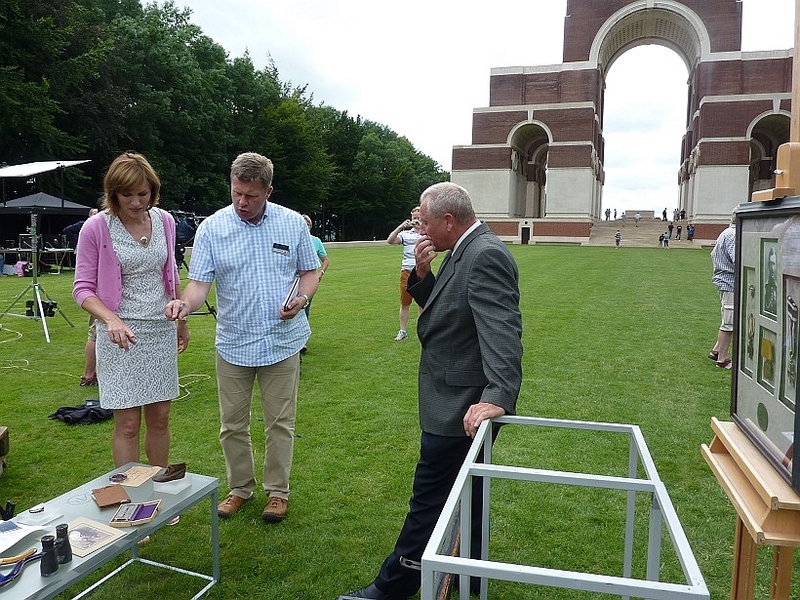 Two side on looks at the Thiepval Memorial. 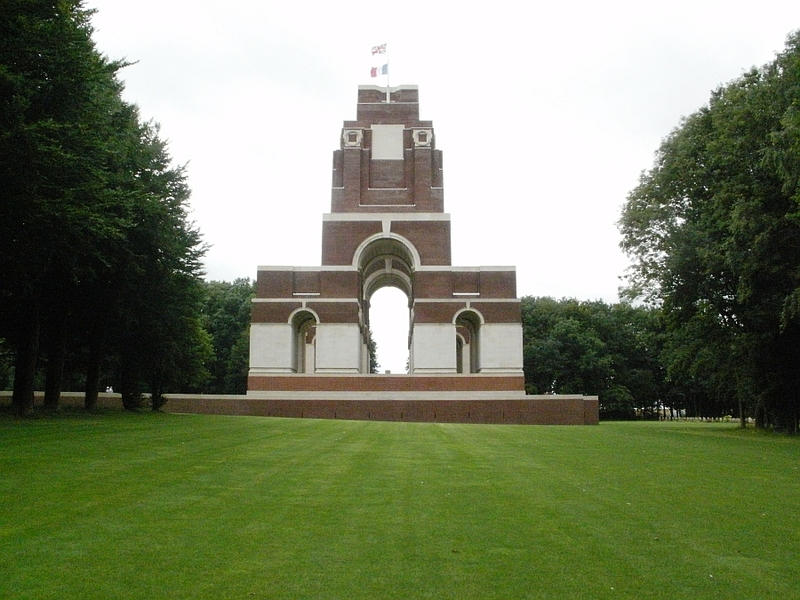 The 18th Division Memorial sitting close to the huge Thiepval memorial to the missing. 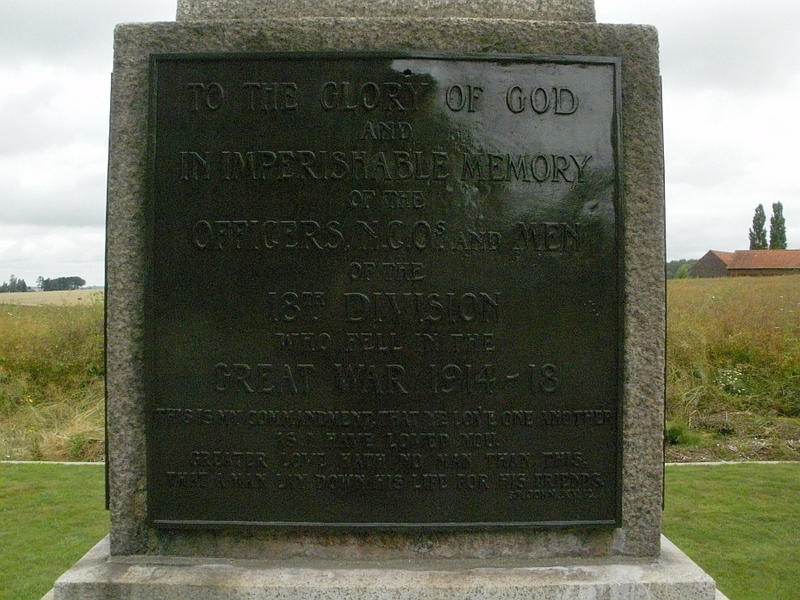 The memorial remembers the men of the 18th Division who fought here in September 1916 during the battle of Thiepval Ridge. 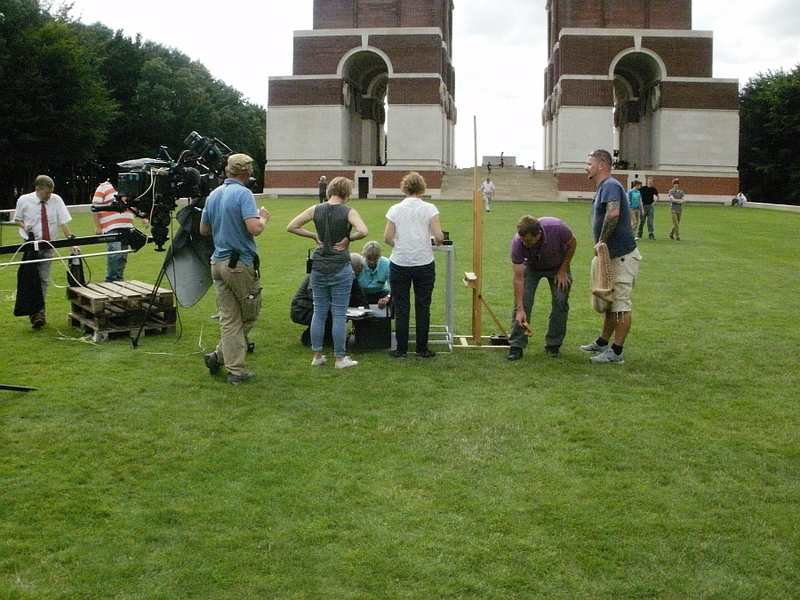 BBC advert for the filming of the show at the Thiepval Memorial. 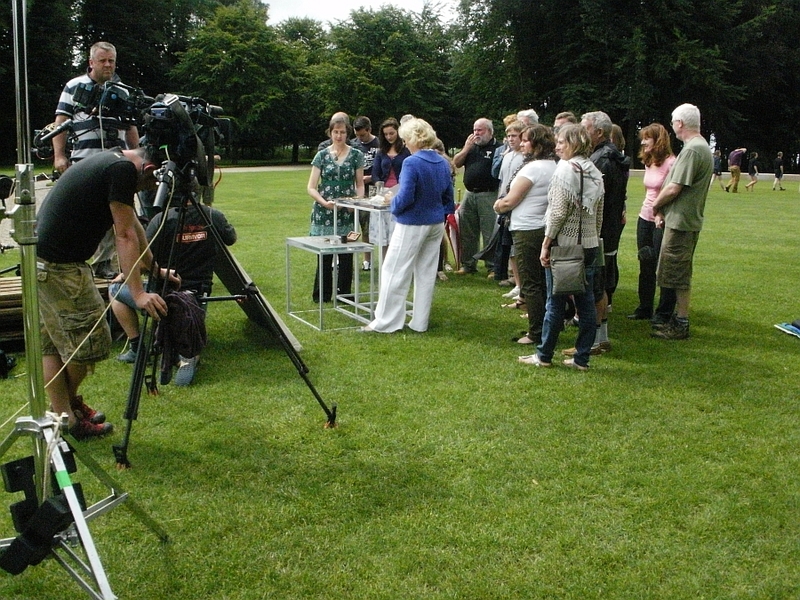 One of the story contributors being filmed for the show and interviewed by Hilary Kay. 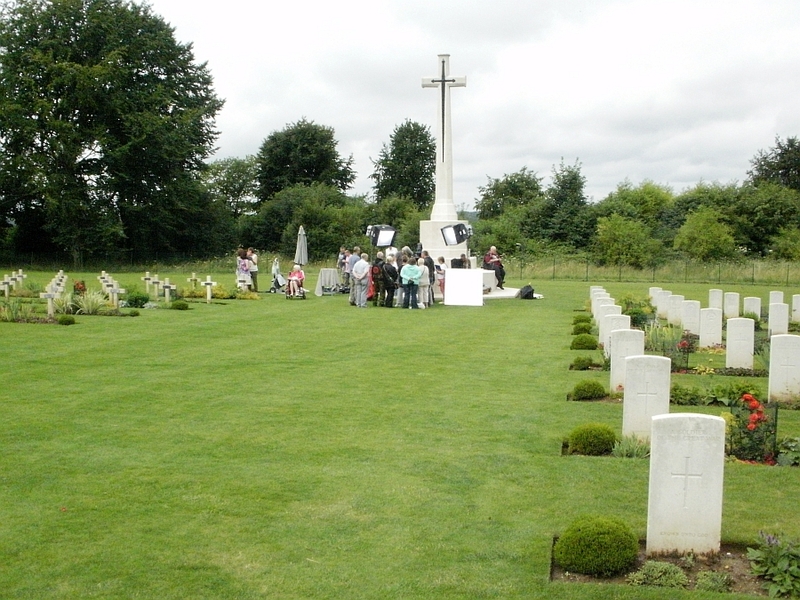 Another story being filmed next to the Cross of Sacrifice in the Anglo-French Cemetery. One of Egbert's photo from the steps of the memorial. 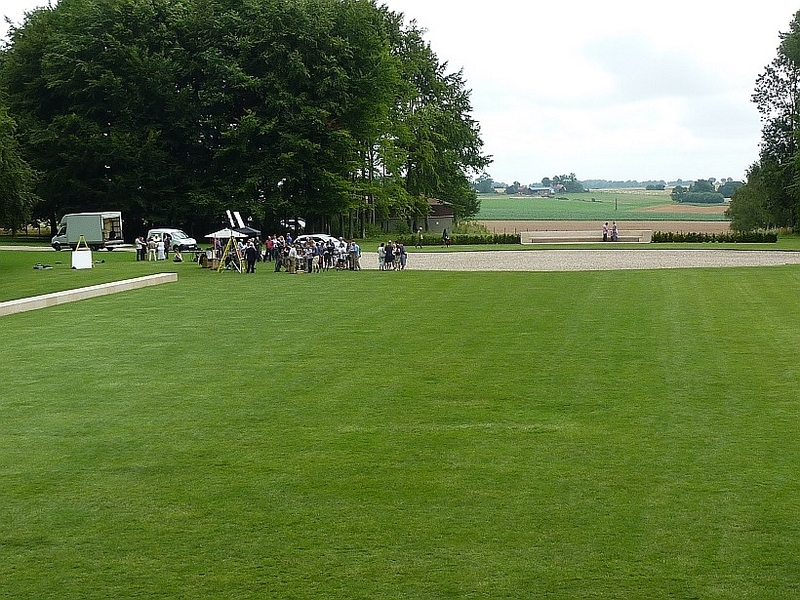 The BBC crew filming with Mouquet Farm in distance between the trees. 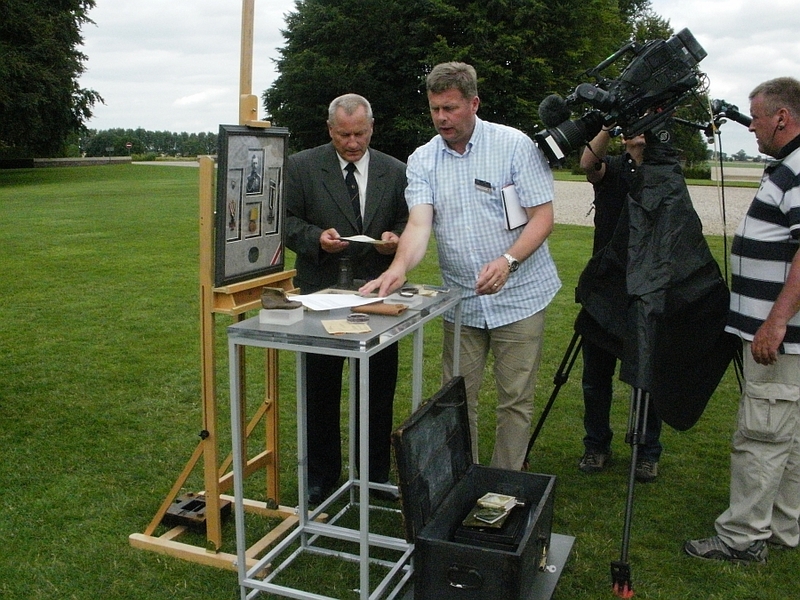 Another one taken by Egbert shows the filming with the Memorial to the missing behind them. One story filmed and it's on to the next. 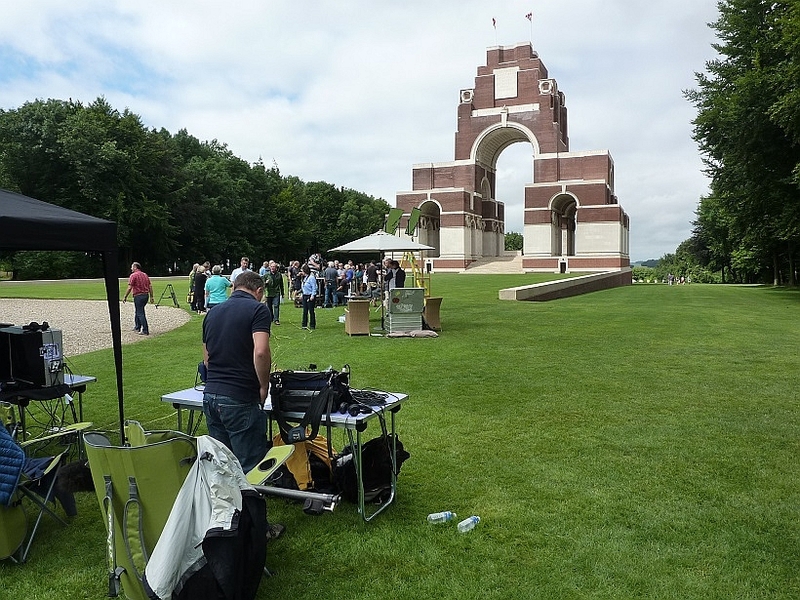 They also filmed parts of the show at other locations on the Somme, but most of the contributors stories where done here at the Thiepval Memorial. 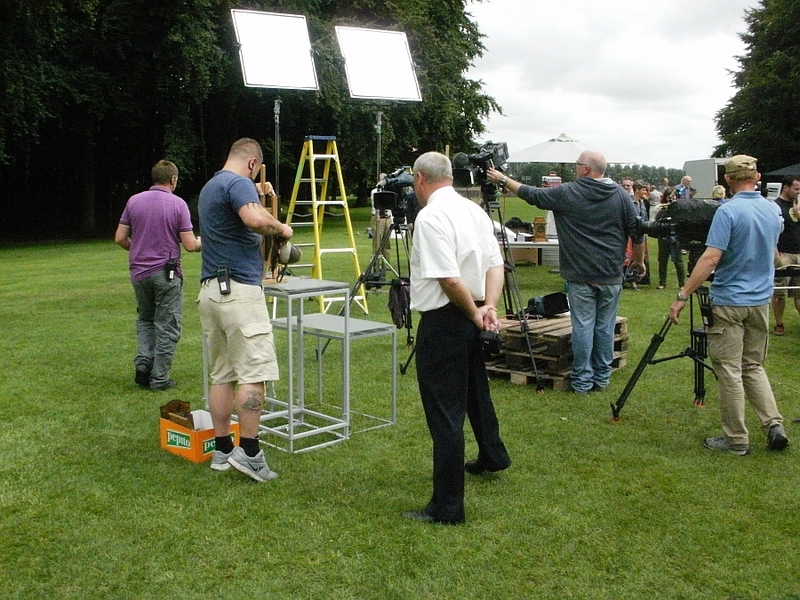 It had rained so much the day before that we wondered where they would film if it continued, but the rain had stayed off and by mid afternoon the sun was out blazing. 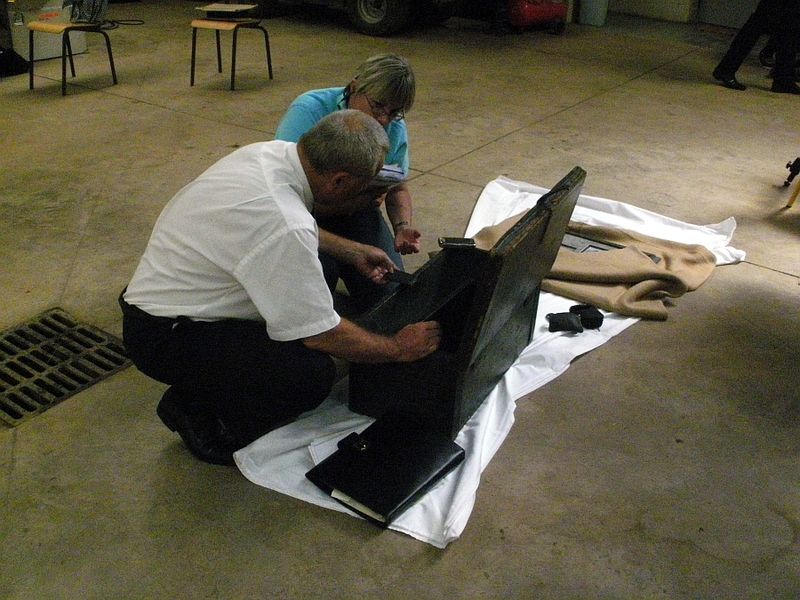 Sally from the production team goes through a few items from the trunk with Egbert before filming. 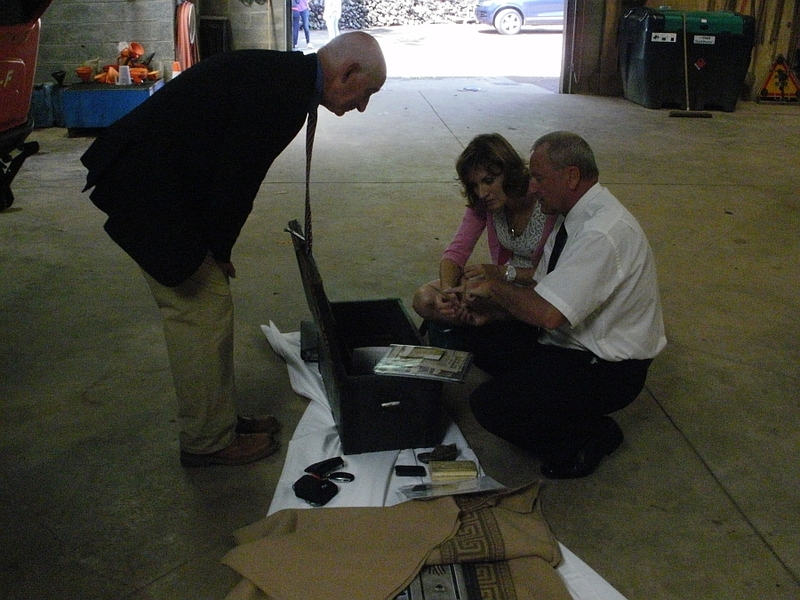 Paul Atterbury and Fiona Bruce look through a number of items from the trunk with Egbert. 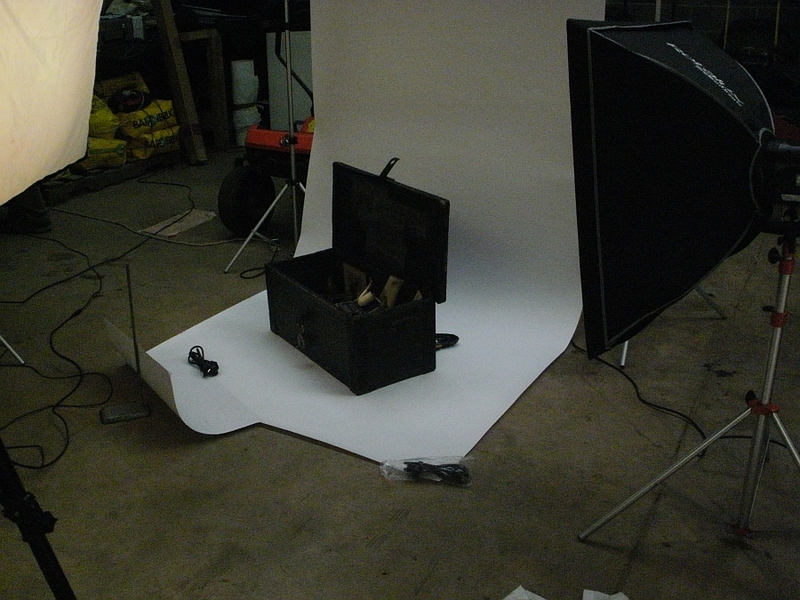 The trunk being photographed. It along with items from the other contributors will appear in a book about the WW1 special episodes to be written by Paul Atterbury. 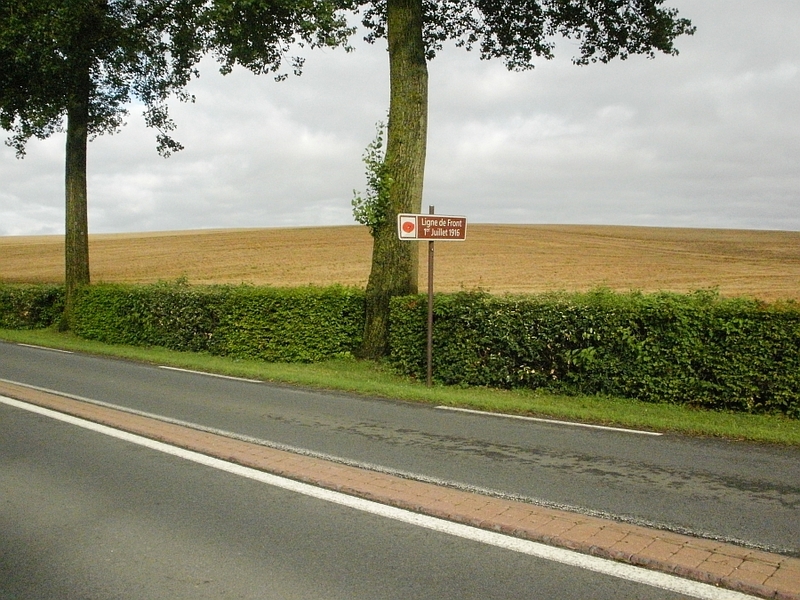 Egbert had told me about a path that leads away from the Thiepval Memorial out into the countryside towards the former German strong point " Leipzig Redoubt " Known to the German's as " Granatloch " This was a formidable defence system that gave the German's clear views of the surrounding area. As Egbert was busy going through items and his story for the interview, I decided to go and explore the site. The track leading away from the memorial. 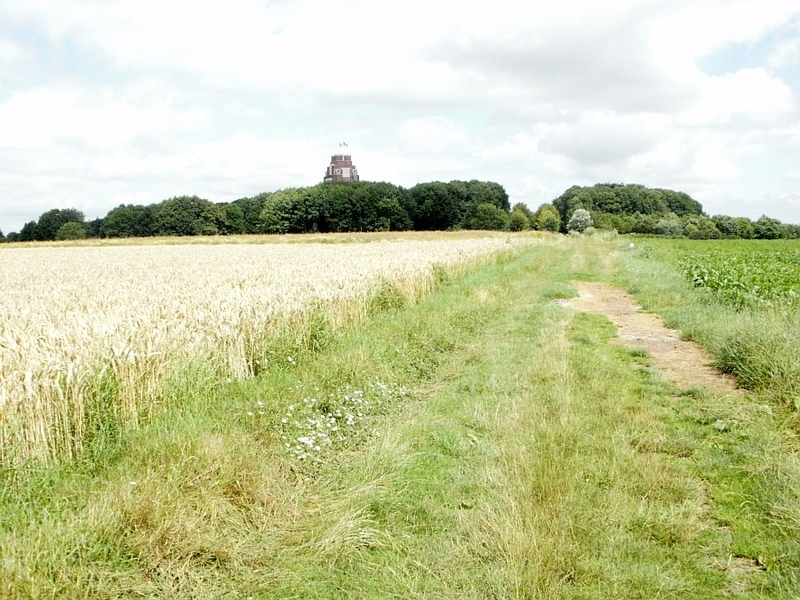 The wooded area ahead was the site of the Leipzig Redoubt. 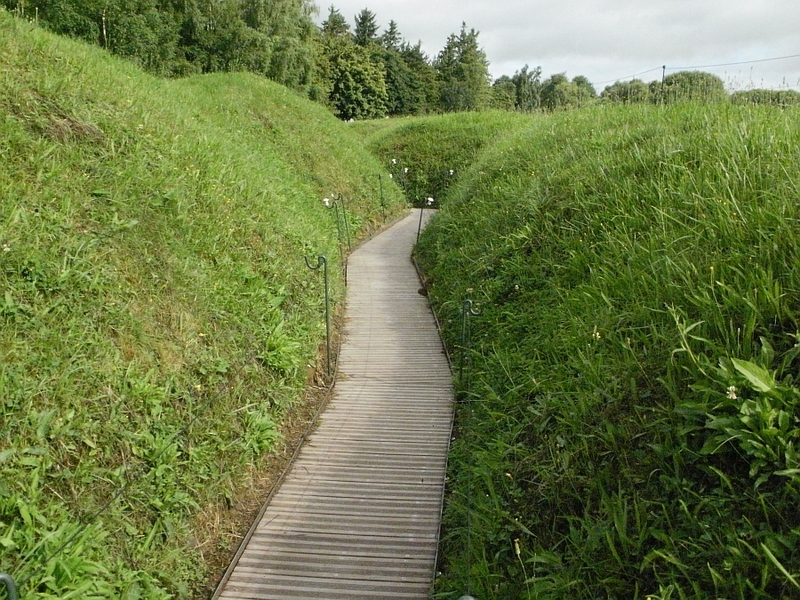 The walk towards the trees and beyond was the once filled with German support and Communication trenches. 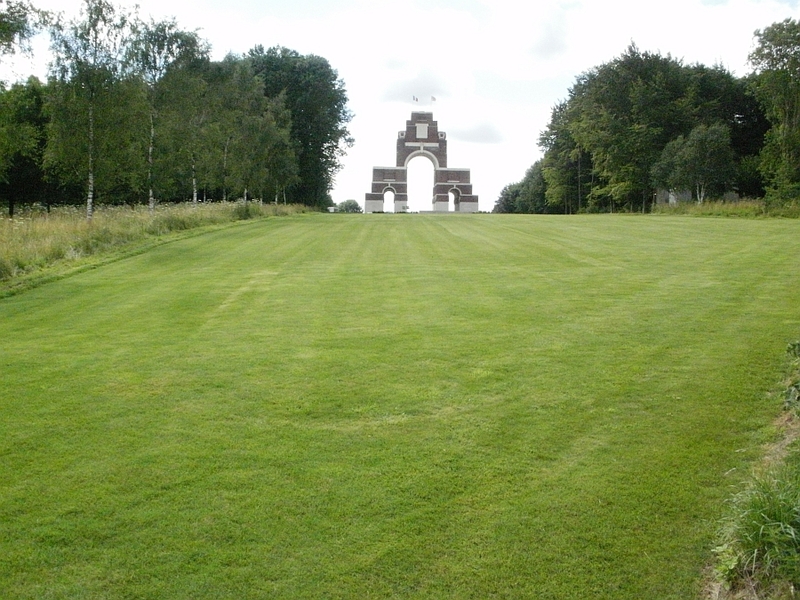 Looking back we can see the Thiepval Memorial climbing over the trees. 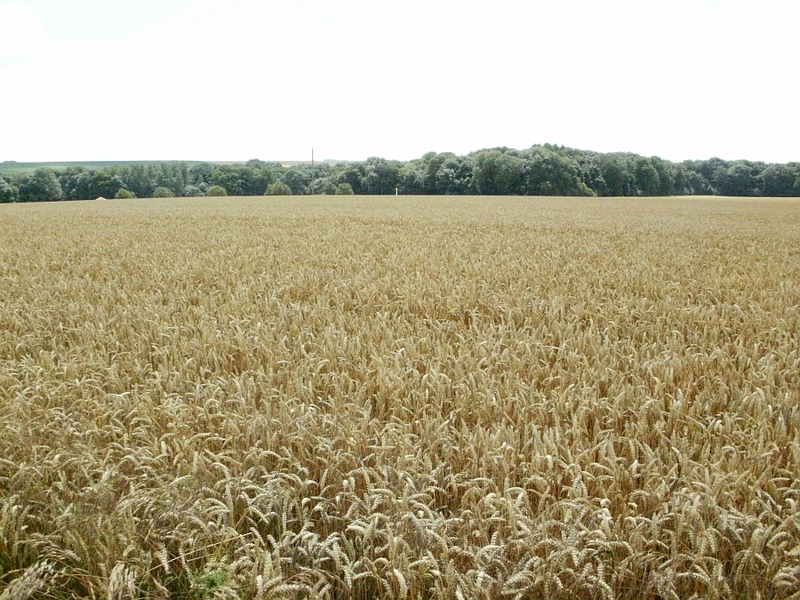 This area was where the Leipzig Redoubt ( Granatloch ) once stood. I was told if you pull back some of the shrubs/branches, then you can still see parts of the defences. As it had rained heavy the day before and I had to be back at the filming not covered in mud, I decided not to venture into the wooded areas. 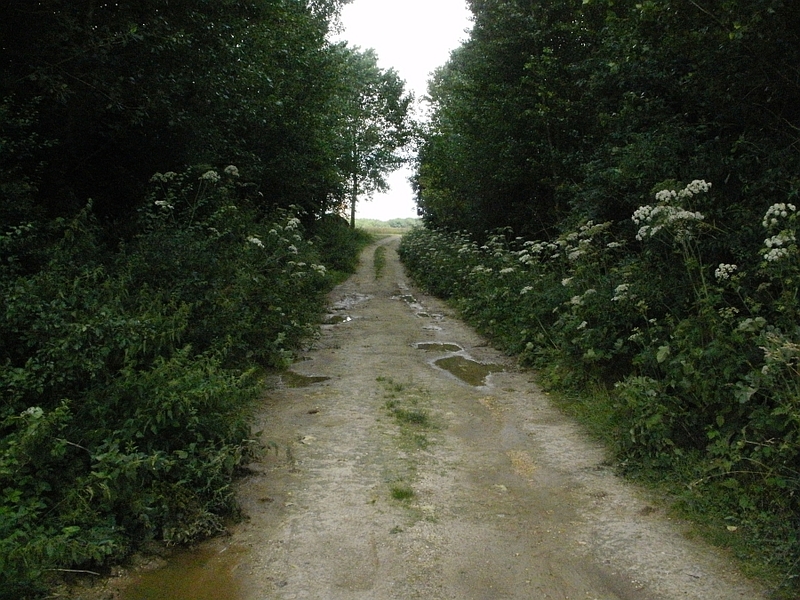 I continued through the woods along the path until I came to the Crossroads on the Authuille road. 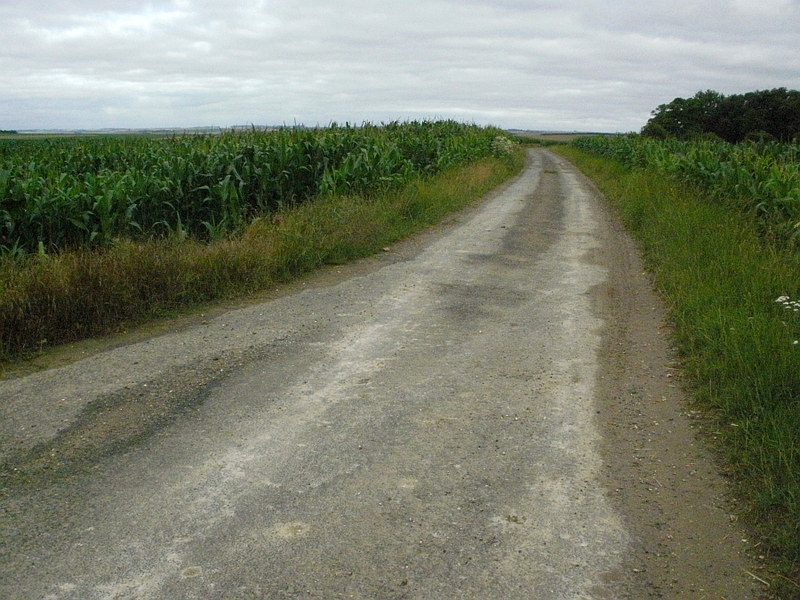 Looking left from the crossroads along the Authuille road. 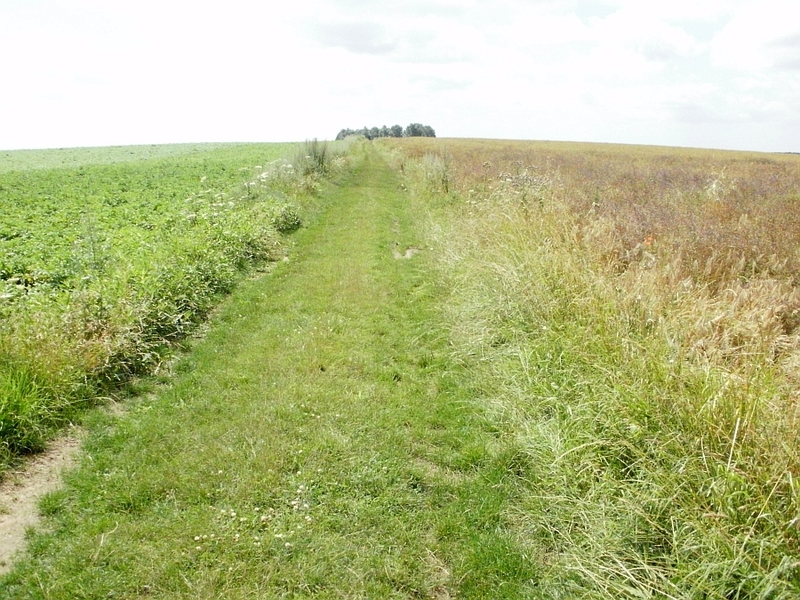 Look at the lay of the land, the German's had built their defences on top of a ridge, their front line ran along the path to the right of the photo. 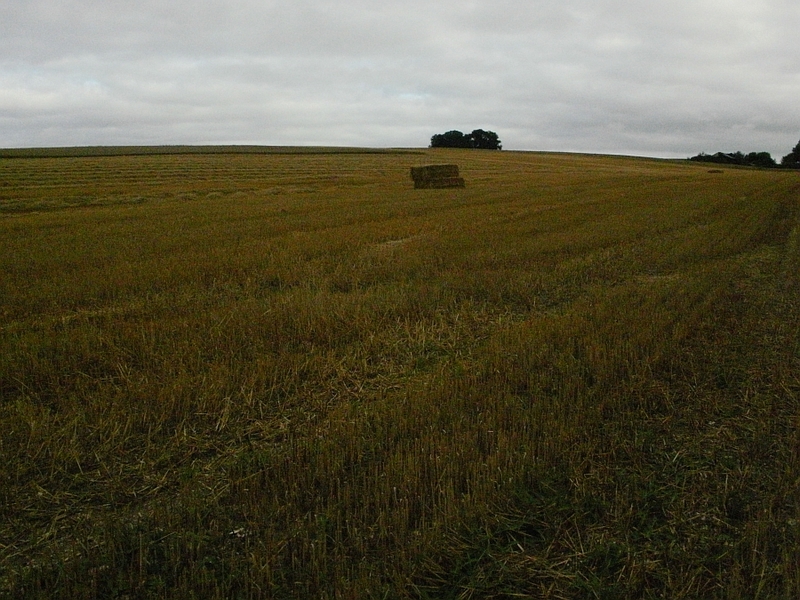 Can you make out the white item at the foot of the crops to the left of the picture? 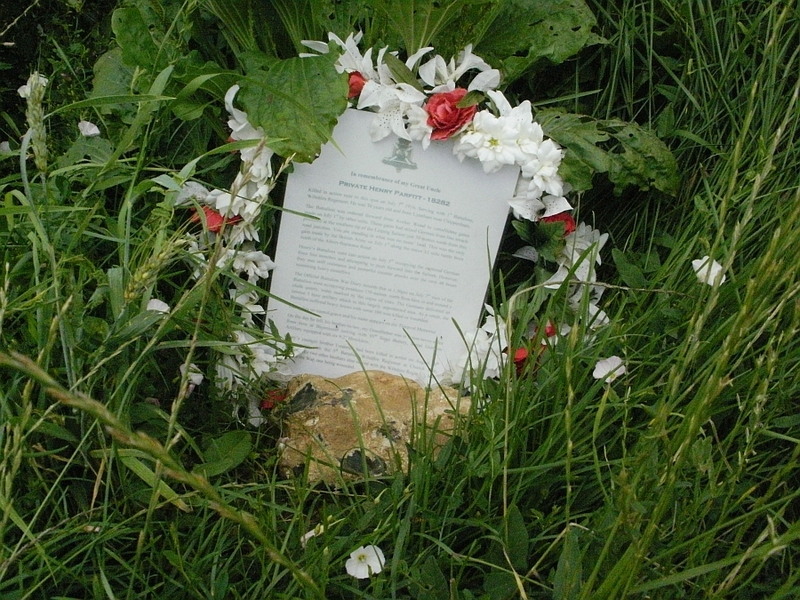 in the photo below you can see it is a tribute message with flowers to Private Henry Parfitt, 18282 of the Wiltshire Regiment. He died in action near to this spot on 7 July 1916 aged 30, while serving in this area and is remembered on the Thiepval Memorial. The tribute was left by a family member and I found it very moving. 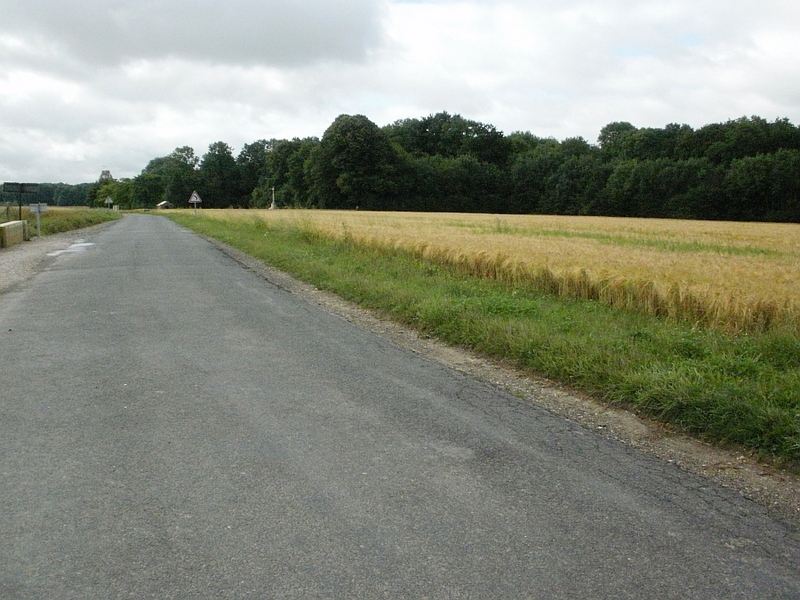 Looking right from the crossroads towards the village of Authuille. Looking straight ahead over the Authuille road. 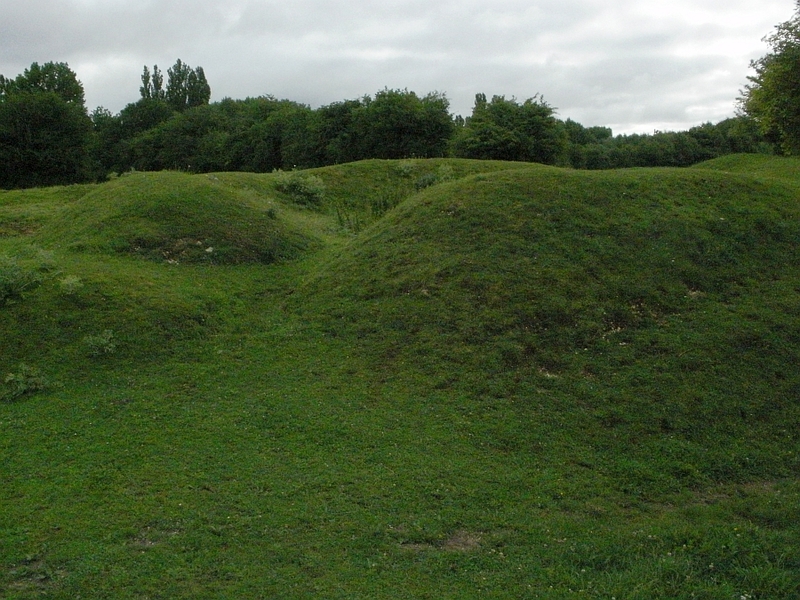 This was the site of Front Line German trenches, the allies attacked from the fields in the distance. Once again we find ourselves in No mans land. Notice the pole, it could be part of rubble from a German Bunker? We see the pole/post again. Did it once hold barbed wire? 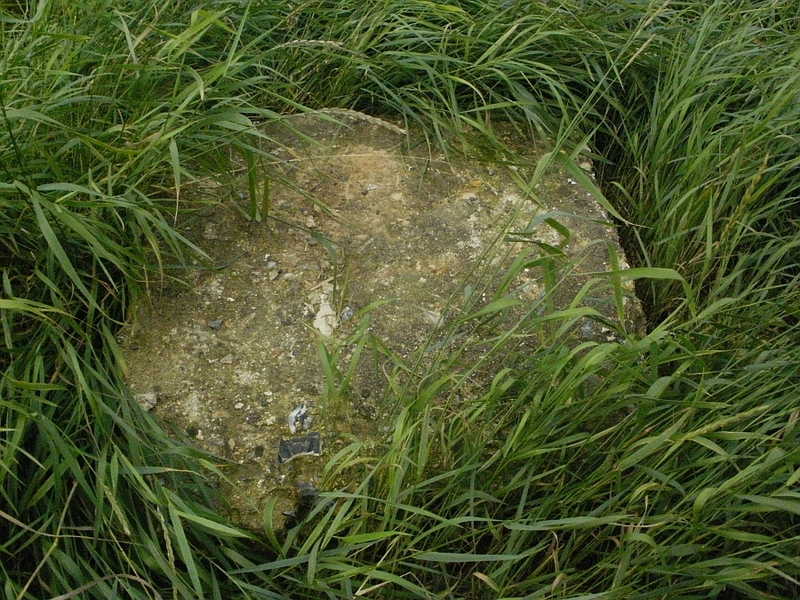 The stone below was very thick concrete, was it a reinforced roof? 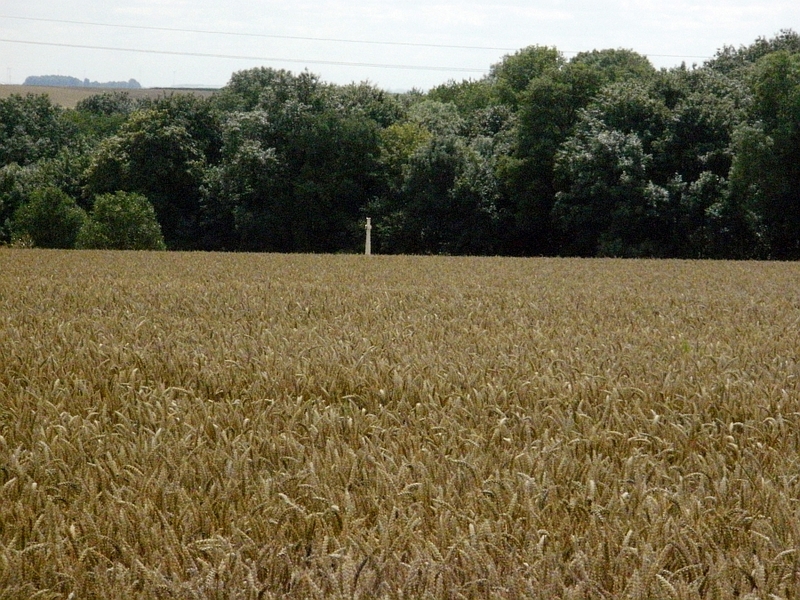 Another look at the pole/concrete with the trees of the Leipzig Redoubt to the rear. This place is so scenic, so beautiful, so peaceful, the first thing you notice is the silence, nothing to be heard apart from the odd twitter of the birds, nothing to see but fields and trees. But notice the cross, it is the Cross of Sacrifice from Lonesdale Cemetery, it stands as a stark reminder to the fierce fighting that took place here. These are the battlegrounds, they ran with the blood and suffering of men from all sides. As you stand here it is hard to believe that in 1916 this was a horrific place of madness. God bless all who served here. Taken from the Authuille road. 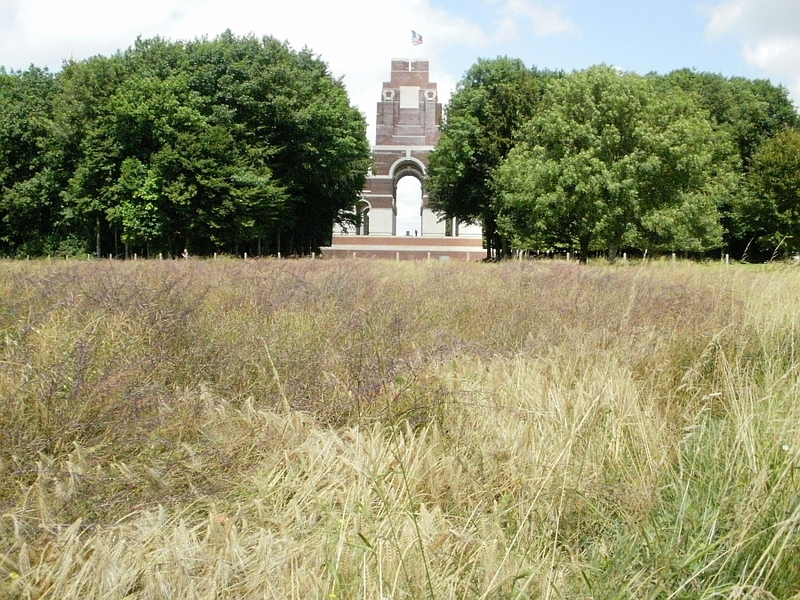 The trees around the former site of the Leipzig Redoubt can be seen, as can the Thiepval Memorial over the trees at Thiepval. 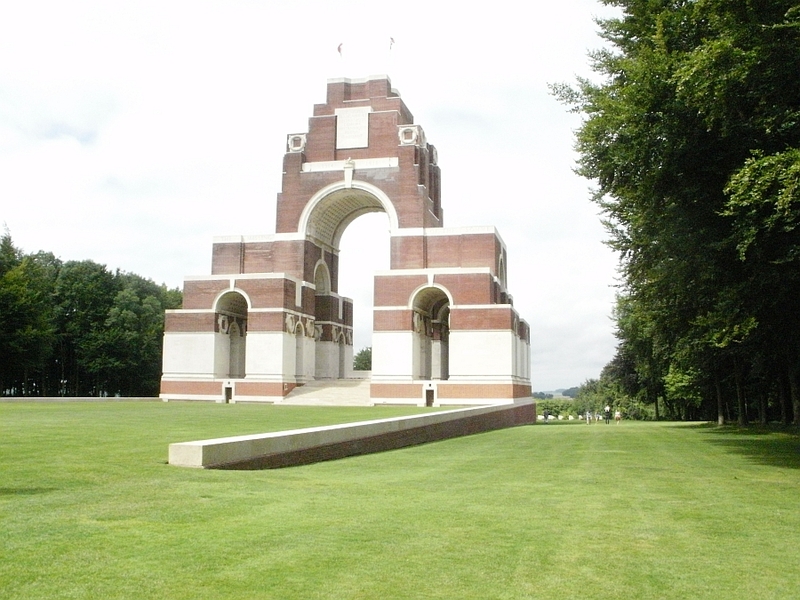 On the way back, and the Thiepval Memorial can be seen through the trees. The above map shows how close the places we visited are. You can see Mouquet Farm, Ulster Tower ( Schwaben Redoubt ) Thiepval Memorial, Leipzig Redoubt ( Granatloch ) Poziers and Newfoundland Park. 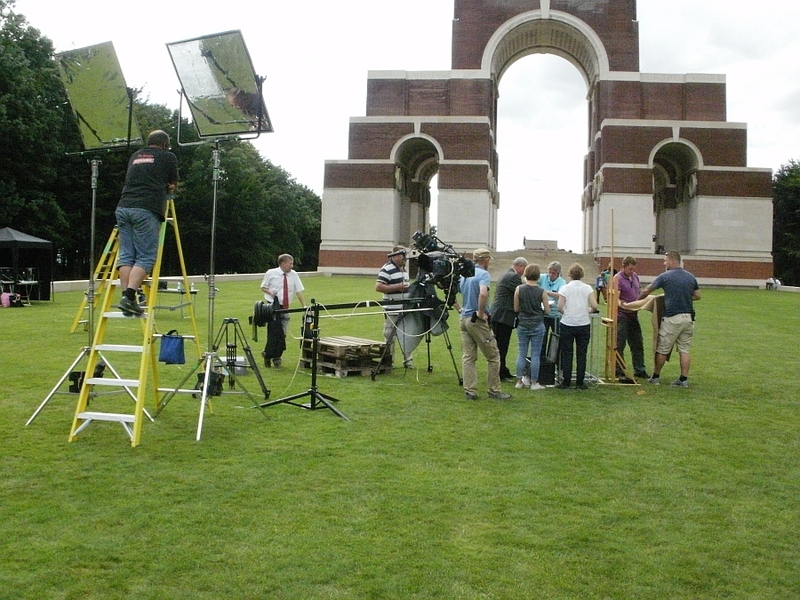 I returned back to Thiepval in time for the filming.Decisions!!! Decisions!!! Series editor, producer, presenter, Egbert and assistant producer deciding the best way to present the items for filming. Egbert and Fiona during the setting up of the items for filming. Fiona, Simon and Egbert. Filming is not far away from starting now. Egbert and producer Simon making the last touches before filming with Fiona begins. I had hoped to take a few pictures of Egbert during his interview with Fiona, but they asked me if I would stand behind Egbert during the filming, so I brushed up on my interested bystander acting skills. Egbert did a wonderful interview and I felt privileged to be standing behind him and able to listen to it. At one time he read out two letters and it was noticeable that a number of the crowd gathered were moved to tears. But Hey! you will need to watch it to get the story, no more clues from me. Fiona and Egbert during the filming. 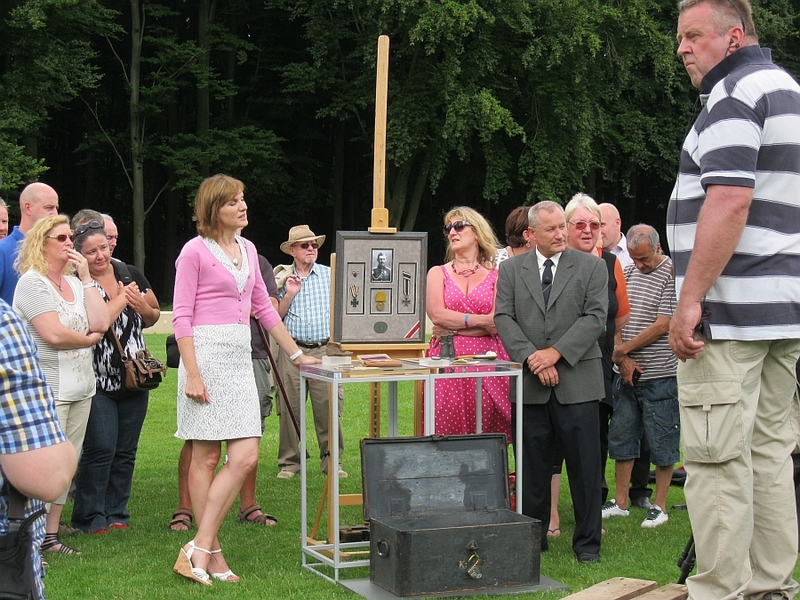 The guy on the right with the striped top is part of the crew, he is not really 10 feet tall, he is standing on a box. Myself and Egbert after his story had been told and filmed. I really must learn to breath in with that belly of mine. With his interview over Egbert packs the items back into the trunk. The team still have a few more contributors still to film yet. After recording his interview and packing away the trunk Egbert had to drive back to Germany, I said my goodbyes to him at the Thiepval Memorial. I certainly hope that we meet again one day as I count him as a close friend. I returned to the hotel before heading into Albert for the evening, I still had places to visit. 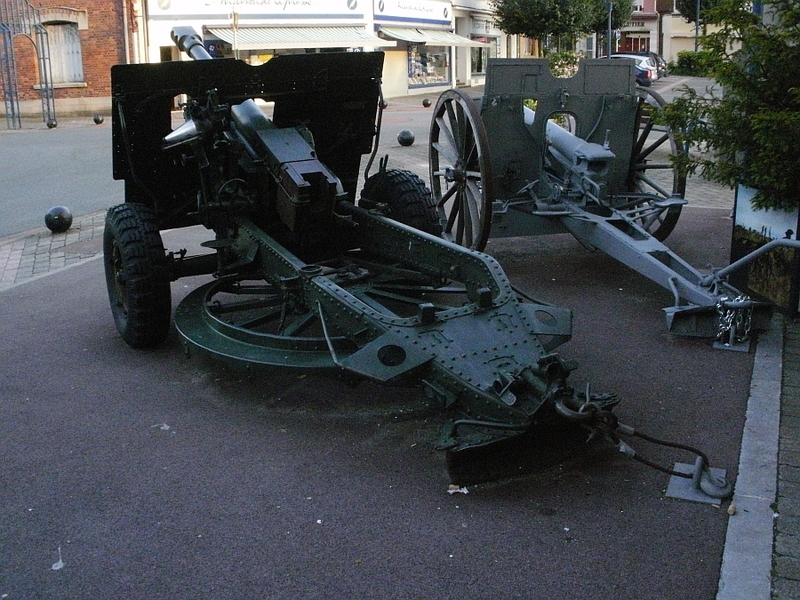 Albert was one of the main towns in the Somme area for the allies during WW1, basically it was a garrison. 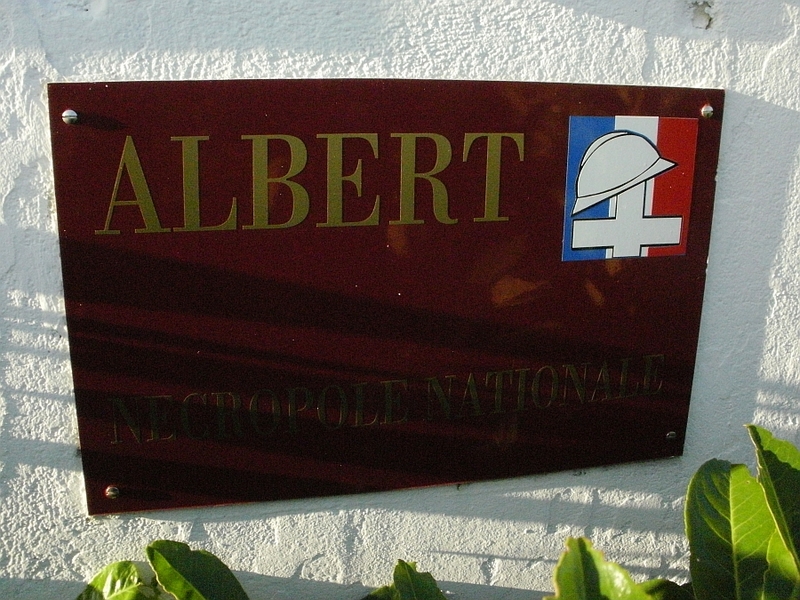 It was around 3 miles to the front line trenches from Albert, making it a target for German Artillery. The Allies kept hold of Albert all through the war until March 1918 when the German's launched their Spring offensive, taking Albert in the process, the Allies took it back four months later as they pushed back. The Town was almost completely destroyed during the war and had to be rebuilt. Today it is a quiet laid back place, but the reminders of war are still to be seen. The Basilica of Notre-Dame de Brebieres, Albert. The Golden Virgin can be seen at it's tip holding out baby Jesus. The Basilica could be seen for miles and was a target for enemy shell fire. In January 1915 during hits to the Basilica, the Golden Virgin fell and hung dangerously above the streets below. The French knew the importance of the statue and quickly climbed up and secured it in position. To the soldiers on all sides the leaning Golden Virgin became something of a superstition. The German's believed that whoever knocked down the statue would also loose the war, the British beliefs were something along the lines of the war would end when it fell. It must have been an incredible sight for the fighting men to see. It stayed there until 1918 when the German's launched there Spring offensive and took Albert. The British shelled the town and the Golden Virgin fell. After the war the Basilica was rebuilt, but no sign of the Golden Virgin was found in the rubble. A new statue was made and this now stands on top of the Basilica and can be see from miles around. I was told a story about the statue, whether true or not it is a wonderful tale. It goes...... When the Basilica had been rebuilt and the statue of the Golden Virgin had been remade, a ceremony was held in the square outside the Basilica for the erecting of the statue. The Golden Virgin was brought into the square on the back of a cart and a workman got to work unwinding her from the cart and onto the hoist to take her up to the top of the Basilica. As he unwinded she of course leaned forward and many present at the ceremony took this as an act of God, falling to their knees in prayer. Of course it was not an act of God but just the workman moving the statue from the cart. Two photographs of the Basilica from WW1. Above we see the Golden Virgin holding out baby Jesus, it is incredible that the statue has not fallen, hanging on by a thread sums it up. Below the scene of destruction from the air, the Basilica is in a pretty bad state. One of Egbert's photographs of the Basilica showing that it can be seen from far out in the surrounding countryside. If the sun is shining you can see the sparkle coming from the Golden Virgin statue from a fair distance away. 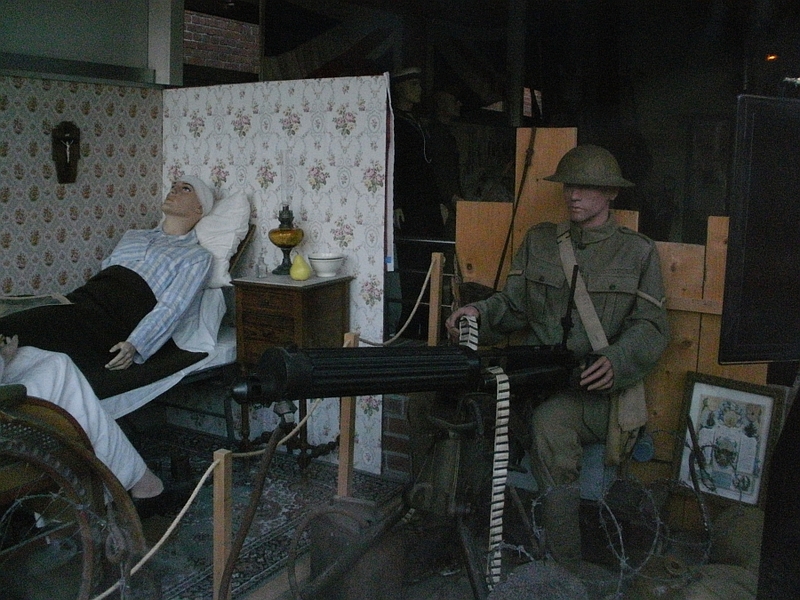 Next to the Basilica is the 1916 Somme Museum. It was closed by the time I got here, but I am informed it is very good in here. I took these two photos through the window. 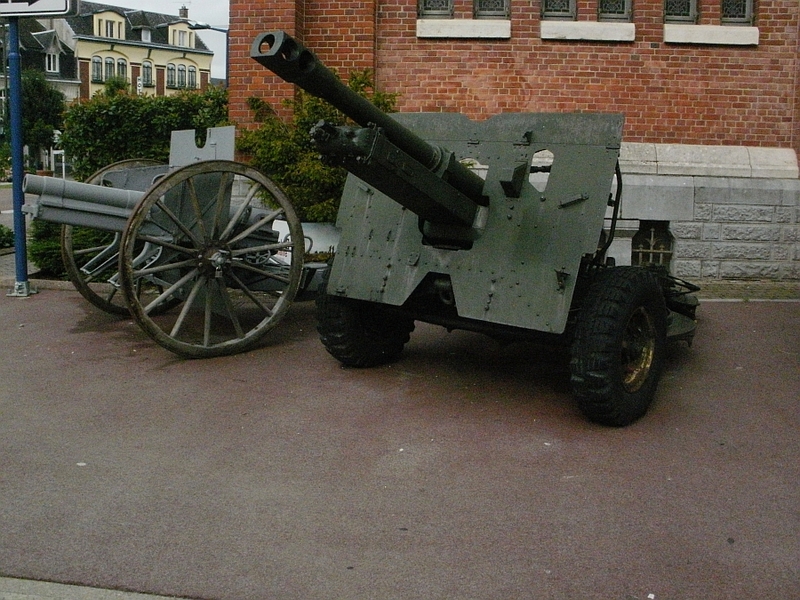 Next to the Basilica and outside the 1916 Somme Museum you will find these guns. 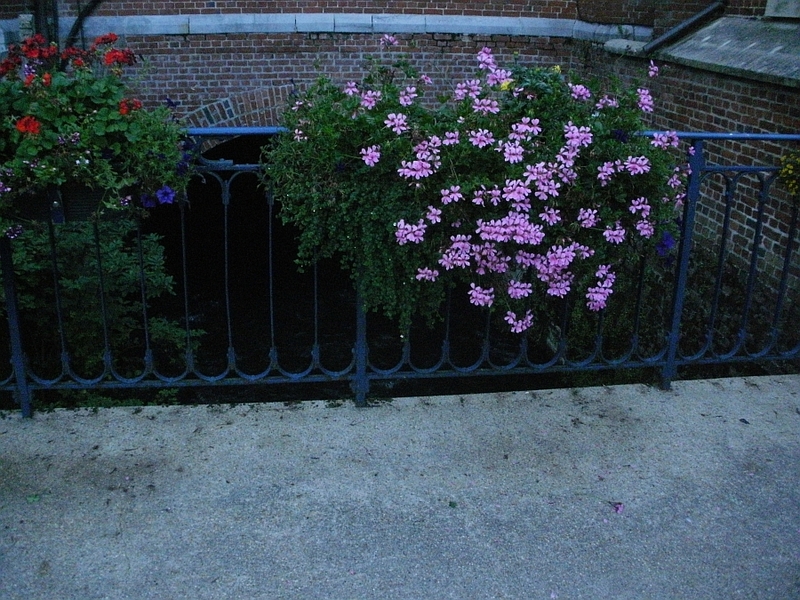 To the rear of the Basilica you hear running water, when you explore you find the River Ancre running underneath the Basilica through an arched tunnel. 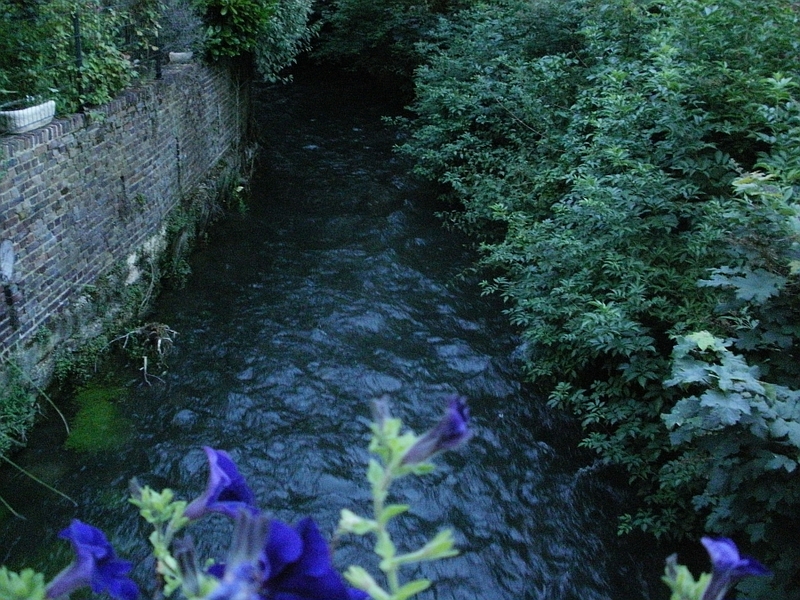 The river has a real fast flow to it. 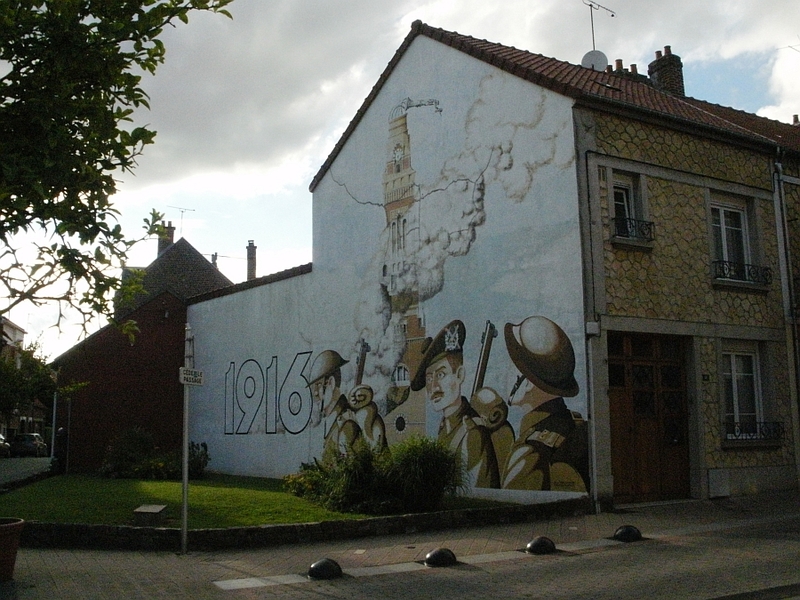 The side wall of a house in Albert showing a painted scene from 1916 with the bombed ruins of the Basilica of Notre-Dame de Brebieres in the background. The Golden Virgin on the Basilica can be seen above the house roof. 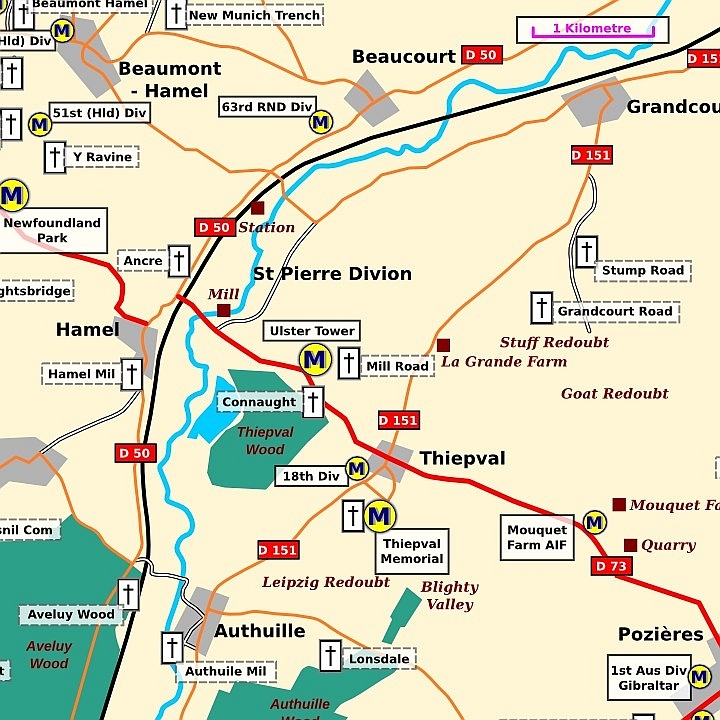 I had spotted two cemeteries on the map of Albert and now I headed off to find them, of course being me I soon got lost and was wondering what direction to take when I spotted a French lady and her daughter outside their house. After trying to ask for directions with my no French and their no English we all fell about laughing, but after lots of pointing the way out to me I soon found bearings. I would like to thank them for their kind help. 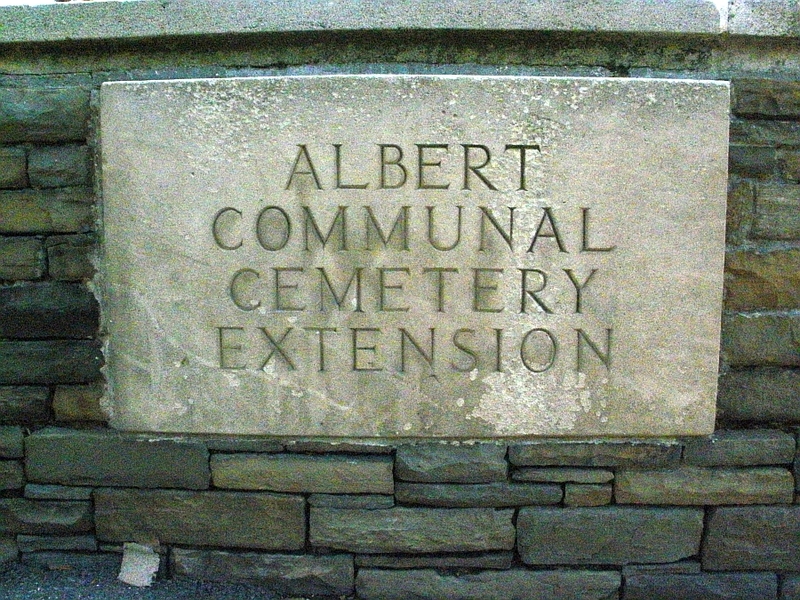 Albert Communal Cemetery Extension. 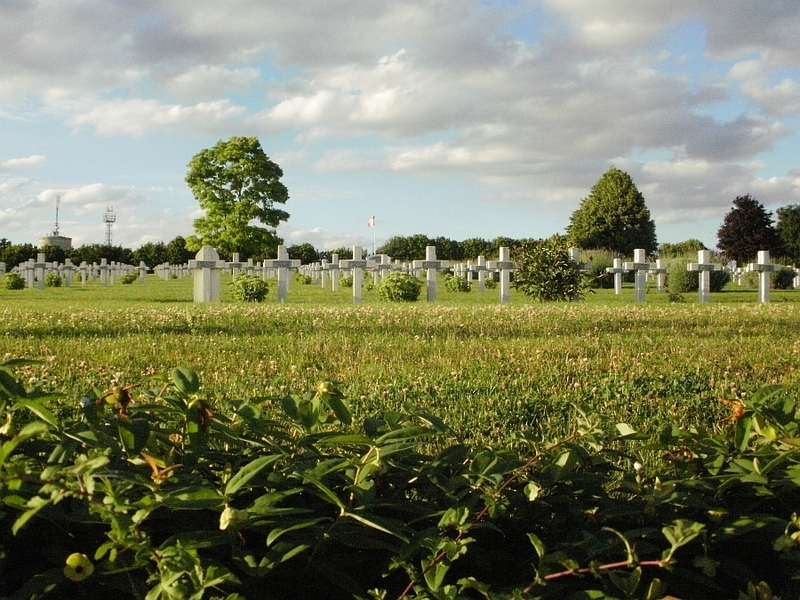 The cemetery is located within the local civilian cemetery. The Basilica can be seen peeking over the cemetery in the photo below. 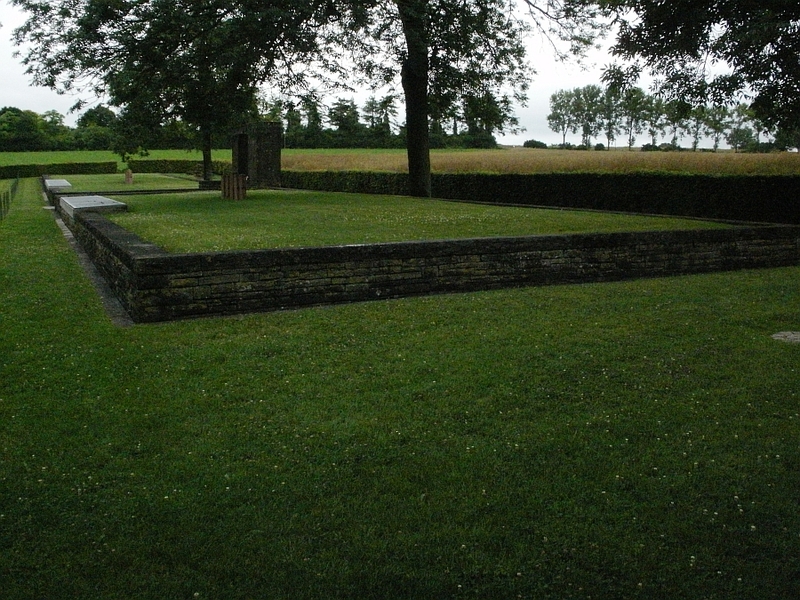 Notice the headstones that are almost joined together, these are small mass graves and the stones carry a number of names. They tend to be men from the same regiment who died together. These five headstones remember five men who were buried in this cemetery but had their graves destroyed by shellfire. Looking through the bushes into Albert Communal Cemetery Extension at the rows of headstones. This area is just outside and next too the war cemetery. 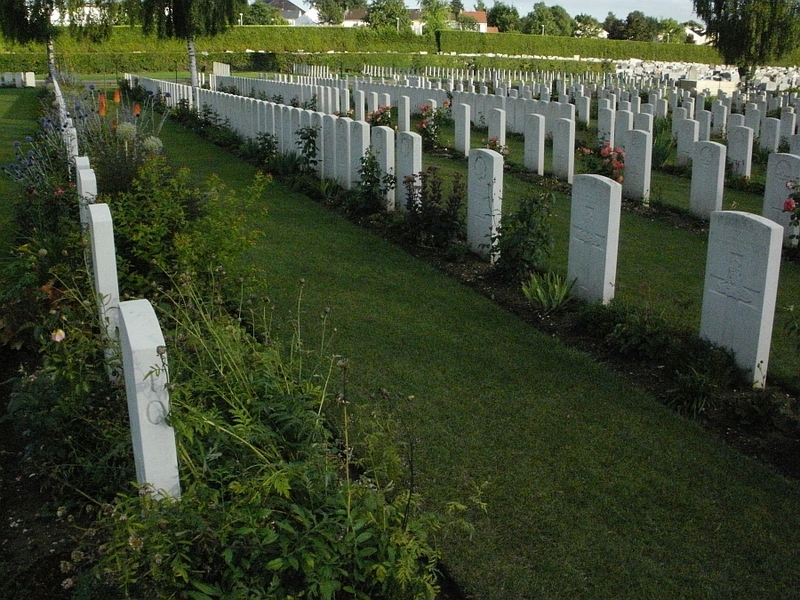 These are not war graves, they are the graves of local people, the headstones were blank and were used to mark a number of civilian graves. 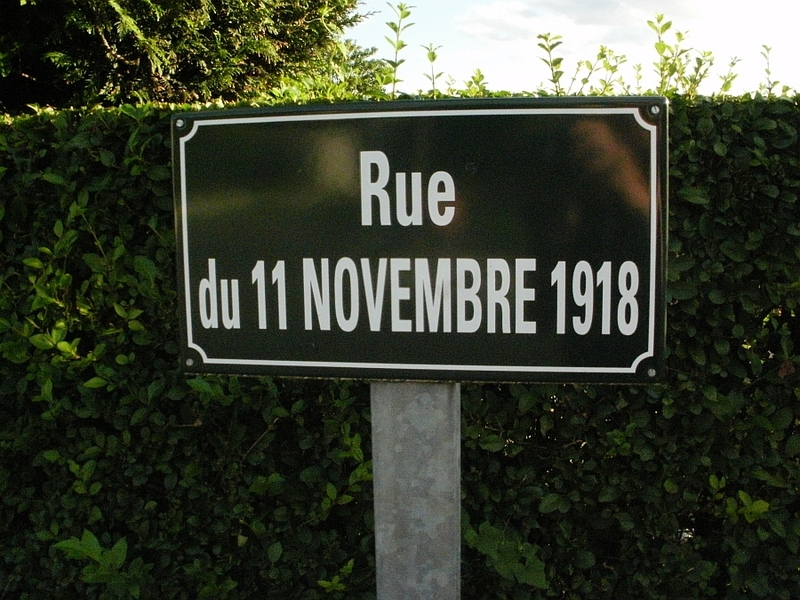 The two cemeteries both sit on the road named Rue Du 11 Novembre 1918, though they are a fair walking distance apart. It is nice to see the road named such a date. 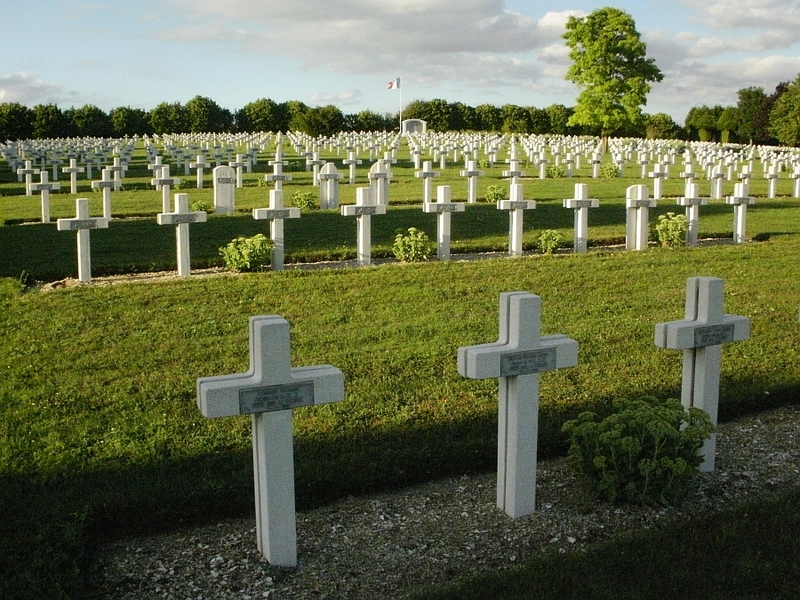 Albert French National Cemetery. 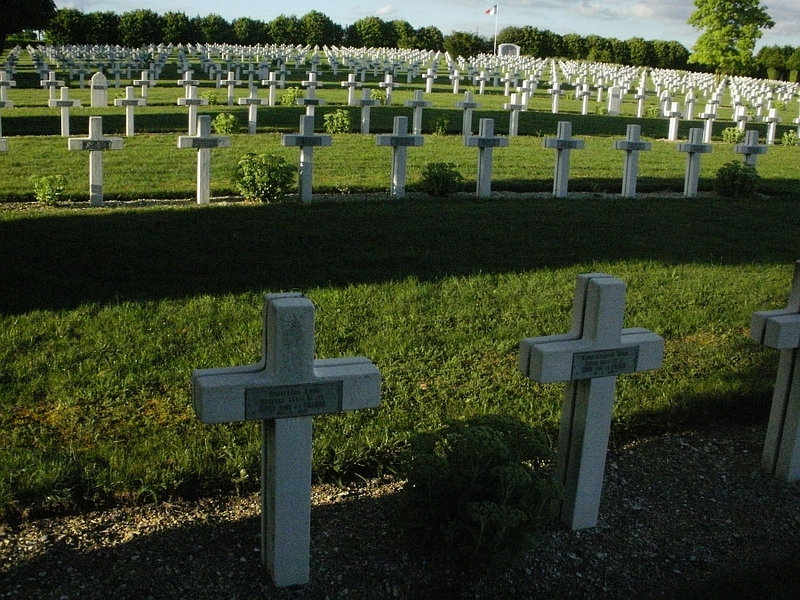 Over 6,000 Frenchmen from WW1 are buried and remembered here. Looking through the gates we can see row upon row of crosses. Below is the sign for the cemetery. Sign Pillars at Albert French National Cemetery. Looking into the cemetery we see the crosses stretching right the way back, row upon row. They seem to go on forever, it is hard to take in the number of headstones that you see. This is the cost of war. Notice how the crosses sit back to back. 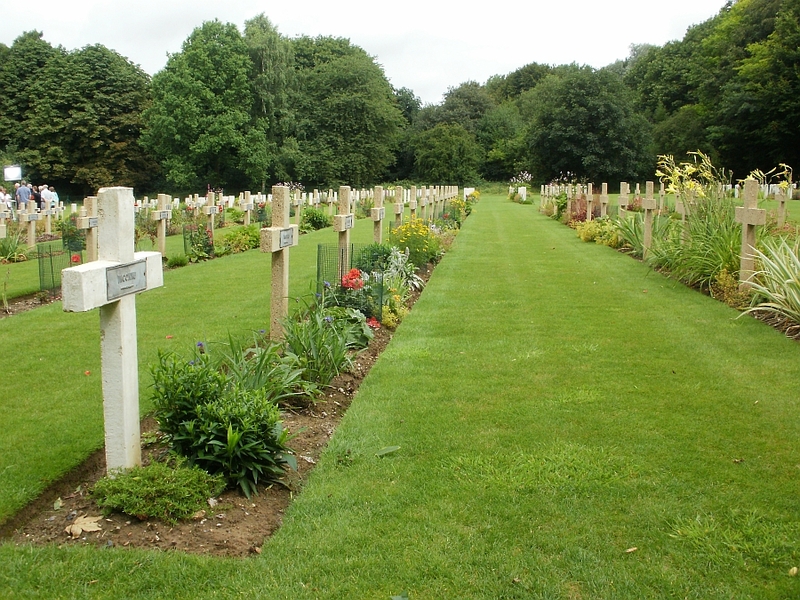 The cemetery is well maintained and is a peaceful place to remember the men who rest here. 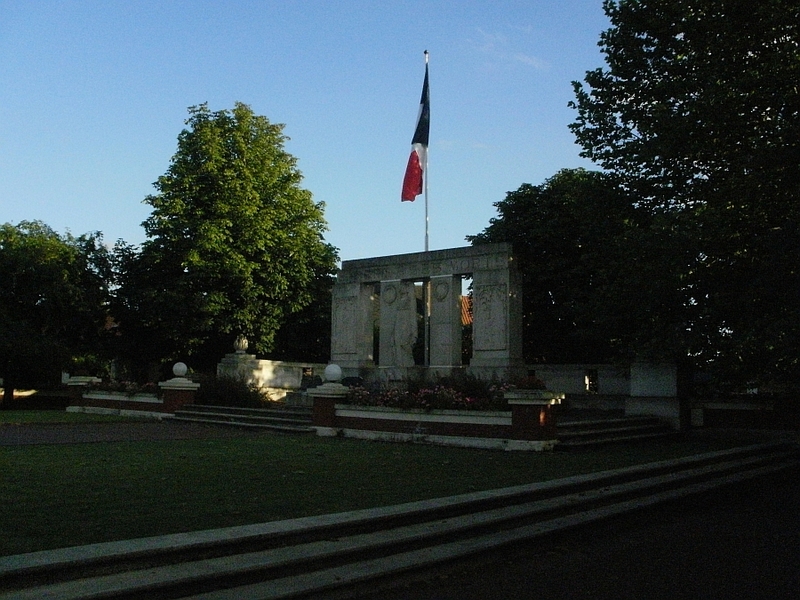 The French Tricolore flag flies at the rear of the cemetery in their honour. 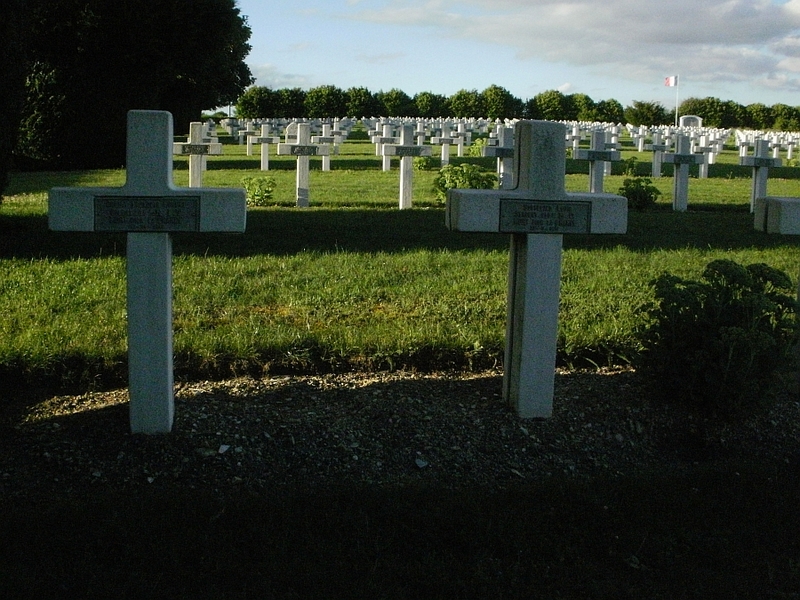 Also to the rear are 4 mass graves that containing 0ver 3,000 Frenchmen, panels list their names. 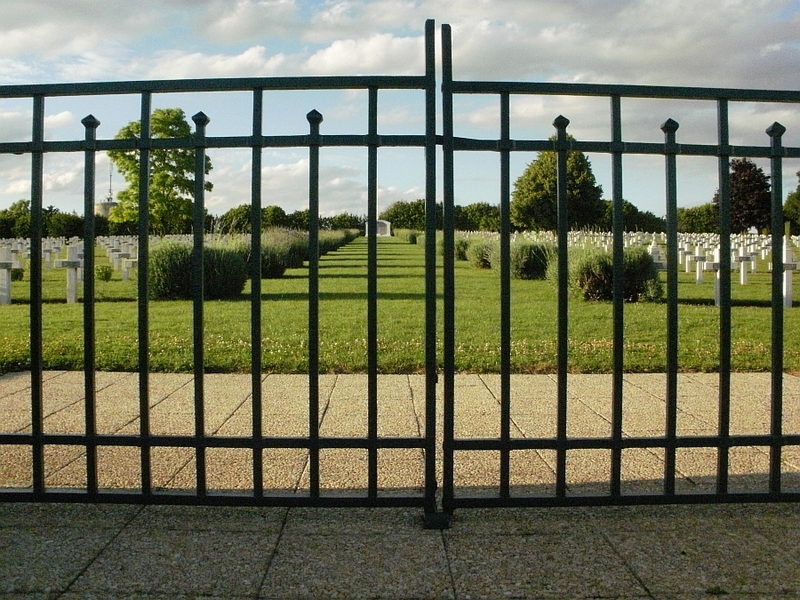 3,175 graves are listed in the cemetery, adding the mass graves takes the total past 6,000. One of the graves is a commonwealth grave, a Chinese Labour Corps soldier named Wing Yuk Shan who died a few weeks after the war had ended in 1918. Rest in Peace all. On the walk back into the centre of Albert I found this French War Memorial. I could not see any signs for what wars it covers ( I probably missed the sign ) But it did have small tablets in dedication to WW2. I would assume that it will cover both world wars. A memorial tablet that needs no explanation. 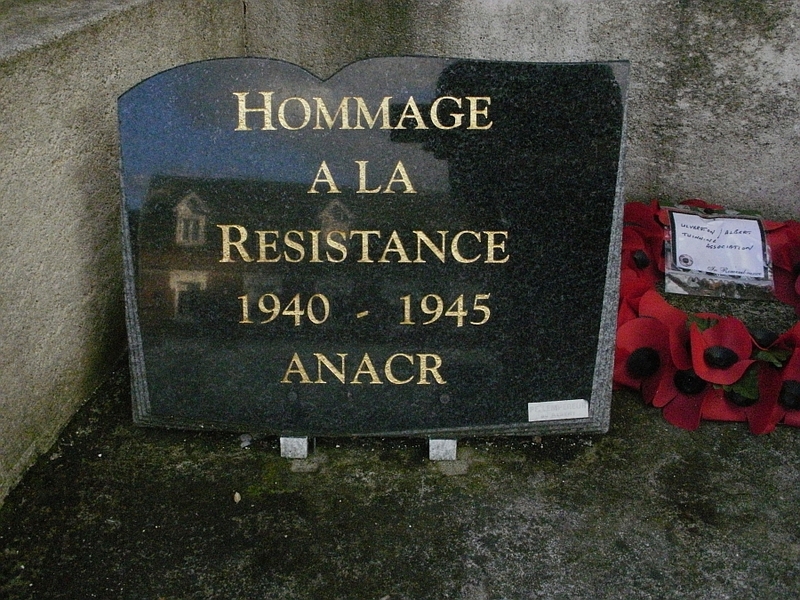 Remembrance for the resistance in WW2. 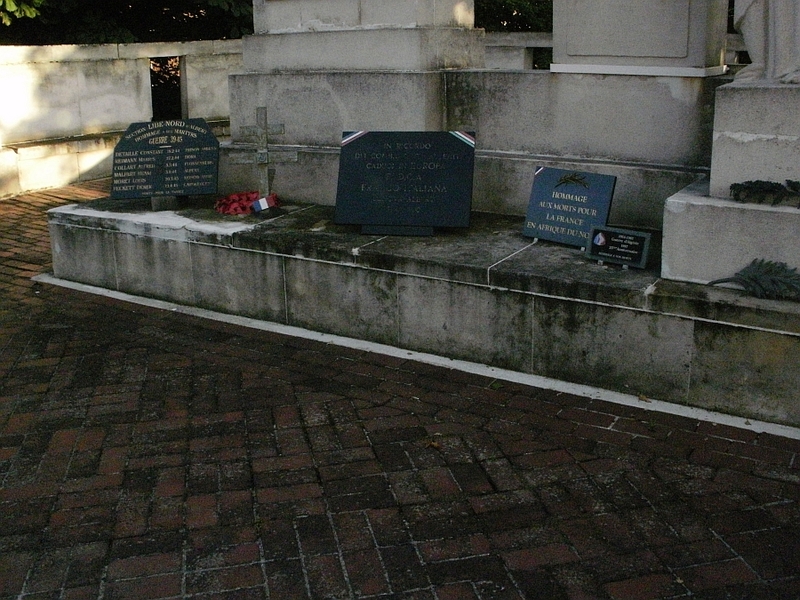 A number of tablets sit on the memorial, as far I could make out some are in dedication to the French dead in Africa and Europe, six Albert Martyrs, French civilian victims and French people who died in war camps during WW2. I returned to the hotel around 10pm, absolutely shattered from the long day, but very glad I had done it all. The next morning we were leaving early for the UK and I had a few people to say goodbye to before we left. I went and sat with the lads in Bapaume Post Military Cemetery for 20 minutes ( yes another visit ) These guys had touched me and I wanted to say goodbye to them. Then we were off on the journey back home. A few weeks before we filmed in France Egbert sadly lost his beloved dog Chester who had traveled the battlefields with him. The above photograph is from 2004 and shows Chester sitting in front of the Thiepval Memorial, almost in the spot where Egbert was filmed. Chester was even a fully fledged member of the Great War Forum. Rest in Peace Chester.